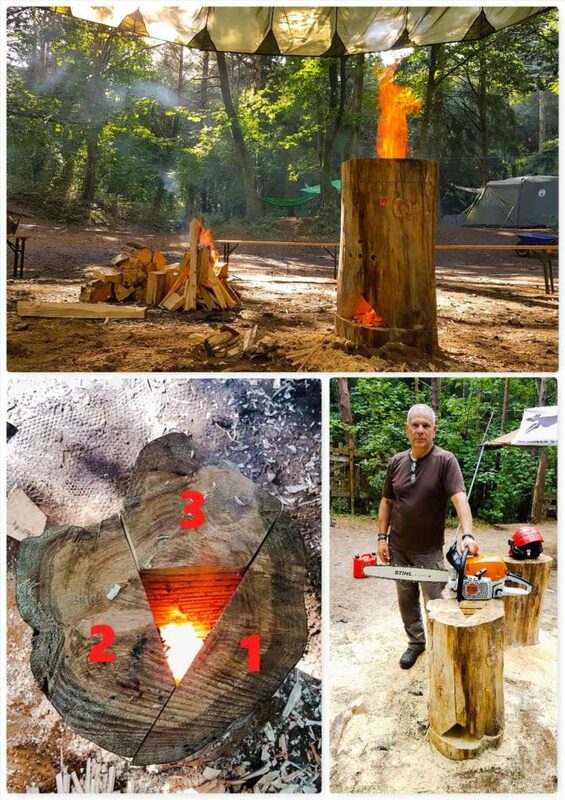 Over the last few years I have written a fair bit about carving Finnish Candles or Log Rockets using just the tools I would carry in my bergen (saws, knives, axes etc) so I thought it was time to see what could be done with a chainsaw. 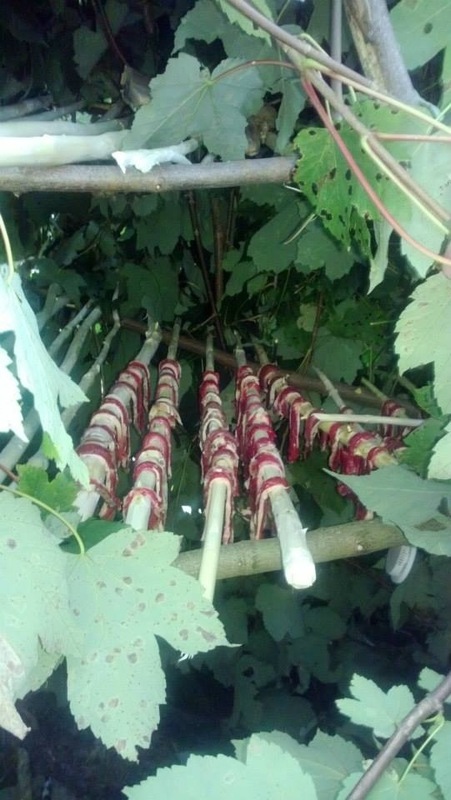 I decided to opt for the Log Rocket as I thought there has been plenty written about using Finnish Candles (referred to sometimes as Swedish Candles/Torches). 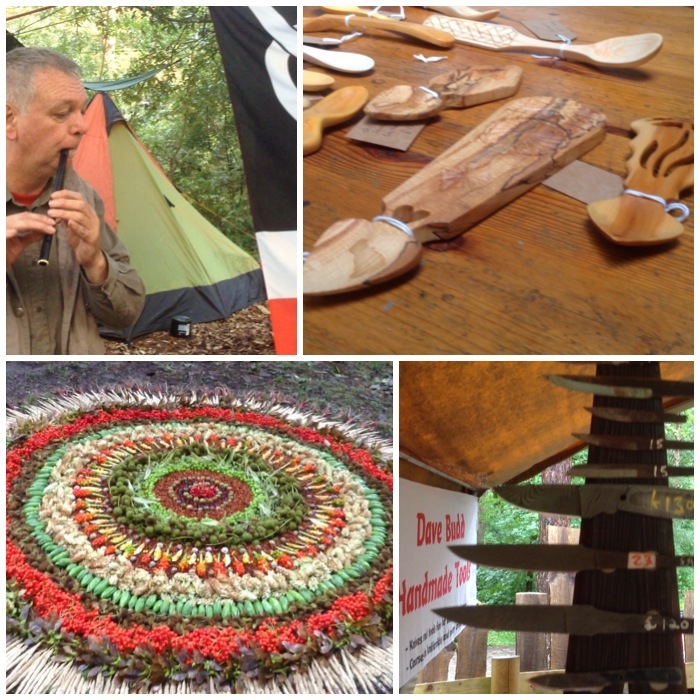 At the Bushcraft UK Bushmoot last year I asked my friend Rob Nash if he was willing to carve a large log rocket for me using his chainsaw. 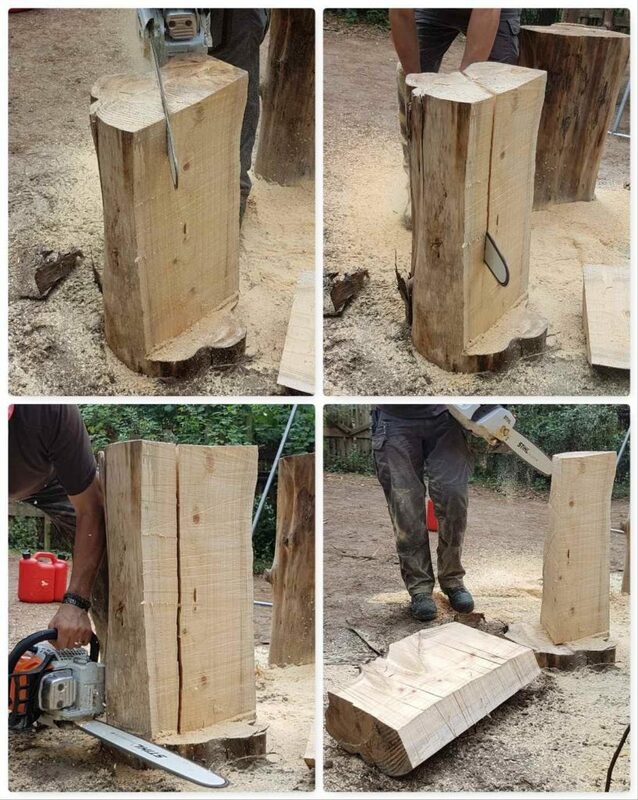 For those of you who just like to watch a short video on its construction here it is – for those of you who prefer detailed instructions there are loads of pictorial steps after the video below. 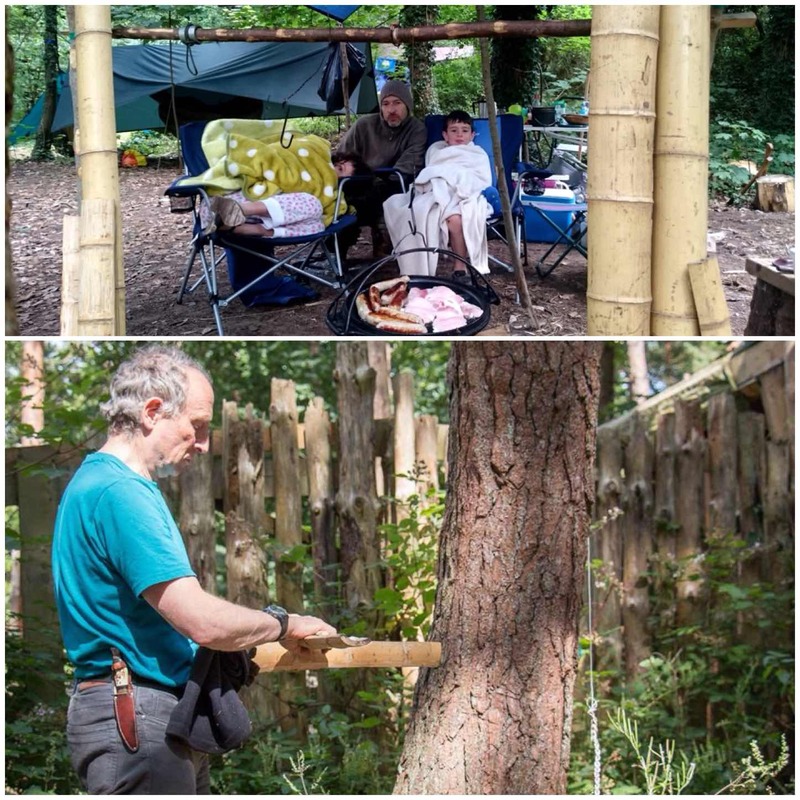 The log rocket worked spectacularly and you can get a sense of scale (forgot to measure it) from the picture of Rob standing next to it. I chose a large piece of piece of what I think was Spruce (hard to tell when there is no bark and it is seasoned). 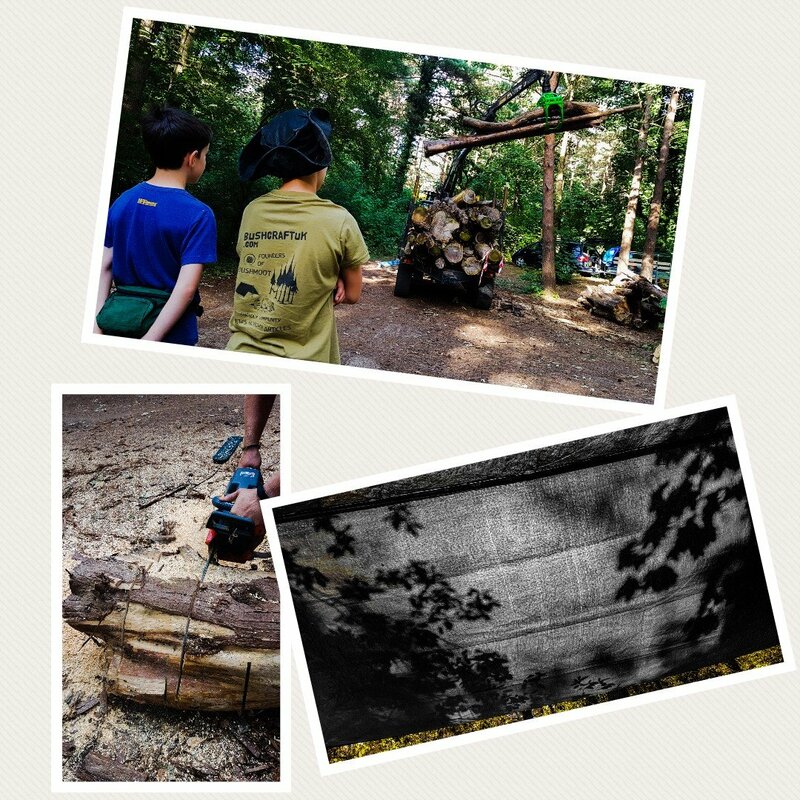 I will be referring to the 3 parts of the log rocket as you can see in the bottom left picture below. 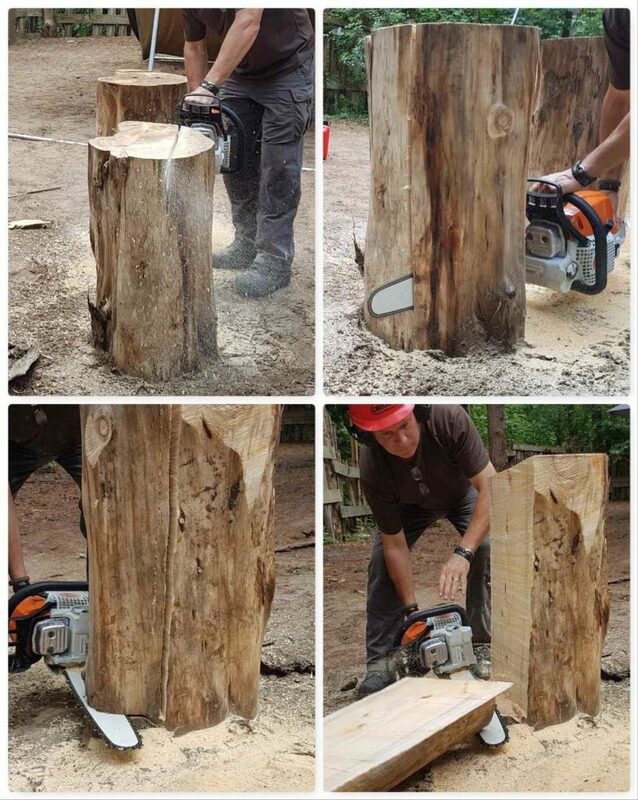 Rob took out a slice of the log (approx 1/3 of the log) and stopped the cut about 15 cms from the bottom. 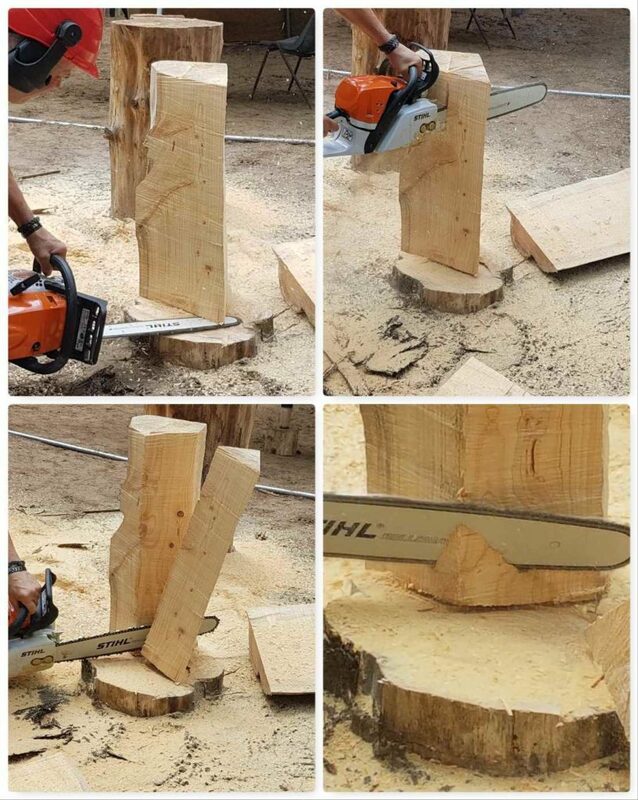 Then he cut in from the side at the bottom of the log to remove Section 1. 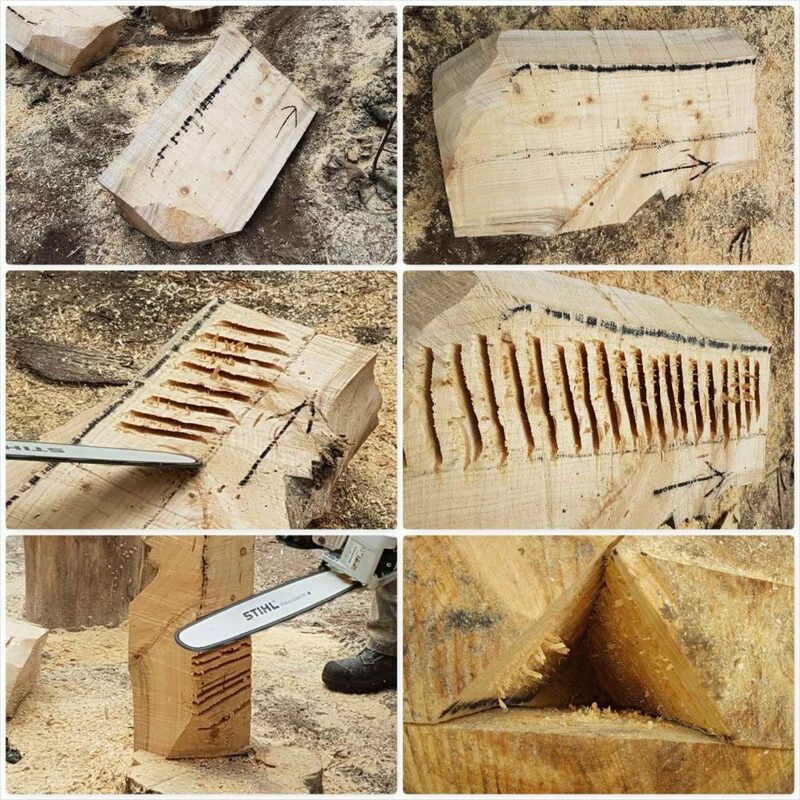 To describe this cut is quite difficult so refer to the picture above in which the pieces are numbered. The aim was to leave Section 3 with a point that could be removed to form the chimney. Again it was a case of cutting down to about 15 cms from the bottom and removing section 2 by cutting in from the side. You can clearly see the point left on Section 3. Rob made an undercut at the bottom first this time and then removed the ‘Point’. This is the area that would form the chimney. 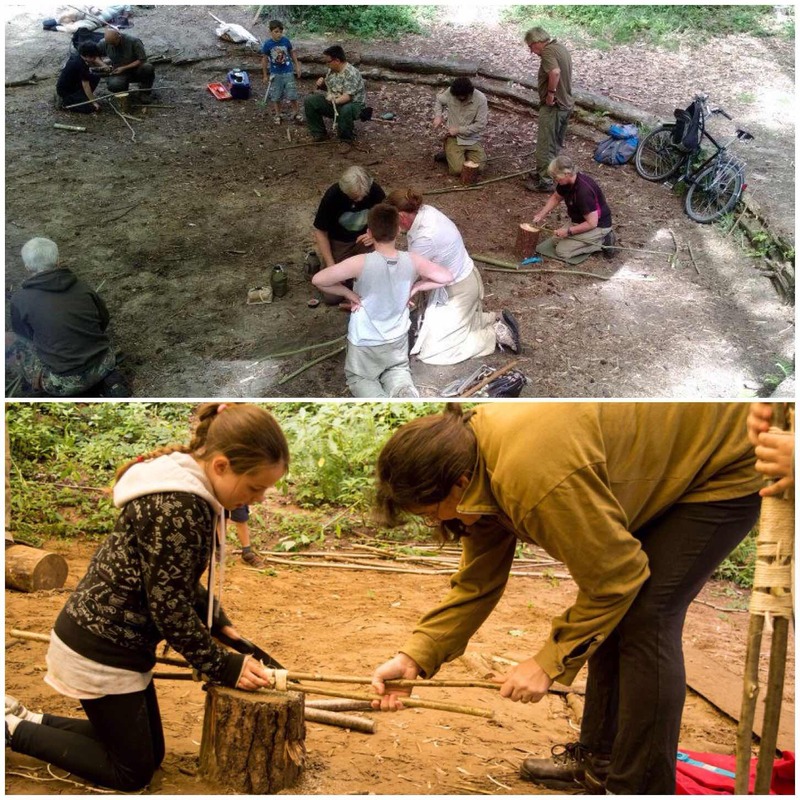 The triangular-shaped piece of wood from the centre point was split down further with an axe to form the kindling to get the log rocket going. 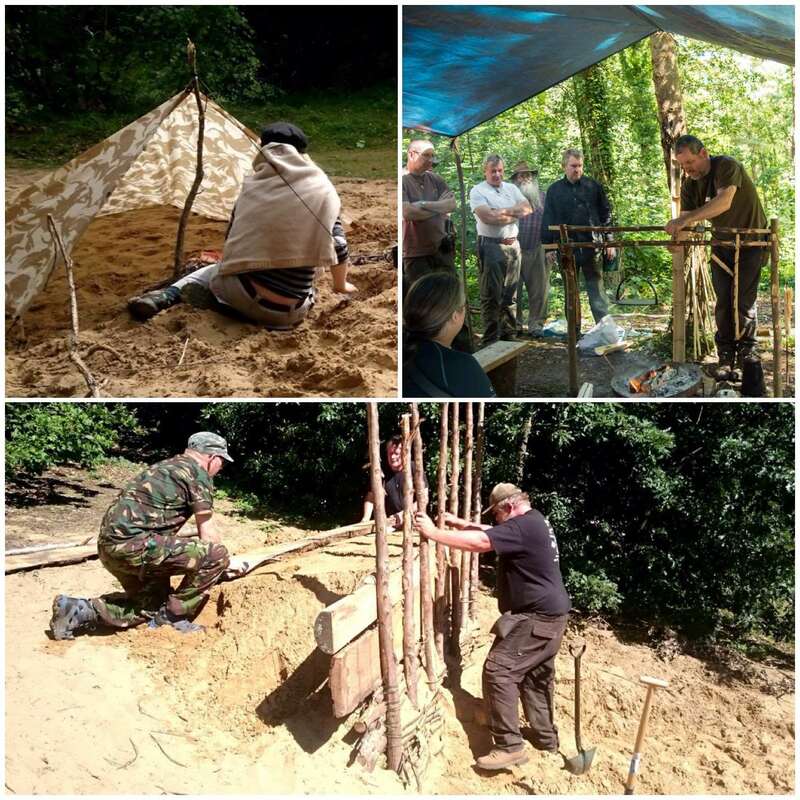 The final step here in the bottom right picture shows Rob cutting out a piece of wood at the bottom of Section 3 to slightly enlarge the ‘firebox’ area. 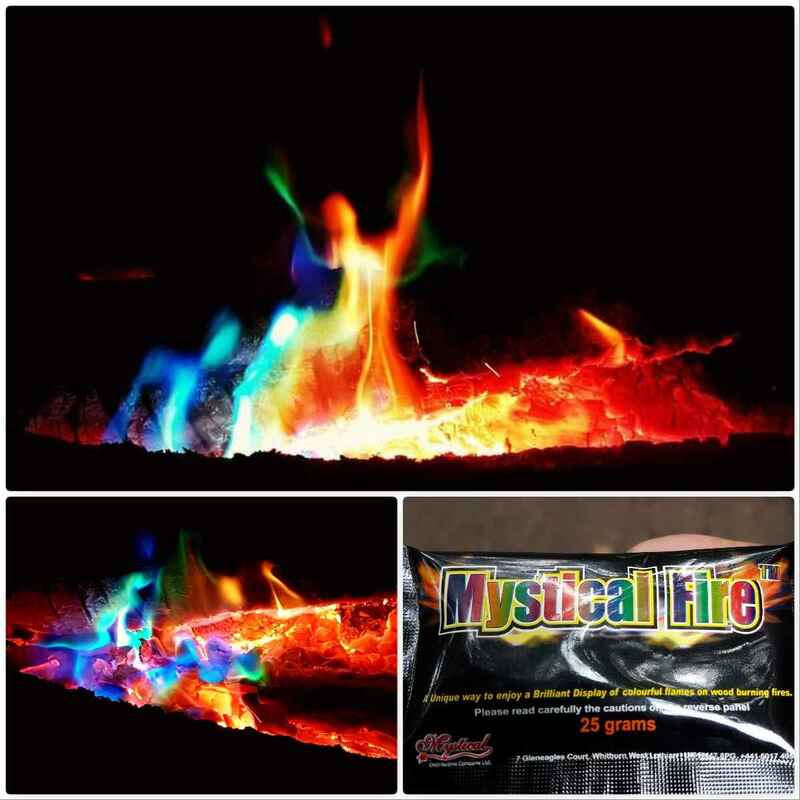 I have shown the final look of the firebox opening in the top left picture below. 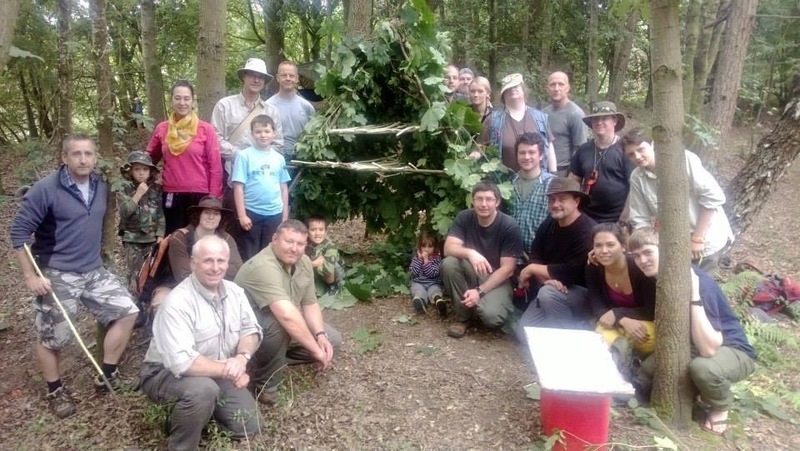 Rob created this firstly by re-assembling Sections 1 & 2 with Section 3. 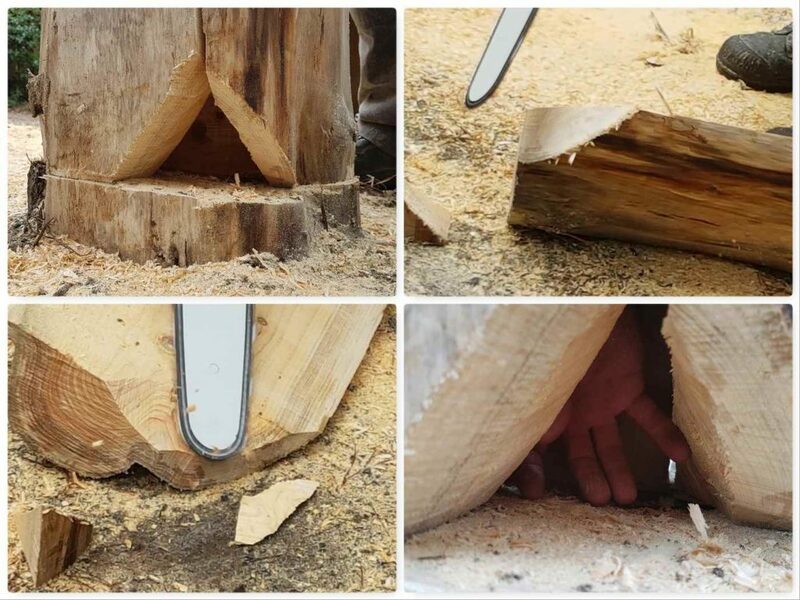 The he marked the corners of Sections 1 & 2 that needed cutting to form the firebox opening (that might sound overly complicated, but it’s important if you’re not to cut the wrong corners). Once he’d cut off the corners he shaved off more wood from the ‘Shoulder’ of the opening so as to enlarge the firebox area. To increase the surface area of the chimney and help the log catch light more quickly I asked Rob to makes some cuts in the flue area. 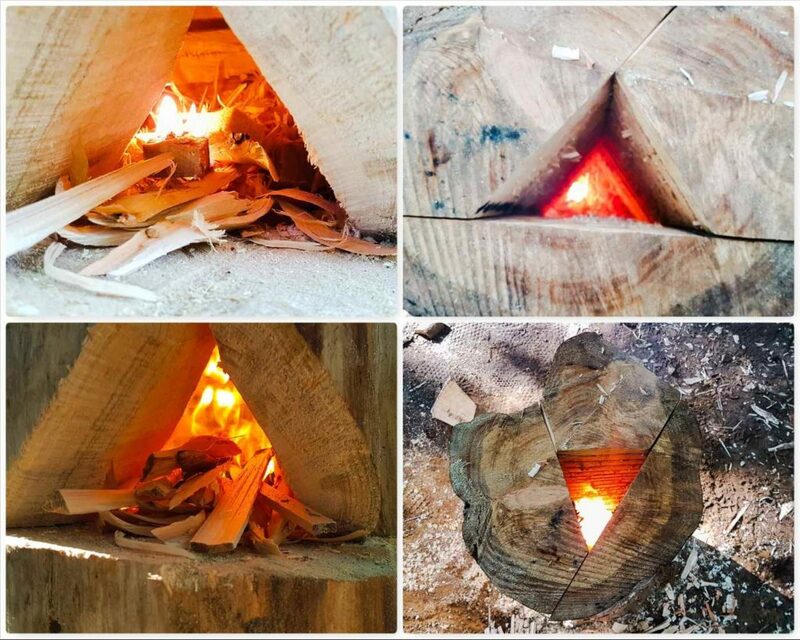 I got this idea from researching different types of log fires – this style of cut comes from the Raappanan Tuli log fire. 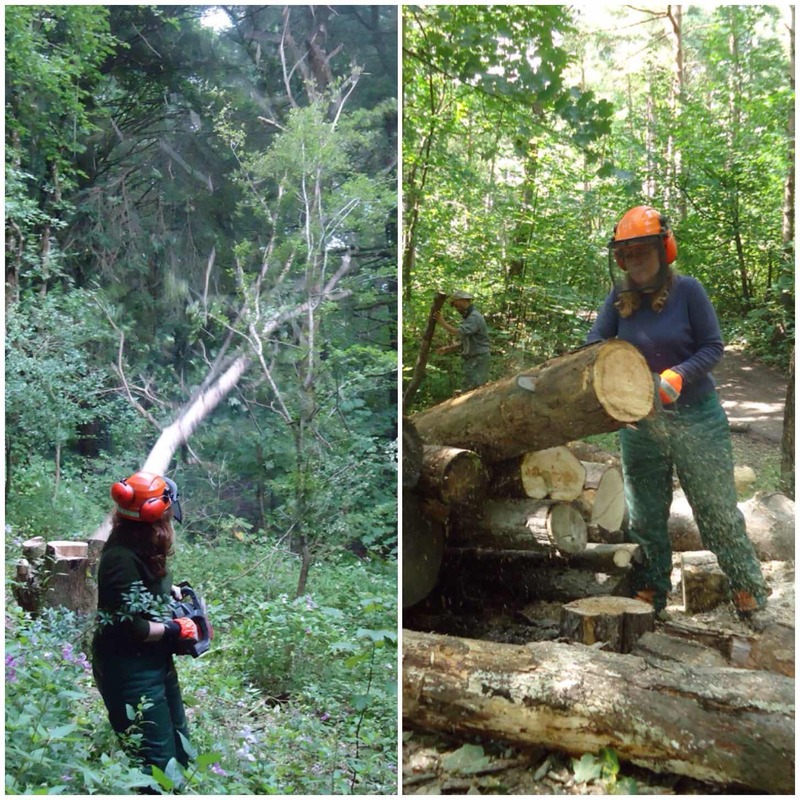 These cuts are particularly useful when you have a damp log as the increased surface area greatly increases the chances of the fire taking properly. 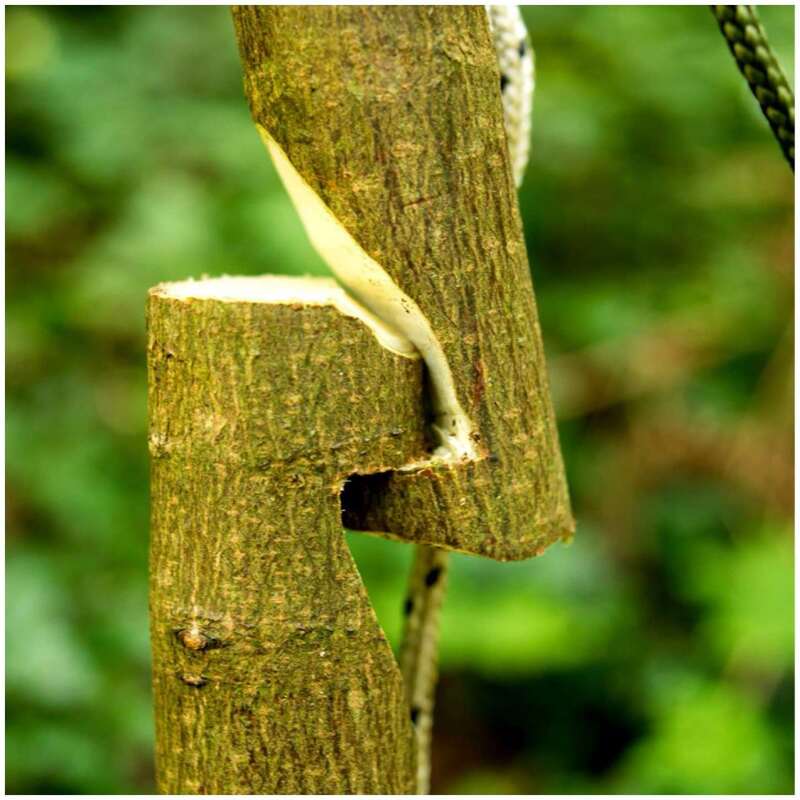 I used strong wire to hold all the pieces of the reassembled log together – an alternative would have been to make some dovetail joints and join them together with green wood pegs – see here for more details – How To…. 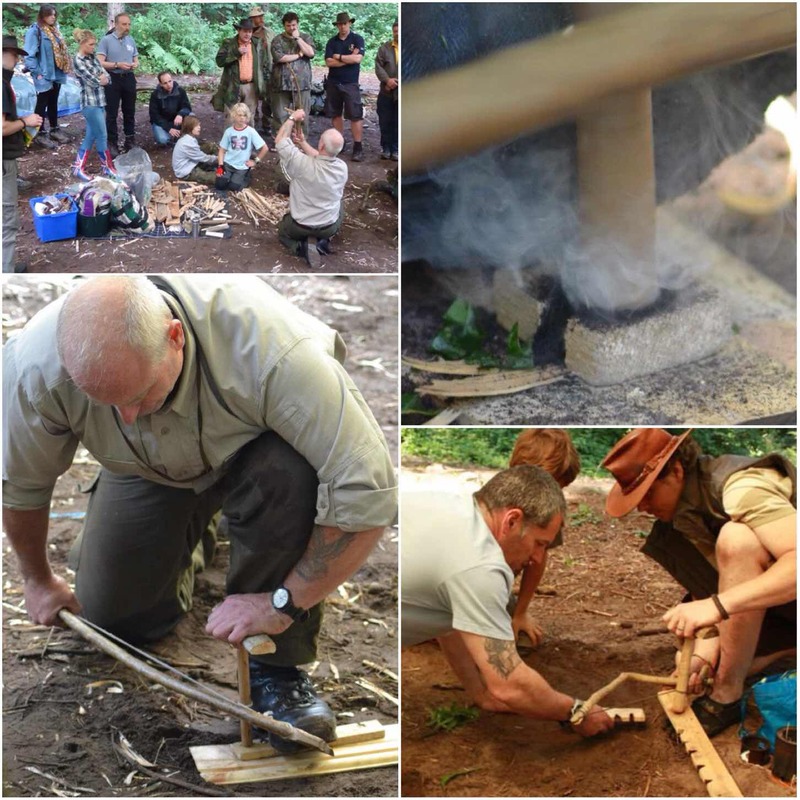 Build a Dovetail Log Rocket Stove. 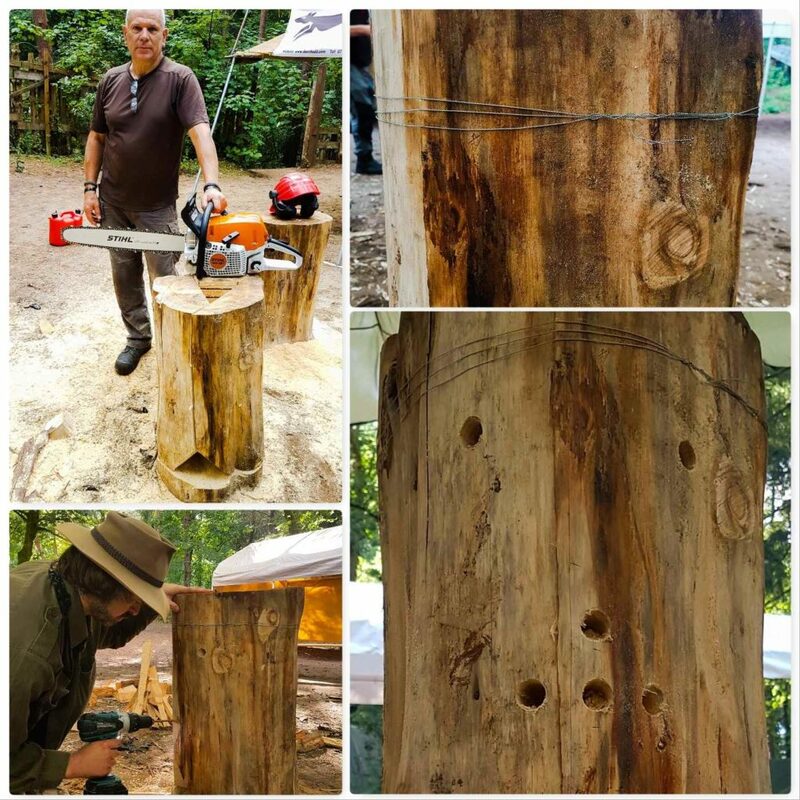 Finally my friend Mark used his drill to give the log rocket a face (which also helped provide a bit more ventilation). 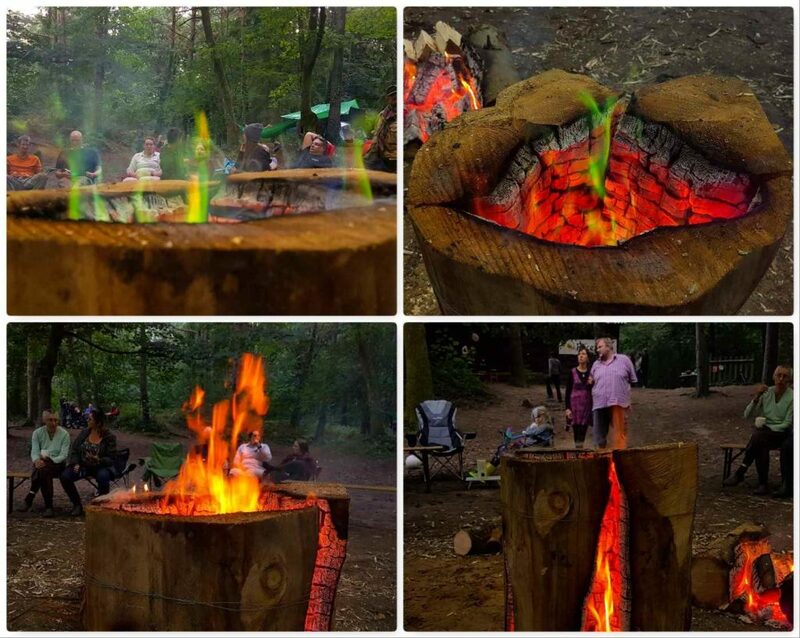 I used slivers of the central section Rob had cut out of the log as kindling and lit it all with a lollistick lighter (a firelighter pierced on a sharp stick – have a look here – Lolli Stick Fire). 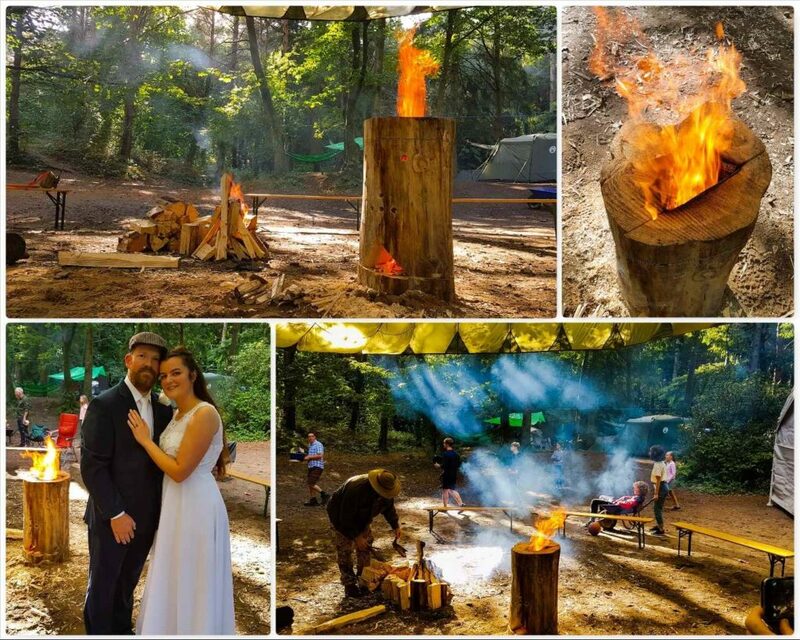 The log rocket was a stunning central feature for everyone to sit around in the evening and we even used it as a backdrop in a wedding photo (Magdalena and Phil renewed their vows at the Bushmoot). We even added a little bit of Cap’n Badger’s magic Rainbow dust to ‘mix the colours up’ a bit. 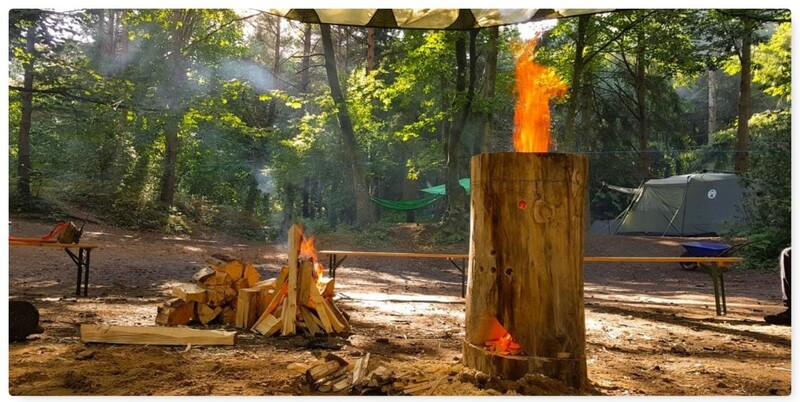 When I looked at the log rocket the next day (over 14 hours after it was lit) the base was just a mass of burning embers – quite a log rocket, I would say. There is no rocket science here or fancy skill to learn – just down right common sense. 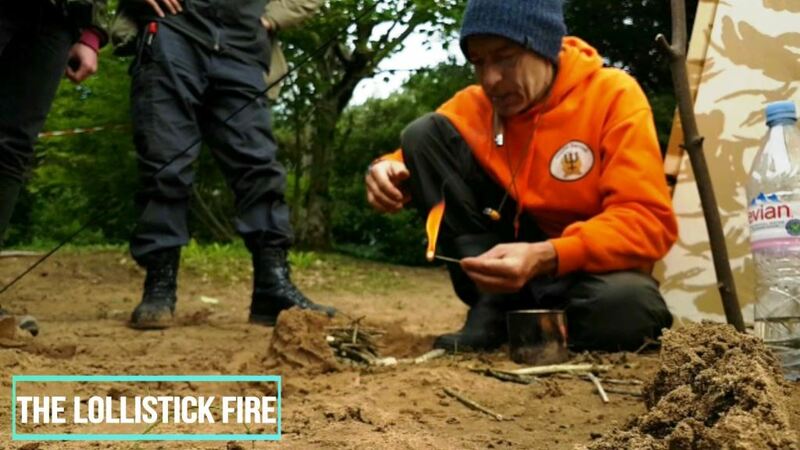 When you have limited resources and the elements may be against you, then you may wish to consider the ‘Lolli Stick Fire’. 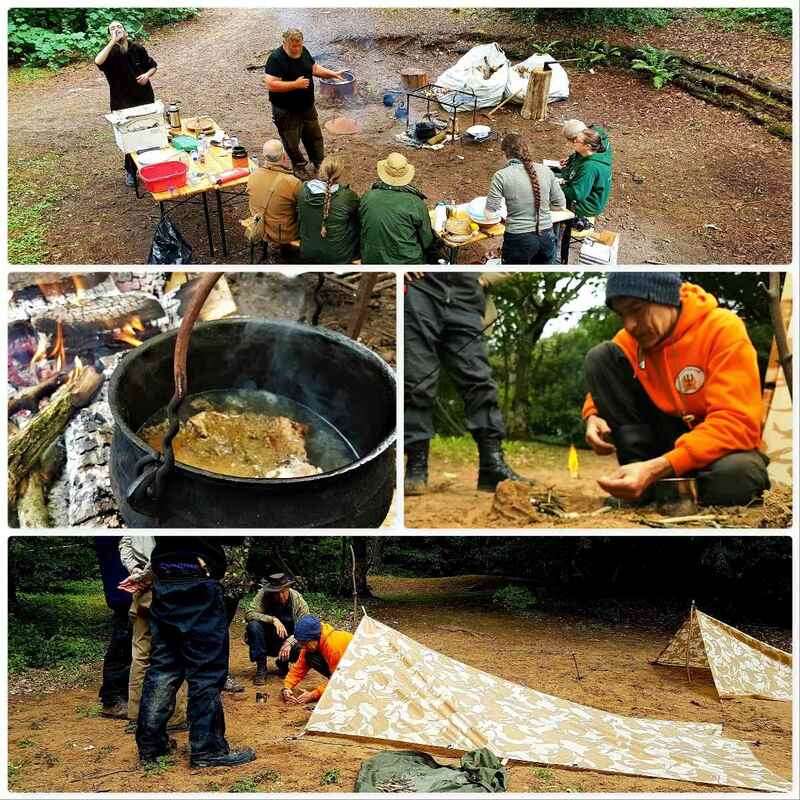 At the 2017 BCUK Bushmoot my good friend Fraser Christian from Coastal Survival was running a 48hr workshop on Coastal Survival. 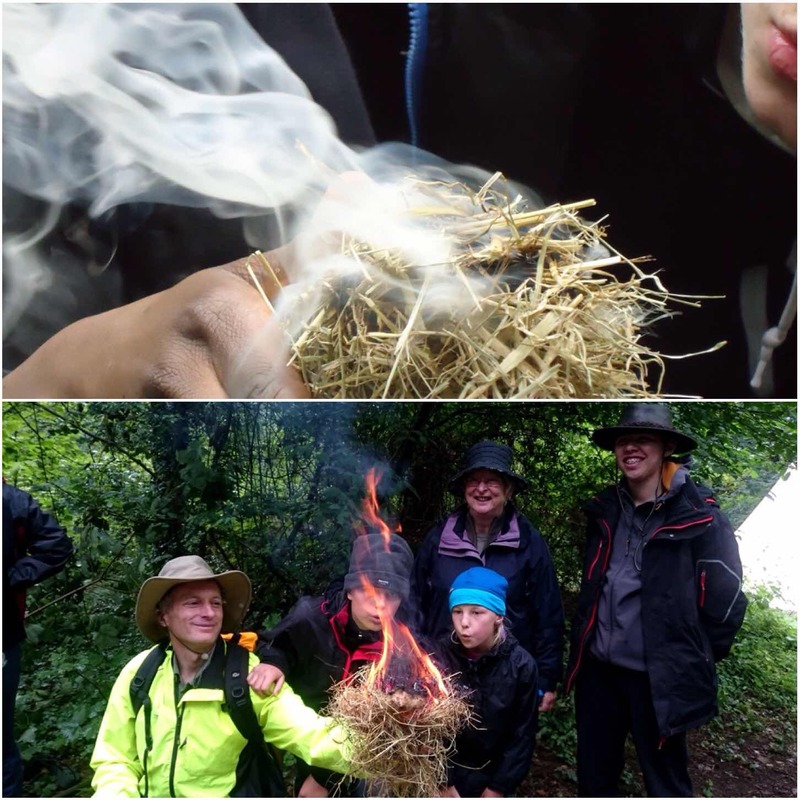 One of the classes was on lighting a fire on the beach in windy conditions with very limited resources – he called this the ‘Lolli Stick Fire’. Fraser built using sand a little reflector wall in a horse shoe shape and within it he laid a platform of dry dead twigs. 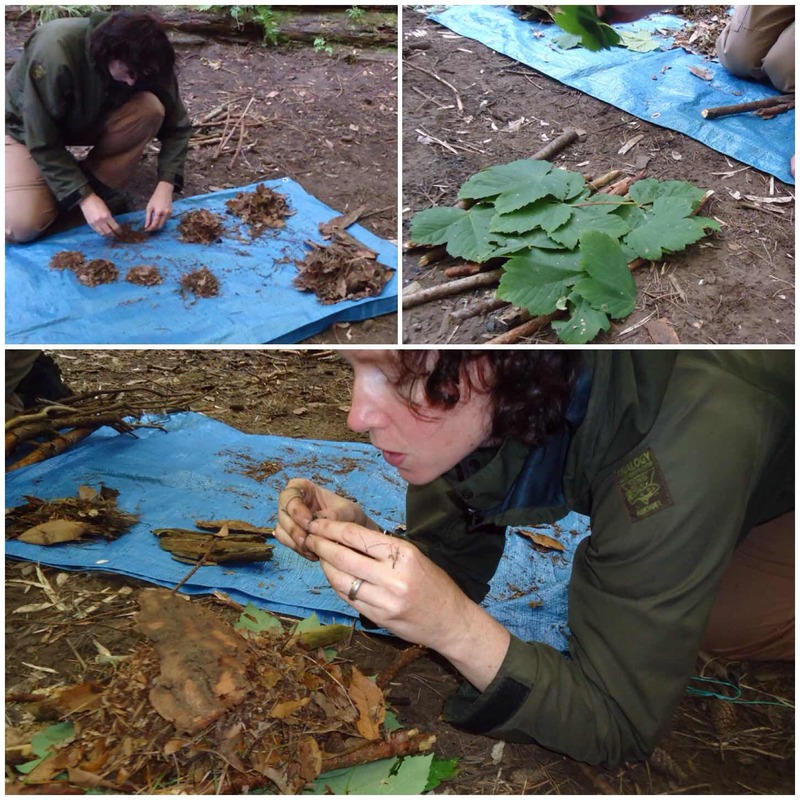 On the surface of this platform he laid three loose piles of twigs in a ‘U’ shape. 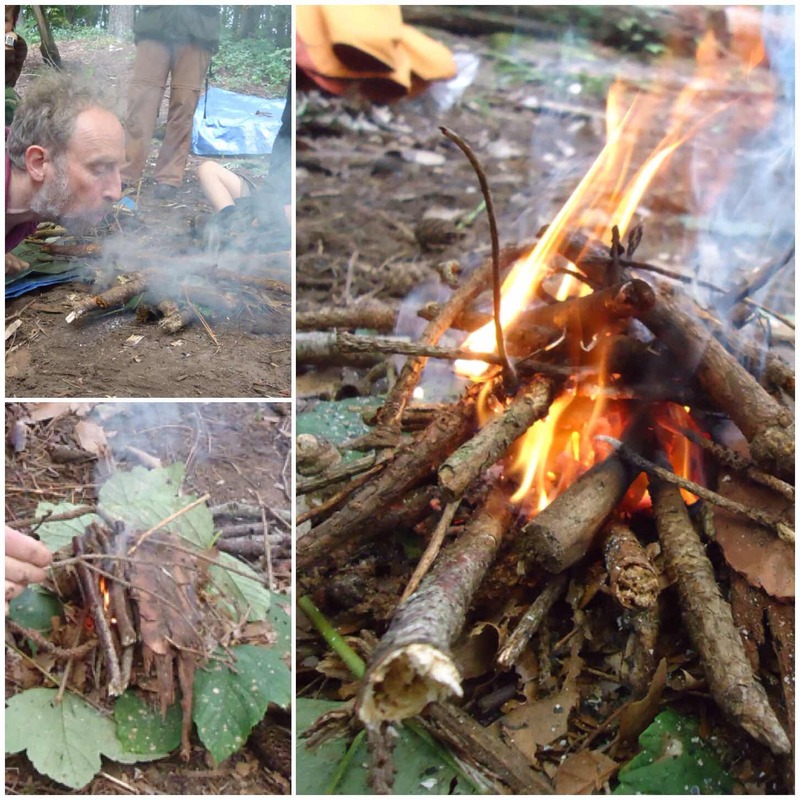 On top of this ‘U’ shape he laid a further pile of loose twigs making a roof. 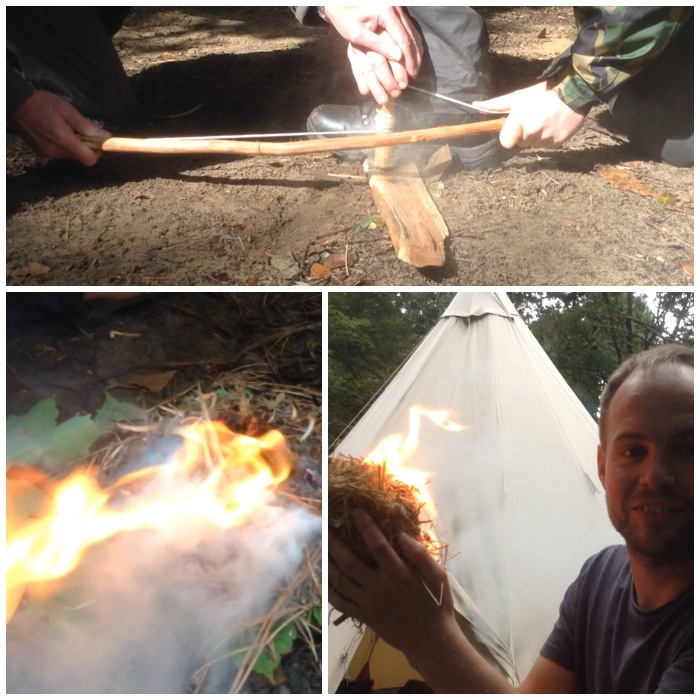 This shape left a hole in the side to add a firelighter. 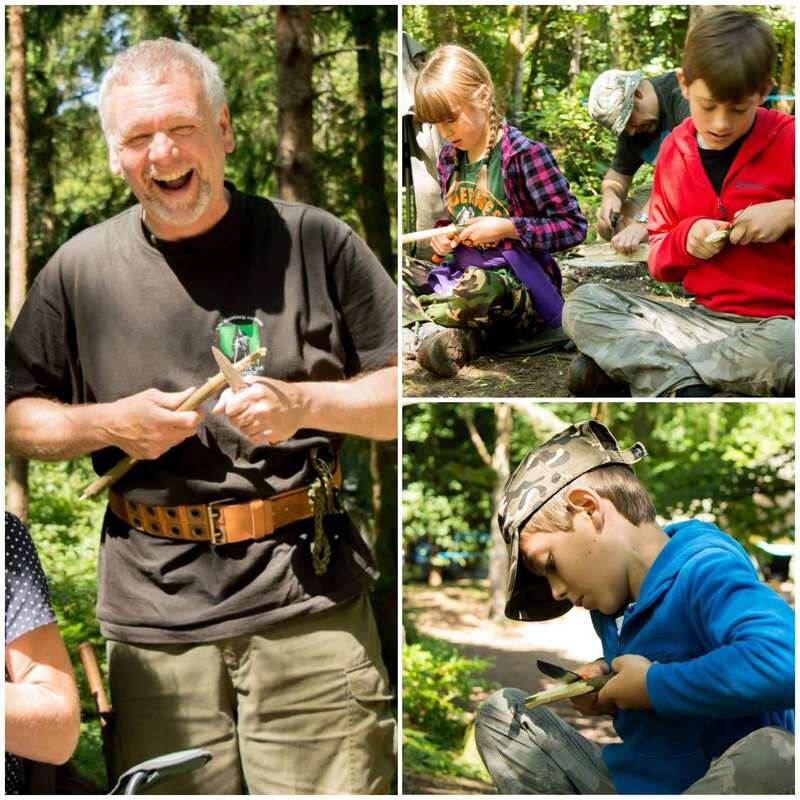 Rather than using a whole firelighter Fraser cut a firelighter into 8 pieces and stuck one of these small pieces onto a thin sharp twig (and here likened it to a ‘Lolli Stick’). 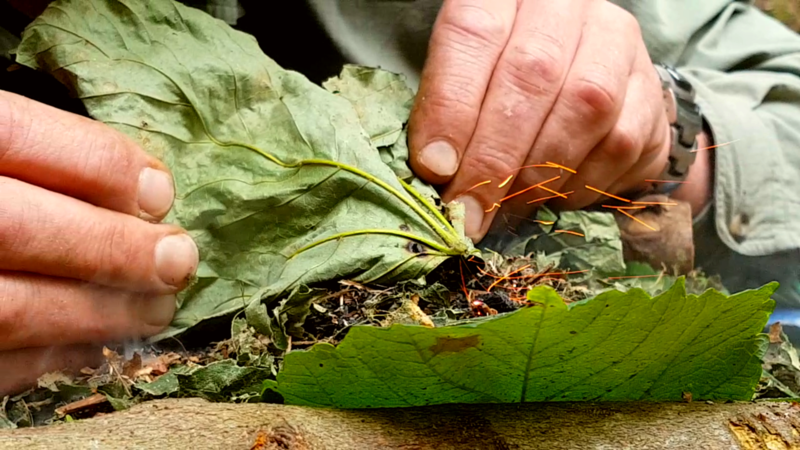 He lit this in the shelter of his tarp and easily popped it into the middle of his twigs. 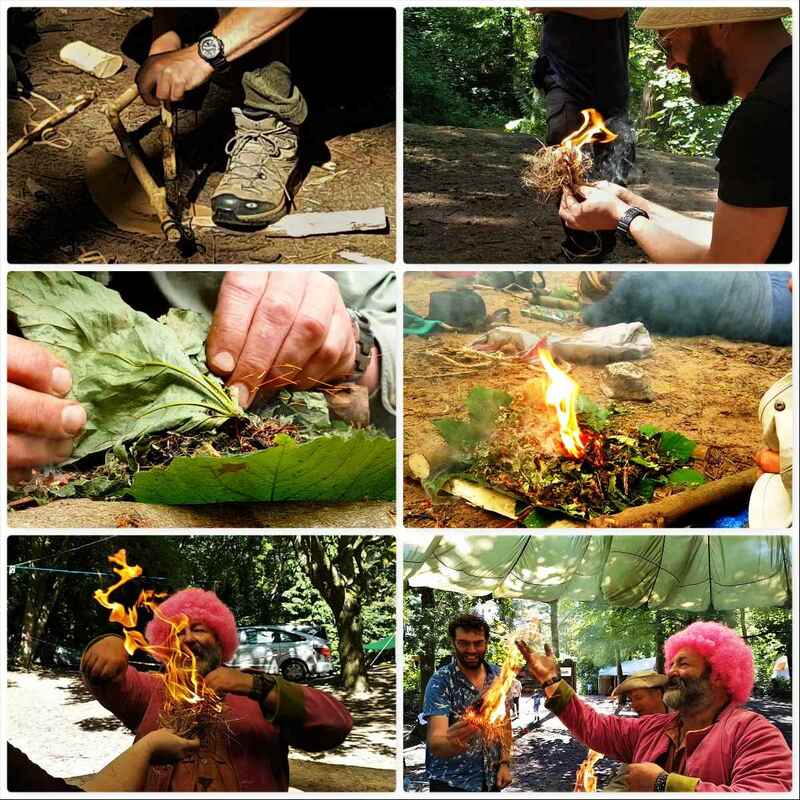 The flames spread through the twigs very easily as they were loosely laid and Fraser topped them off with further twigs to get the fire going really well. 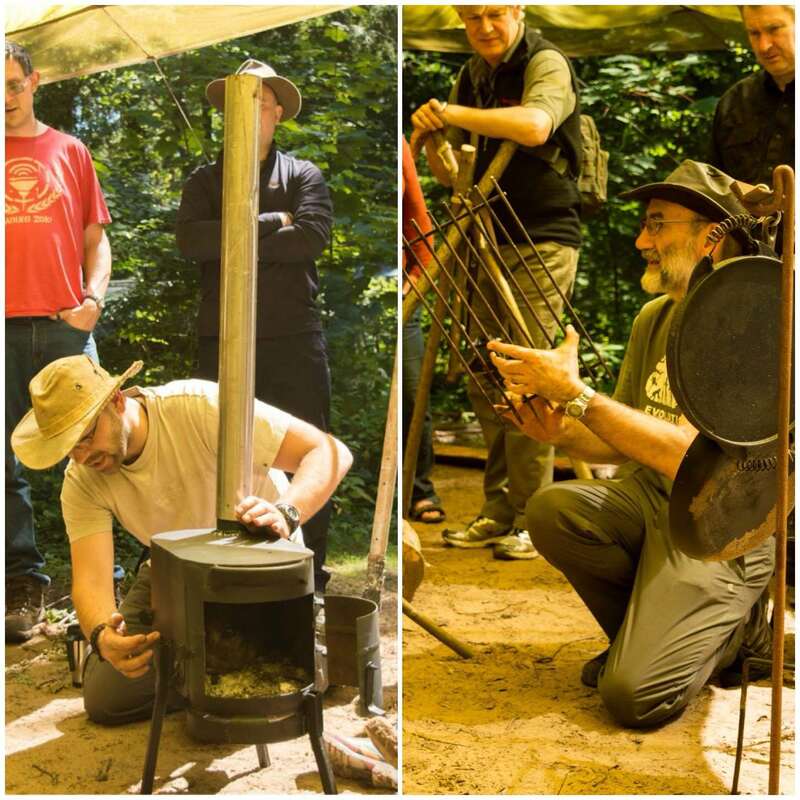 This process only took around a minute and he soon had a cup of water pushed up against the side of the fire. 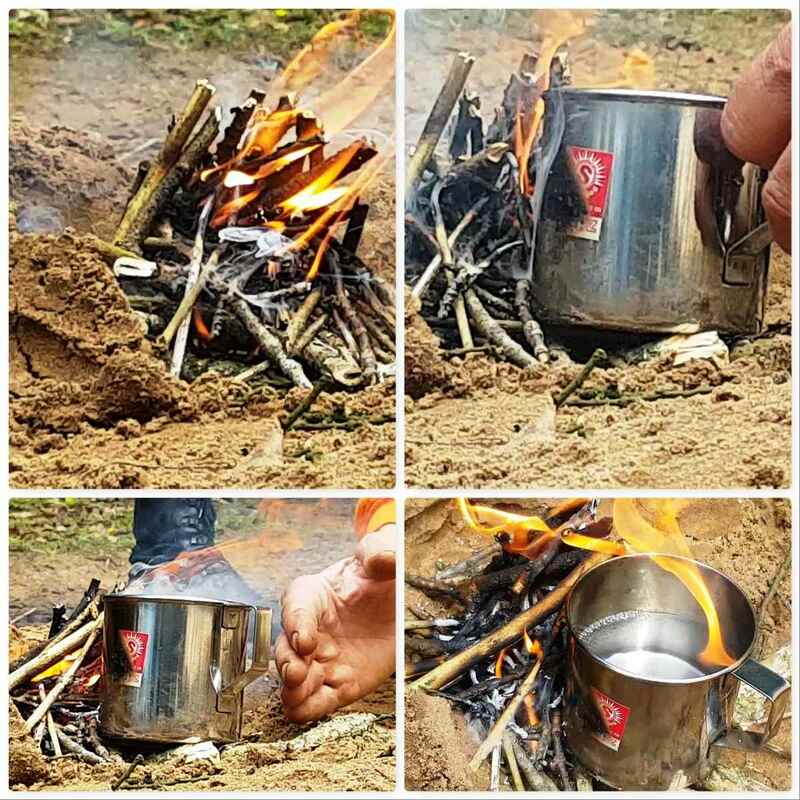 The small reflector wall helped bounce the heat back onto the cup and so boil the water quite quickly. 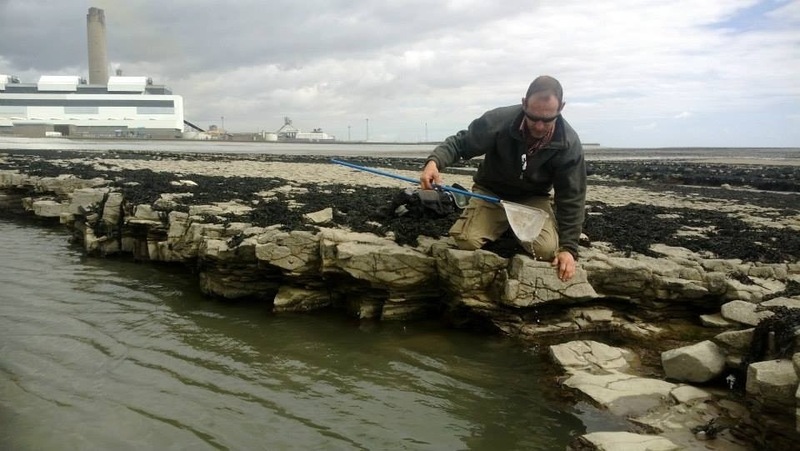 Fraser uses this technique on the coast as the reflector wall protects the fire from the fierce winds and because of the minimal resources needed to light and maintain it. 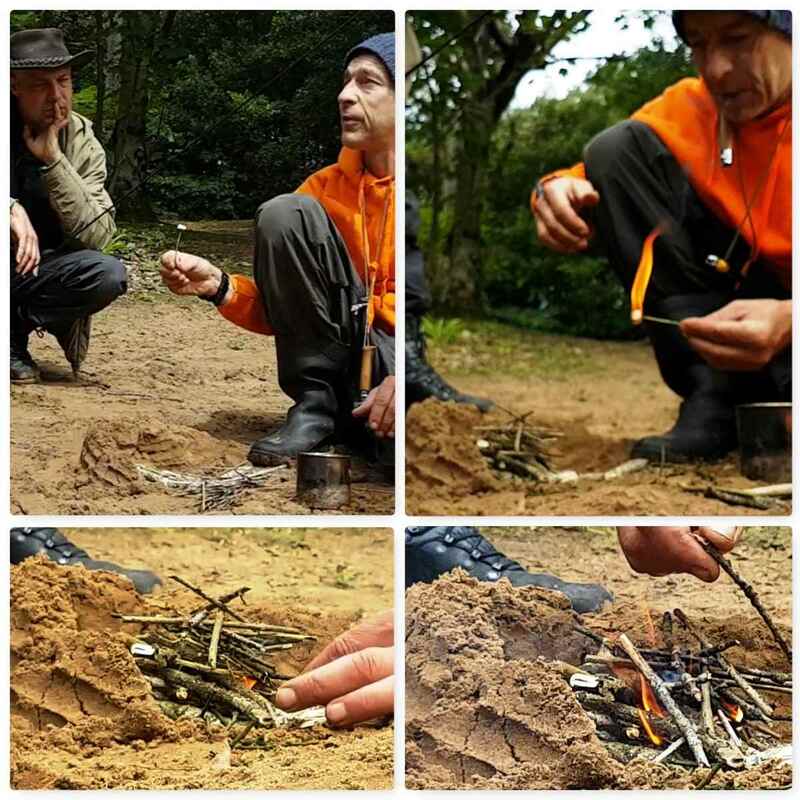 I incorporated this technique into our Starter Course at the Bushmoot and everyone easily got there fires going with it with very limited resources. 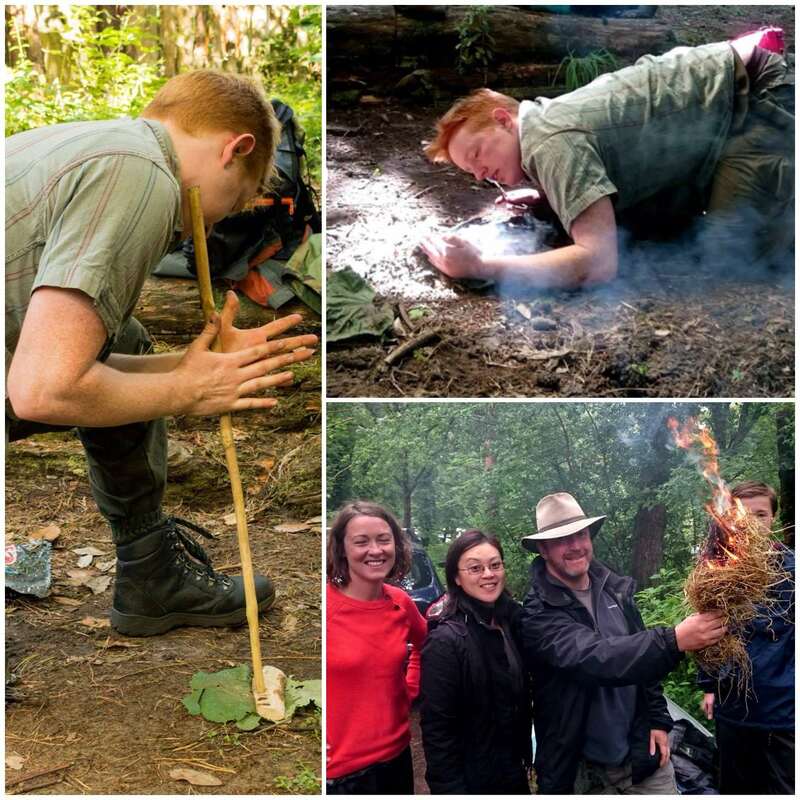 The ‘Lolli Stick’ is safe to handle, requires only an eighth of a firelighter and is easy to light – as I said before ‘down right common sense’. 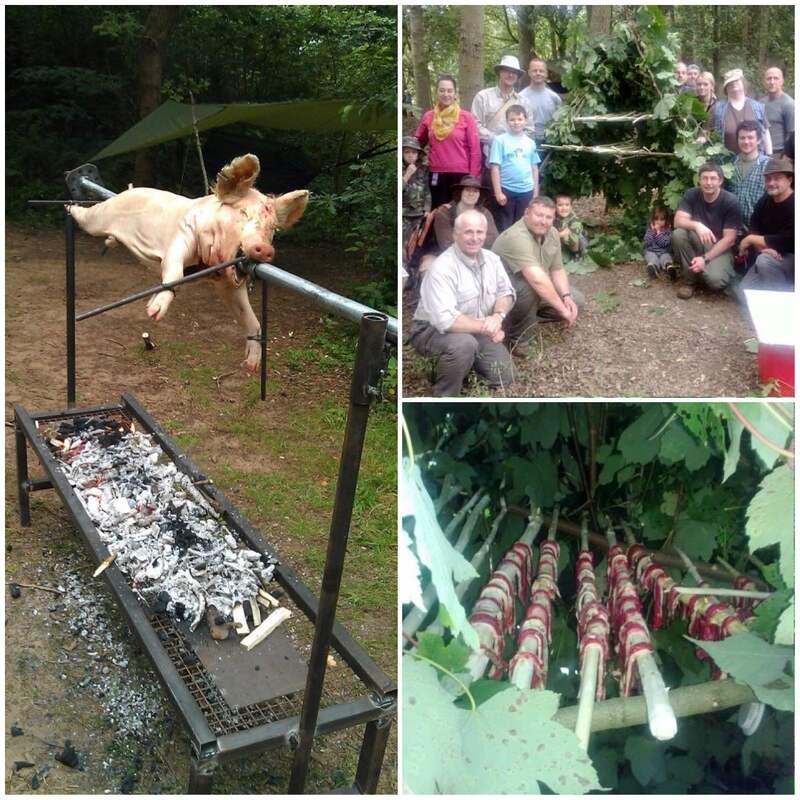 The BCUK Bushmoot was a cracker once again this year. 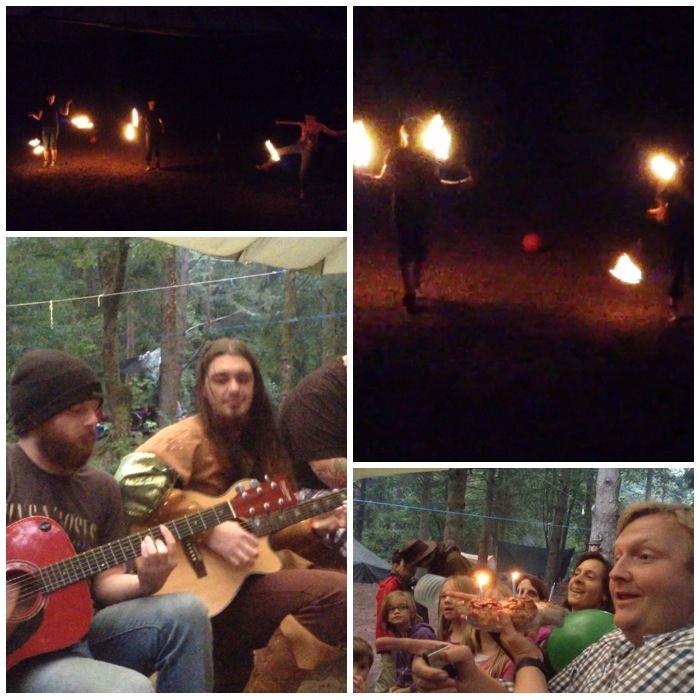 This year I focused more on video than stills so have decided to make 3 videos of the event. This is the ‘Early Days’ video. 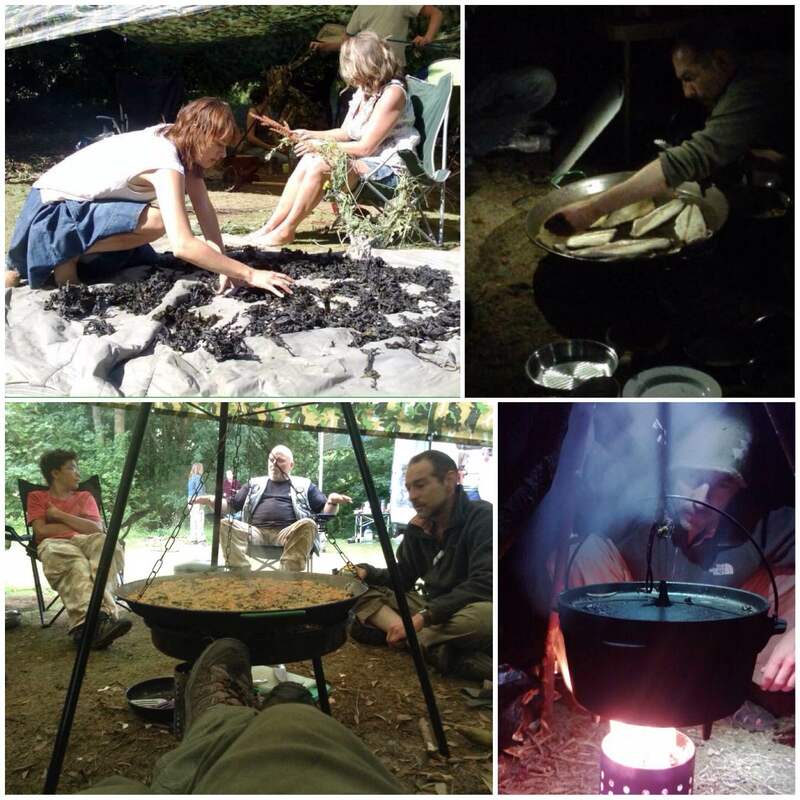 Over the last week and a half I have spent some glorious (and somewhat tiring) days on the South coast of Wales at the BCUK Bushmoot. I will write a fuller report later of the event with lots of video but for now here are some of the highlights. As usual there were far too many workshops being run for someone to attend them all. 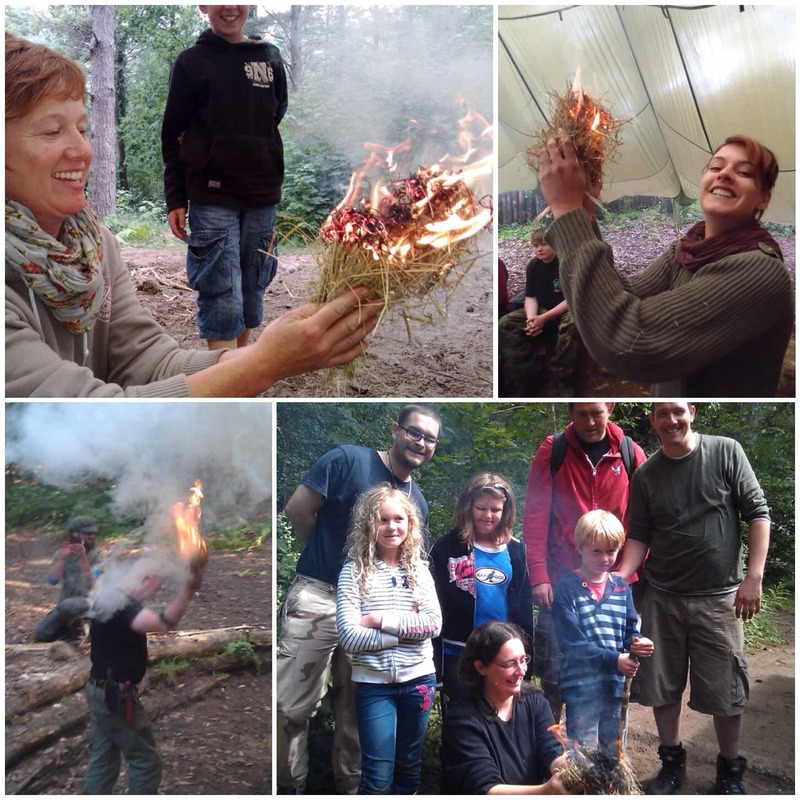 A particular favourite of mine is the Damp Tinder workshop run by Rich59 proving you can get a Fire in the dampest of conditions. This year my friend Alan Lewis from the Sea Cadets came along. Alan is a trained chef and was soon helping Phil up at the Naughty Corner with baking the Pizzas. 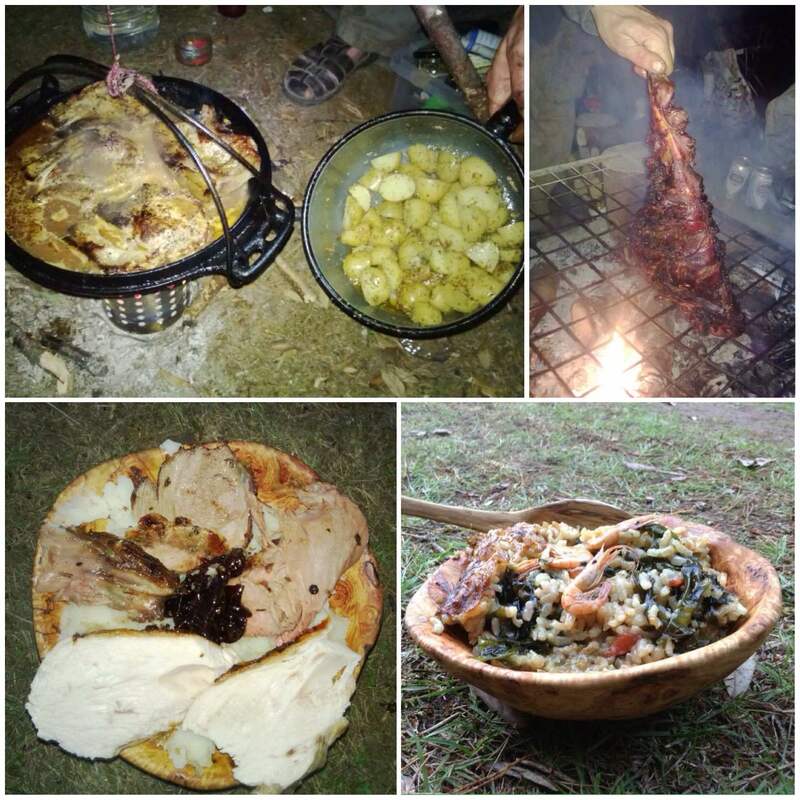 On Monday the whole Moot community came together and created what is now our traditional communal meal. 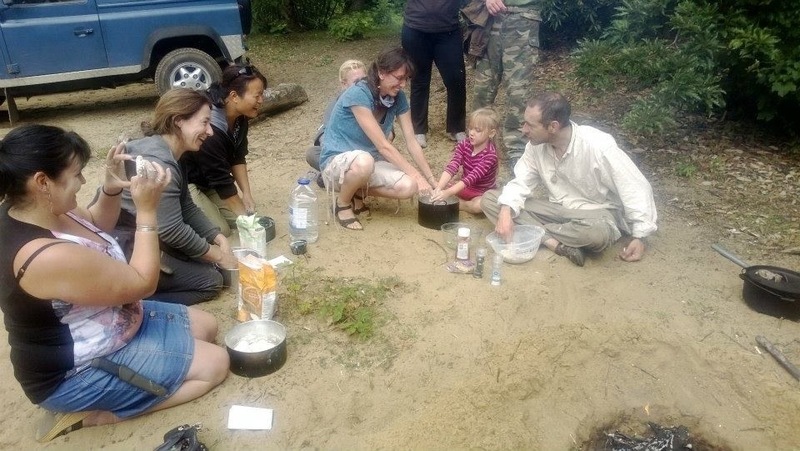 Everyone brought along Dutch Ovens full of different concoctions for everyone to try out. In the evening we were expecting a band to turn up but for some reason they did not make it. Undettered we soon had a group jamming away making for a perfect end to the evening. 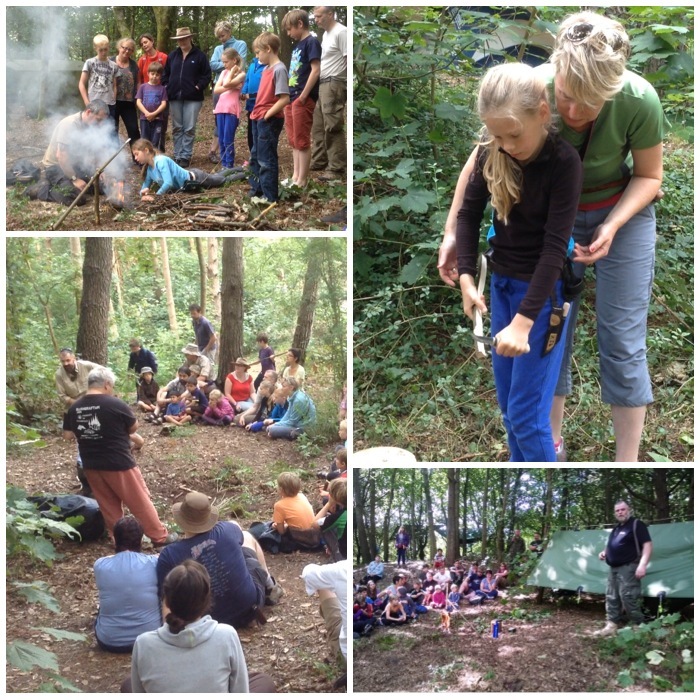 Now it is time to rest for a few days, tidy up camp and then head home. So after packing we set off on a magical mystery tour that stopped off at the Arrivals lounge at Gatwick Airport. Passing through the gates was ‘Darling Barney’ all the way from Southern France to celebrate my birthday with us. 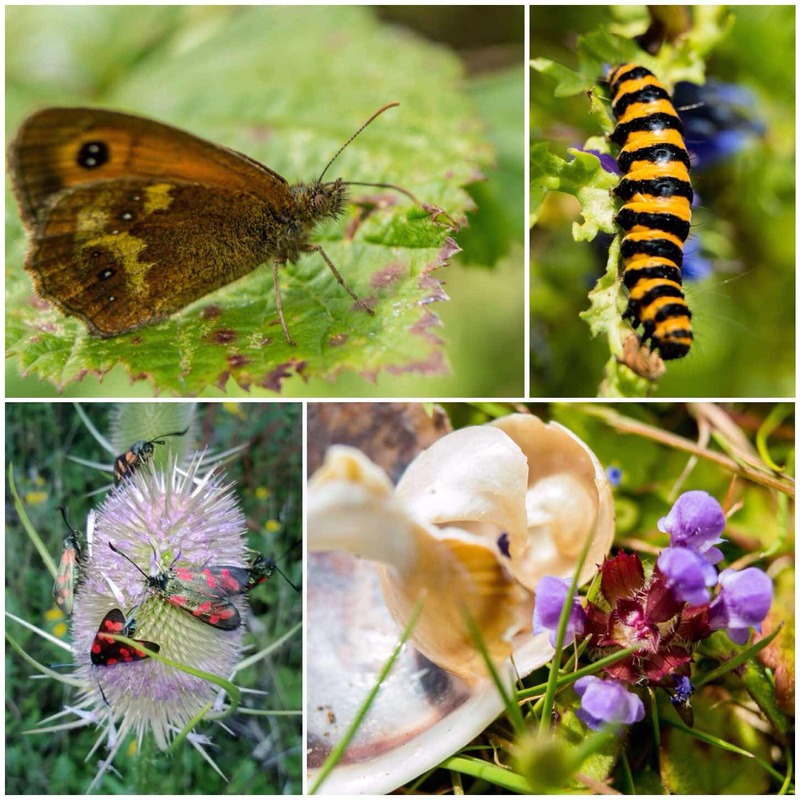 The pictures in this blog are a mixture from Tony Bristow, Ian Woodham, Alison Jones and myself. 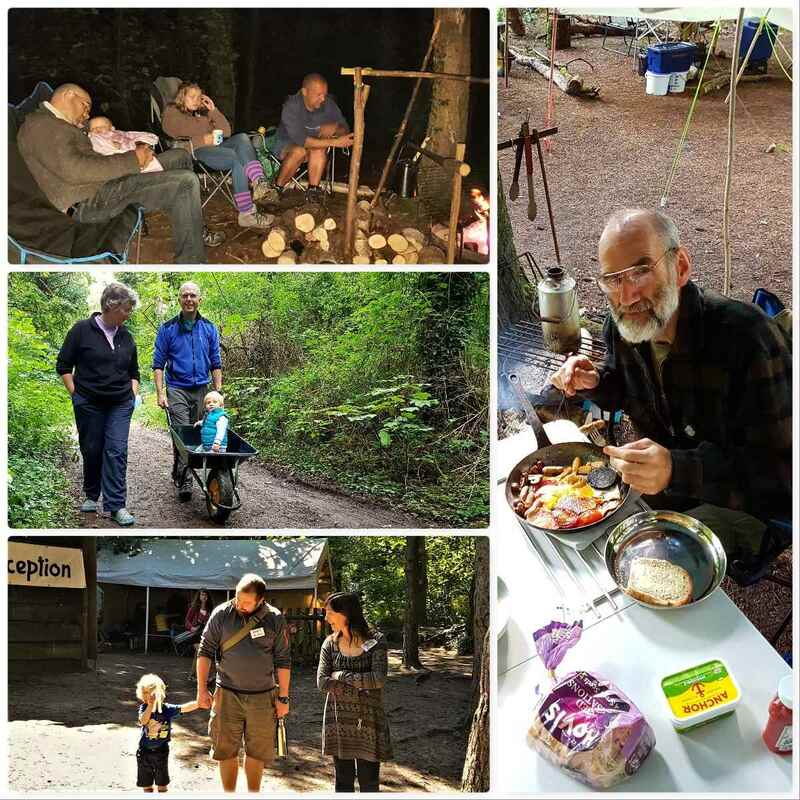 The magical mystery tour continued to our friends Philippa and Phil’s farm just outside Dorking in Surrey. 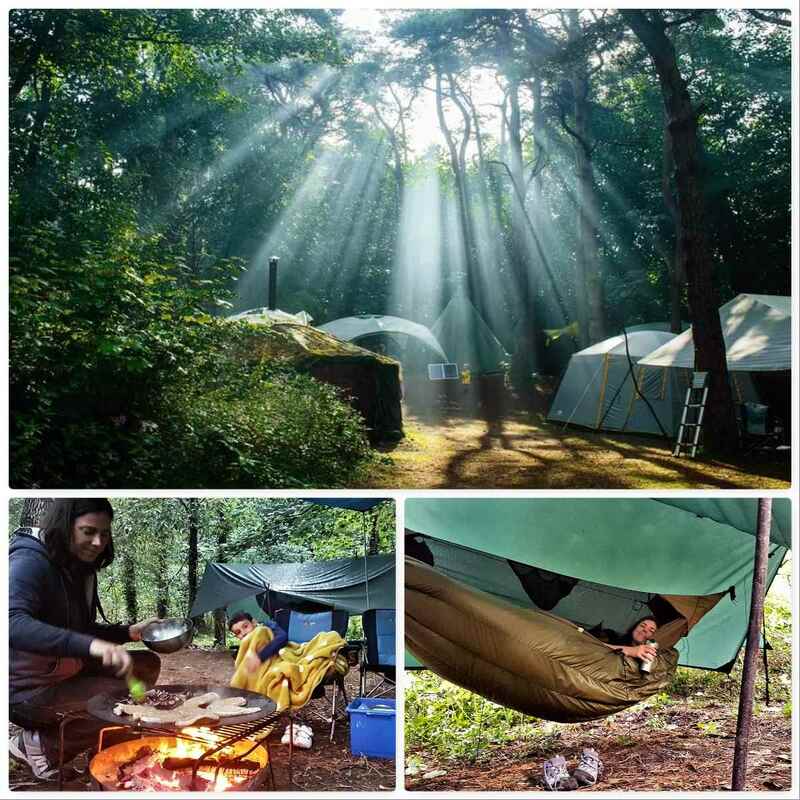 I was directed to a field to set up camp and we soon had our hammocks up and fire on. 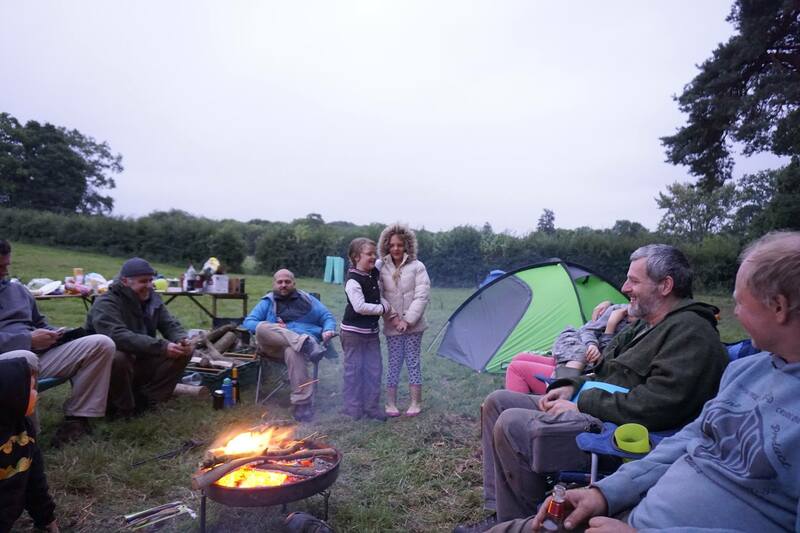 That night Phil came down to join us around the fire, there was a Harvest Moon and real ale and I was happy as Larry. Phil asked Barney and myself if we could help him and a couple of friends complete a bridge at his girls school the next morning. 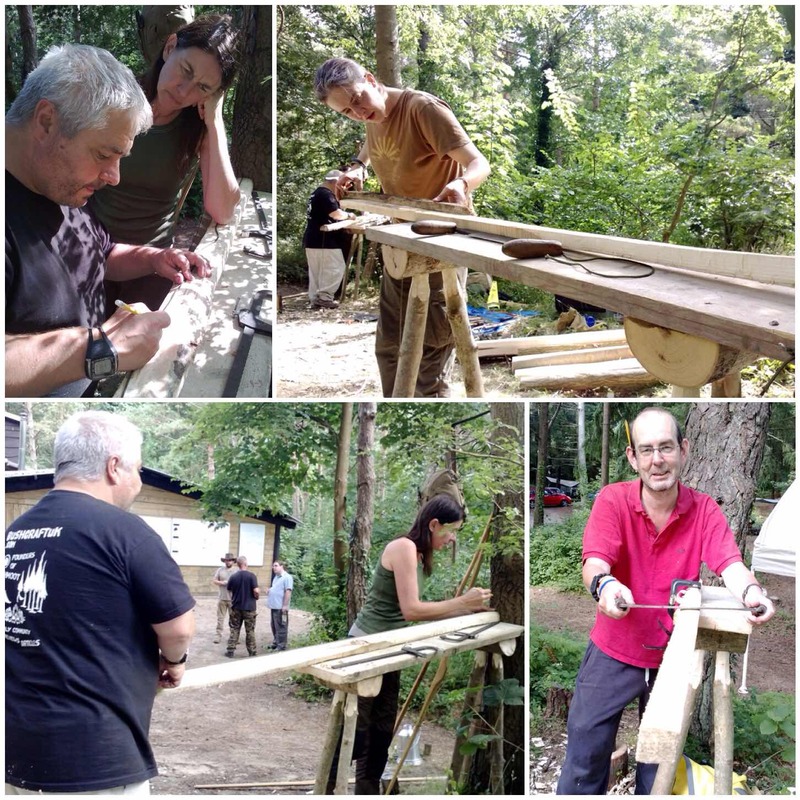 I thought nothing of this as I normally help out Phil’s farm when I camp there and Barney is a carpenter/cabinetmaker anyway so his skills were needed. It was a good morning mucking about in the mud building the bridge and we even stopped off for a couple of pints on the way back. Unbeknownst to me Alison had set up a secret Facebook page and invited lots of my friends to the bash. While I was away folks started to arrive and needless to say that when I was in the car coming back down the field to the camp I was feeling slightly bemused. 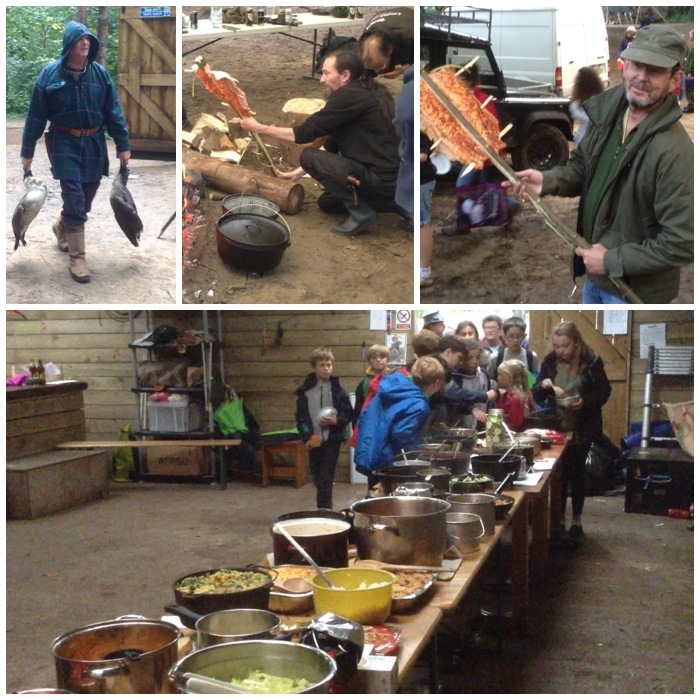 Alison had arranged for a delivery of groceries to be dropped off at the farm and a feast was quickly prepared. 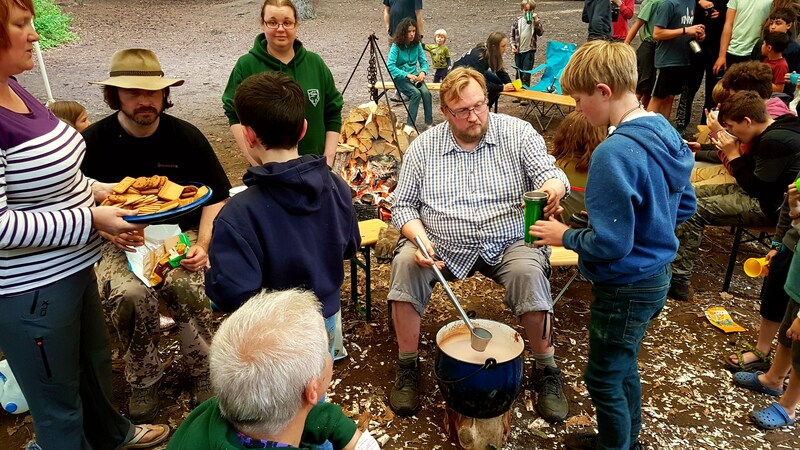 David Willis (Bushcraft With David Willis) used his bushcraft baking skills to make bread and our resident Sea Cadet chef Alan Lewis got on with prepping the skewers for the barbie. 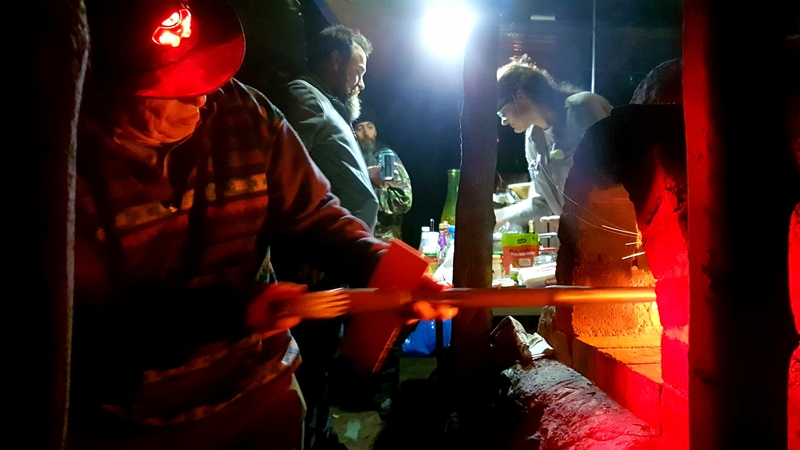 I had gone from quite chilled out (must have been the two pints in the pub) to frantically running around getting the fires going, maintaining them and trying to chat with everyone who arrived. Those of you who know me personally know that multi tasking is not my strong point. Added to all this confusion my friend Graham was spotted coming down the hill carrying a massive present all wrapped up. 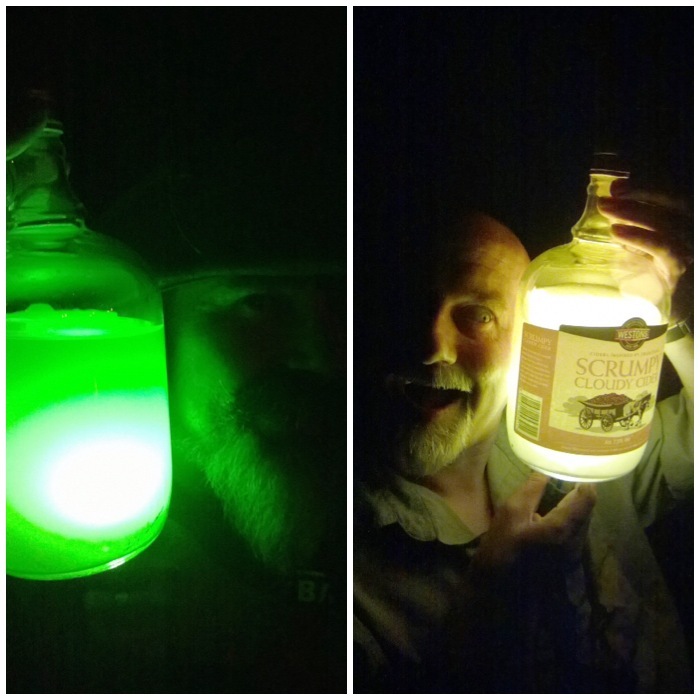 He told me I could not open it until later that evening around the fire. 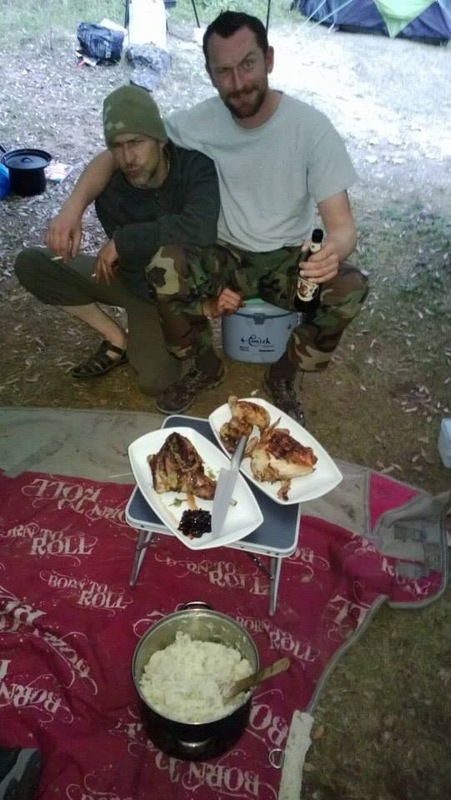 After a few more beers (I kept opening one, putting it down, chatting, losing it, opening another……and so on, repeating the process) the food was ready and a lovely birthday cake produced. 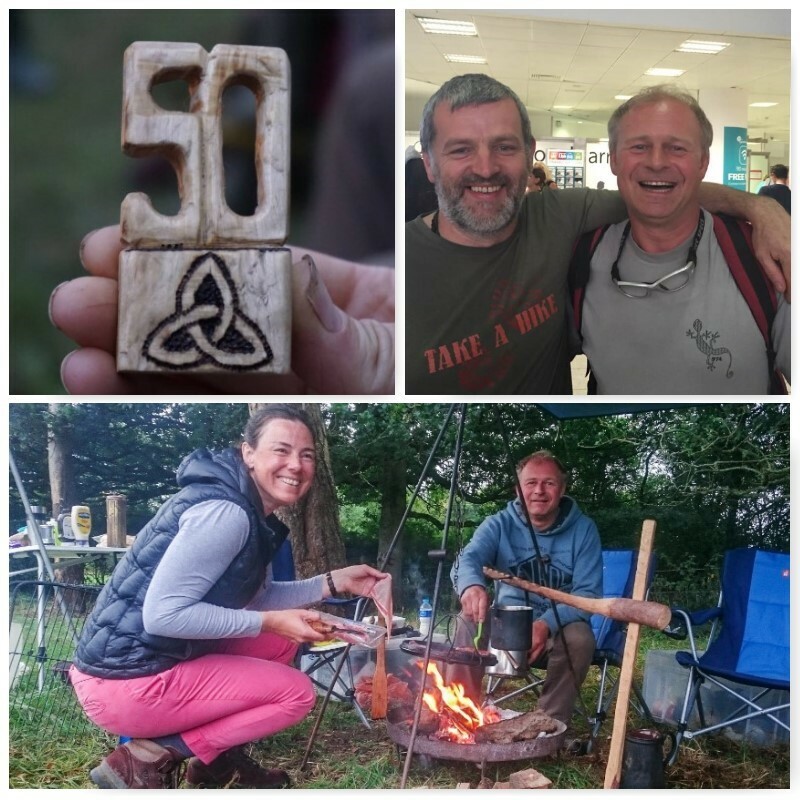 Thanks to everyone who brought a present along – every one was appreciated and I am still working my way through all the single malts you brought along Rick, Gordon, Stu, Dave and Alan. The wooden ’50’, Cliff, sits with my medals and other personal bits and bobs. It is a lovely piece of carving buddy. Still not used the old military canteen, Barney, in case I damage it – it too will live on my bits and bobs shelf. 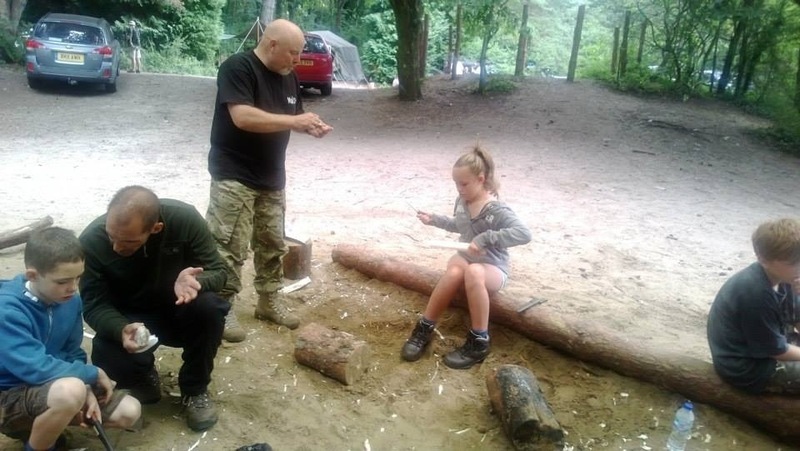 As for the Harrier knife carving, that log Graham that may take a while. 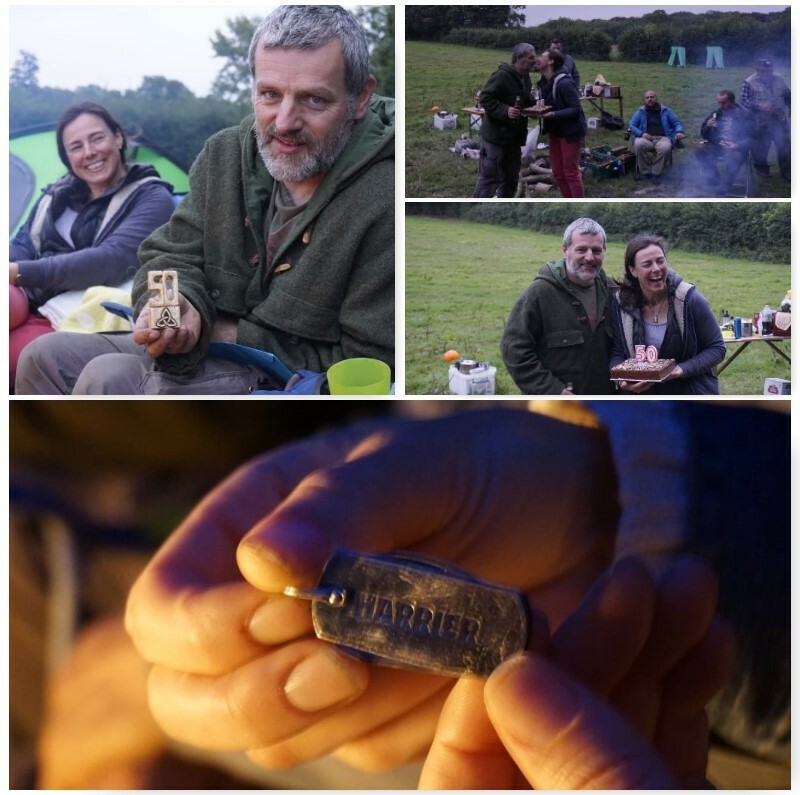 (The massive present Graham brought me turned out to be a rare Harrier stamped knife together with a log from which to carve my own twelve-piece dinner service). Thanks Phil and Philippa for the lovely honey you had just jarred 20 minutes before. As fresh as you can get I would imagine. 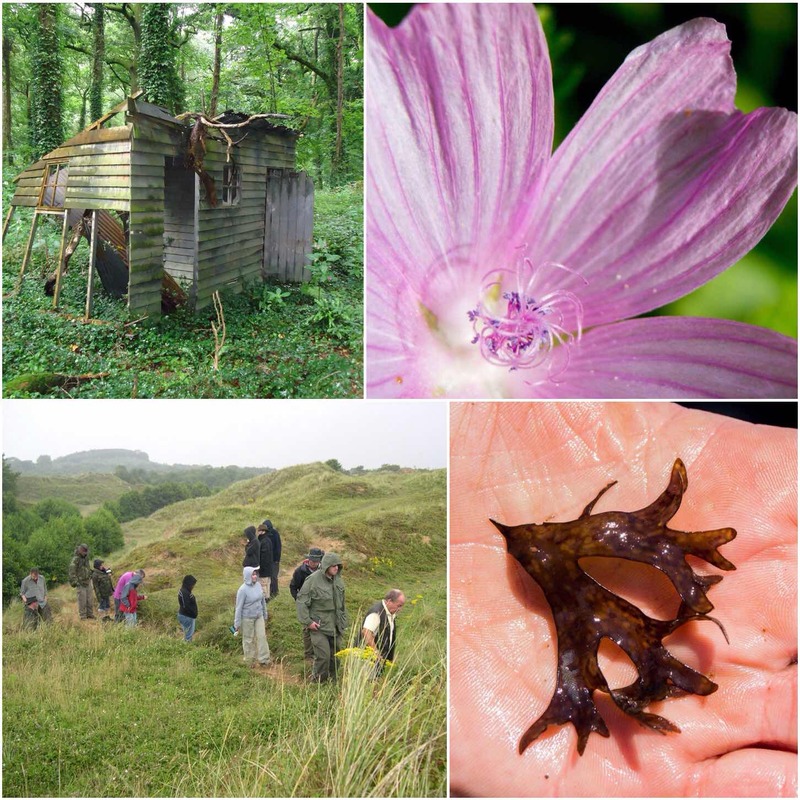 Thanks for all the Go Outdoor vouchers – I spent a happy couple of hours in there getting some extra kit. Lastly to Alison for getting me that rather nice laptop I was really looking for (cheers for organising that Dave). It works a dream and I can process pictures so much quicker now. A real highlight of the evening was listening to Robin and Jenna singing Happy Birthday to me in Welsh – I am not normally an emotional person but that moment will stay with me for the rest of my life. 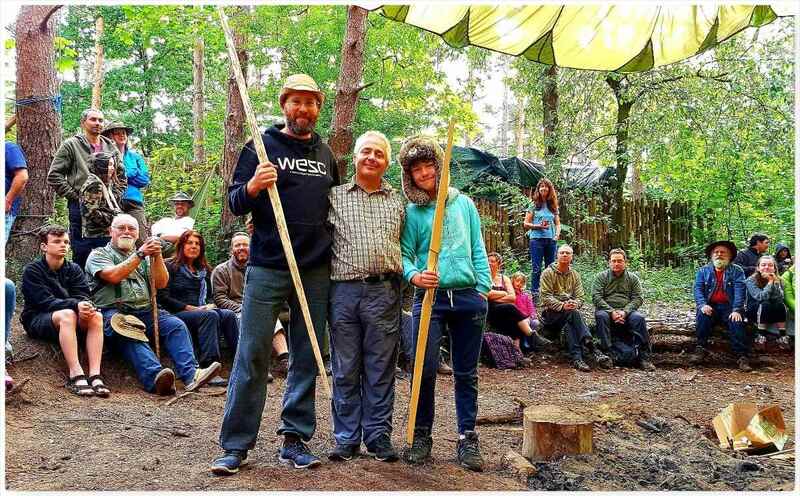 A surprise evening arrival to the party were my good friends John and Caron of Woodcraft School (apologies I did not get a picture of you at the party). They just sort of appeared out of the dark while I was chatting away (just when I was sure there were no more surprises I was proved wrong). 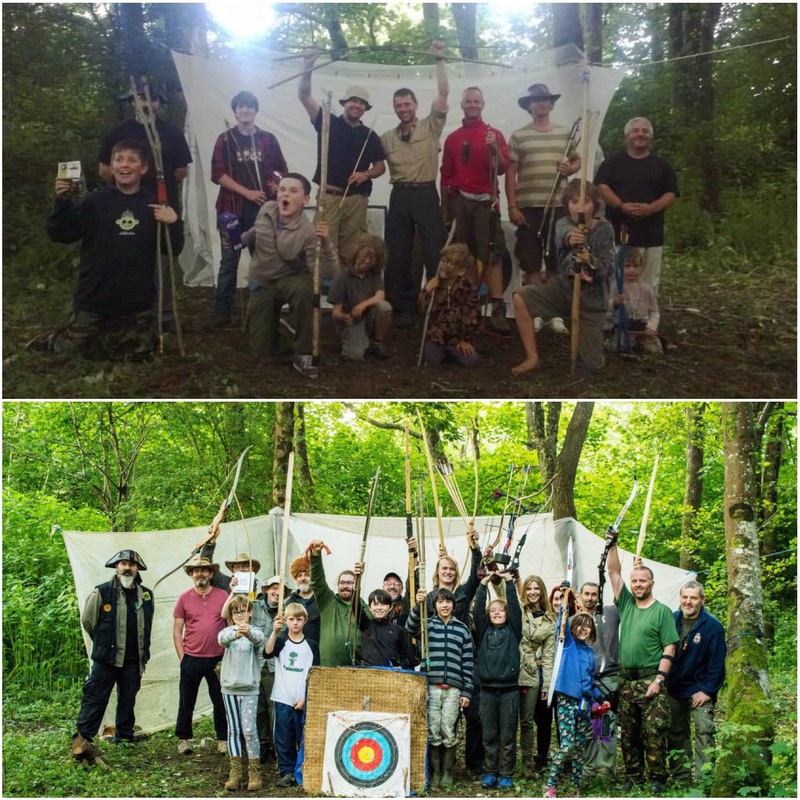 Sunday morning soon came and those that had decided to stay for the night rose to a breakfast of bacon rolls and sausages before cracking on with some archery and Atlatls and posing for a Survivors’ picture. Packing up was a sad business as everyone prepared to travel back home but I was still reeling slightly in a happy way from the whole surprise party. 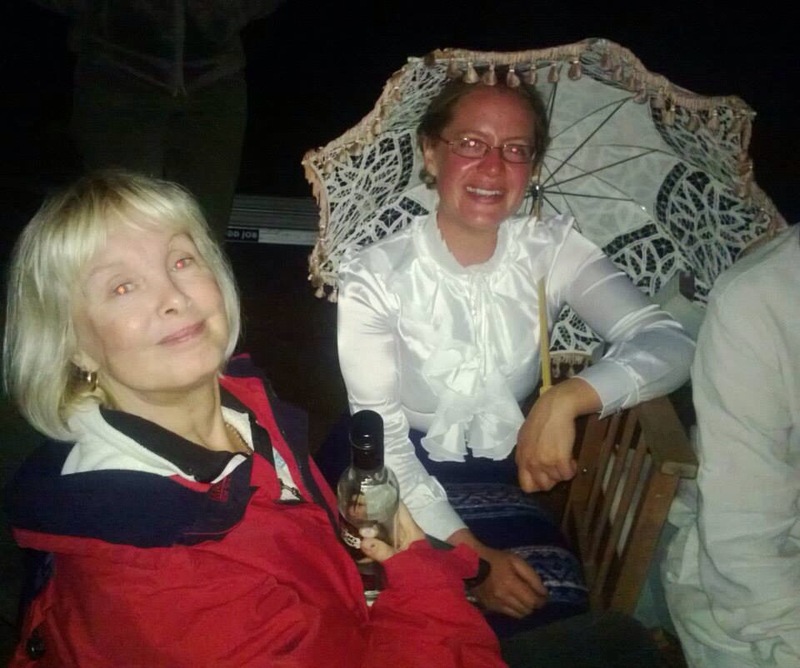 I am still amazed at the distances people travelled to come to the party – France, west Wales, Leeds and more. Some came for the day and others stayed overnight. Thank you to all those who could not make the weekend but sent me there heartfelt wishes instead. 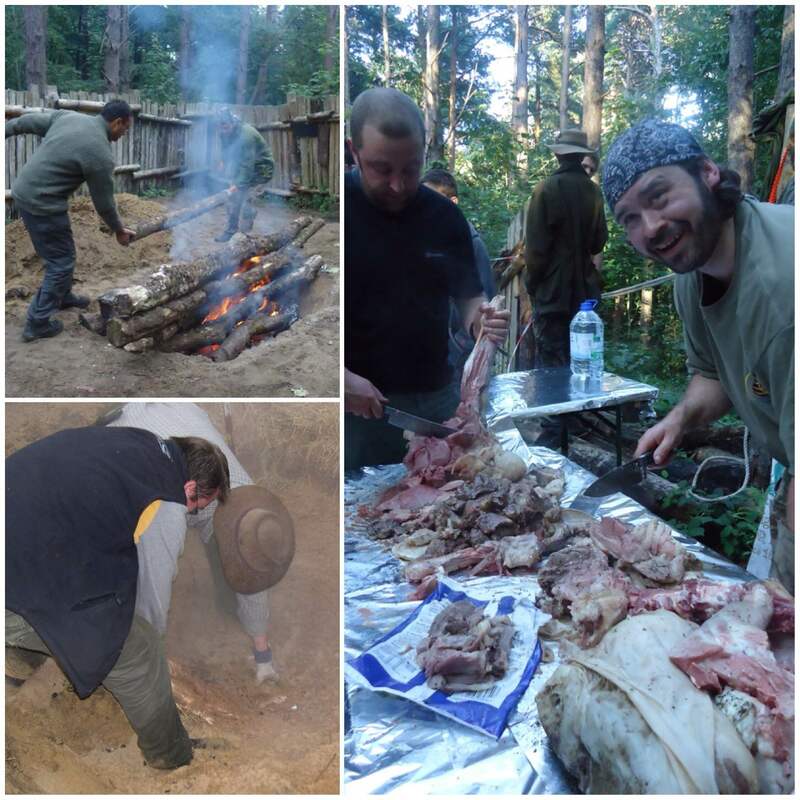 Here’s instalment number 10 in the ‘10 Reasons to Bushmoot‘ series. 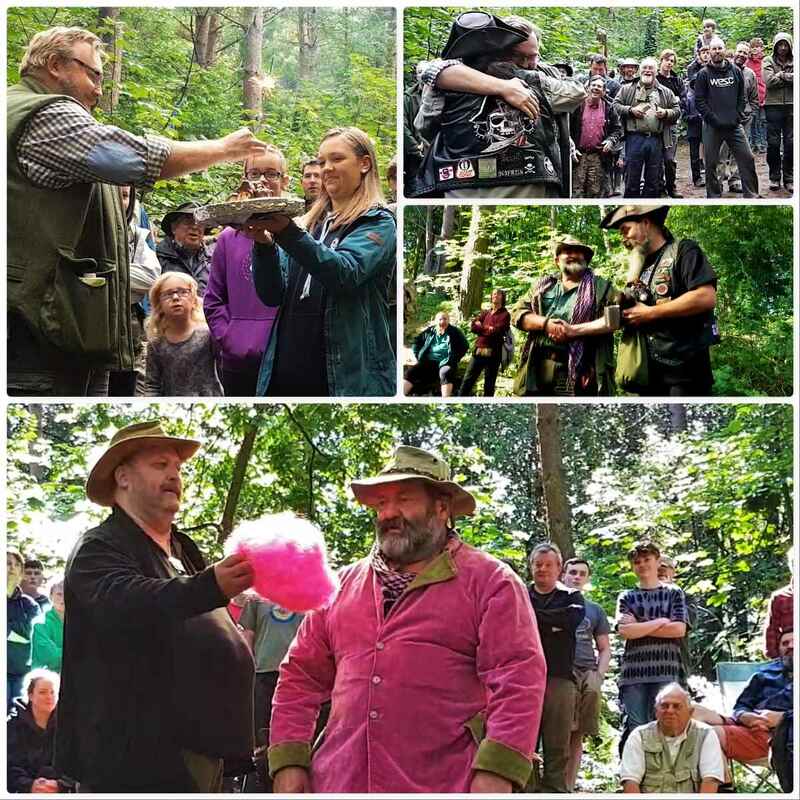 For those of you who have been following the series so far you will have gotten a feel of the wide range of activities on offer at the BCUK Bushmoot. 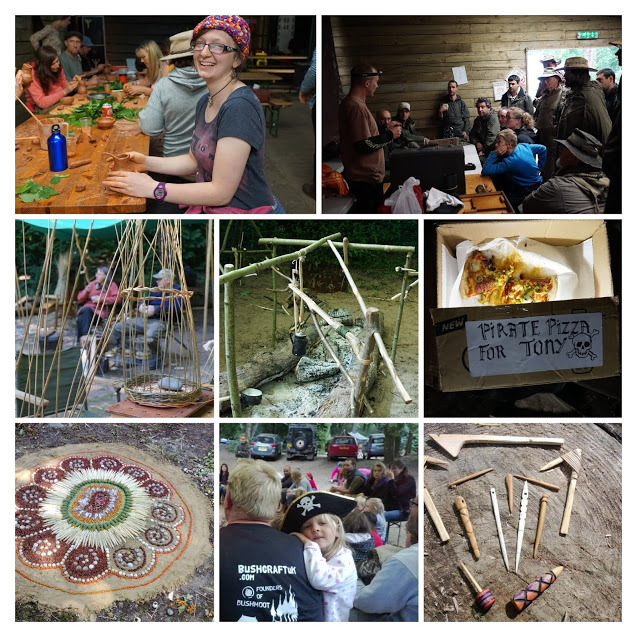 Some of you have contacted me to say you will be attending for the first time this year, which is great, however if you still have not made up your mind then don’t just take my word for it. 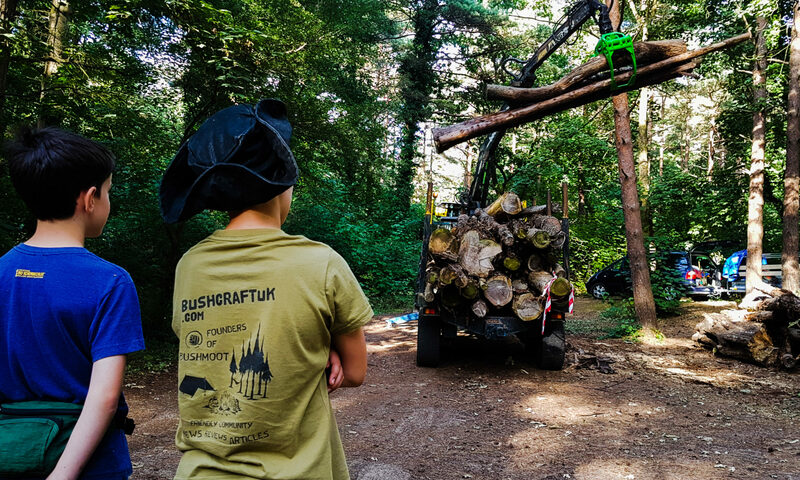 I contacted a number of BCUK members and asked them to send me their favourite picture(s) of the Bushmoot (either one they took or from someone else) and to say why it was their favourite. 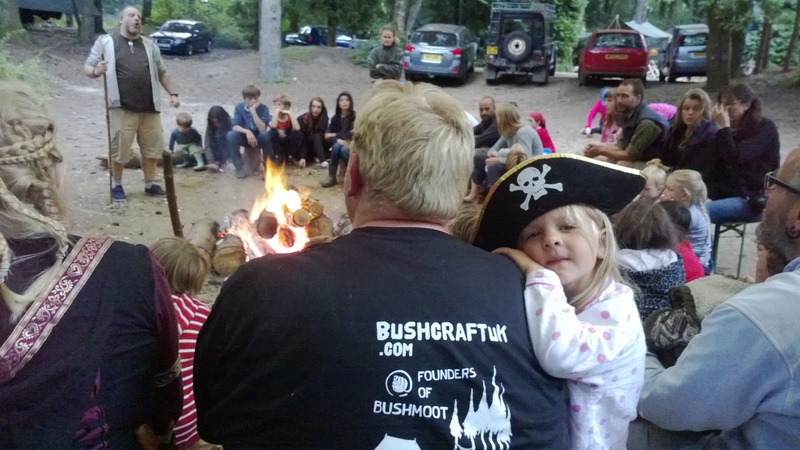 Charlie – This picture fully sums up the most important thing about the Bushmoot for me, which is the welcoming family. 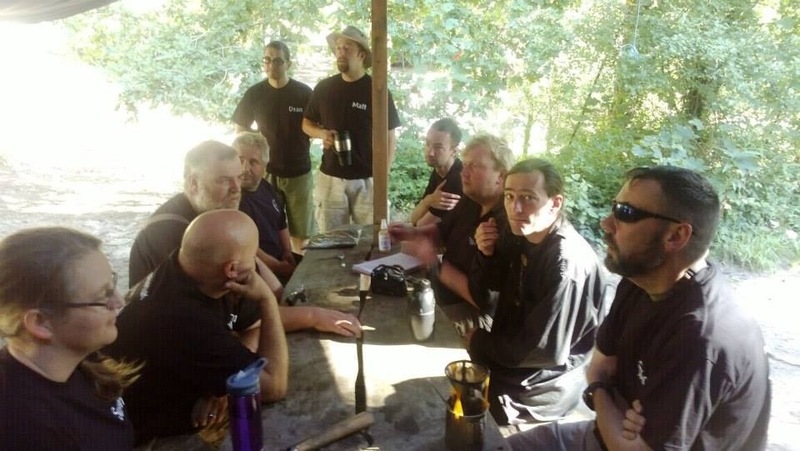 I first attended the Bushmoot in 2007 and that was only on a last-minute decision. 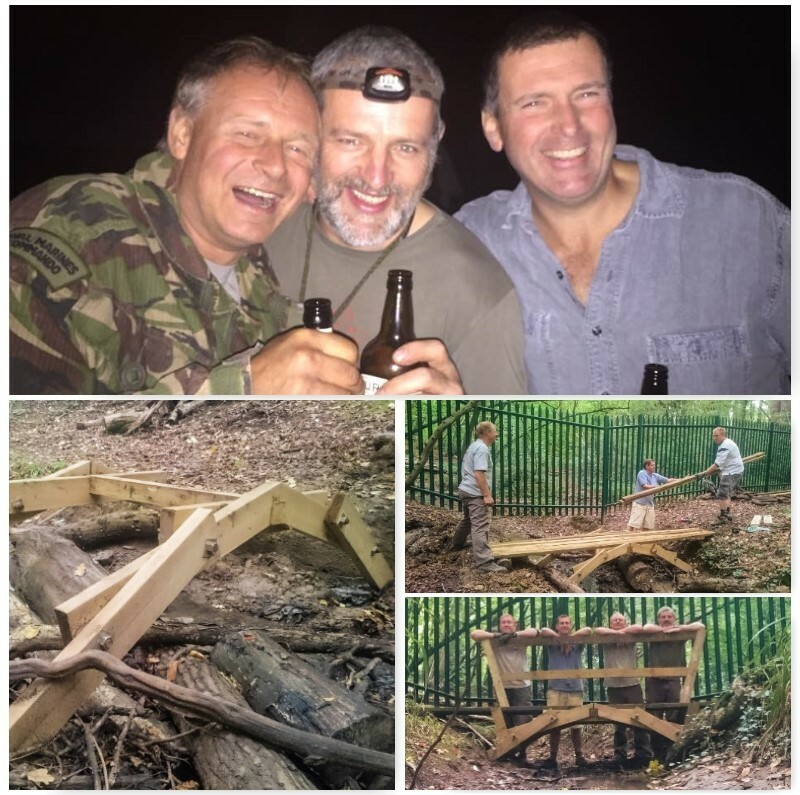 Having been encouraged by the willingness of the BCUK members to welcome you to the forum and share knowledge, I decided to take the plunge and attend the Bushmoot. It was with a feeling of apprehension that I drove down the lane from Merthyr Mawr. This feeling soon disappeared on booking in, where I was made most welcome by Tony and Shelley. 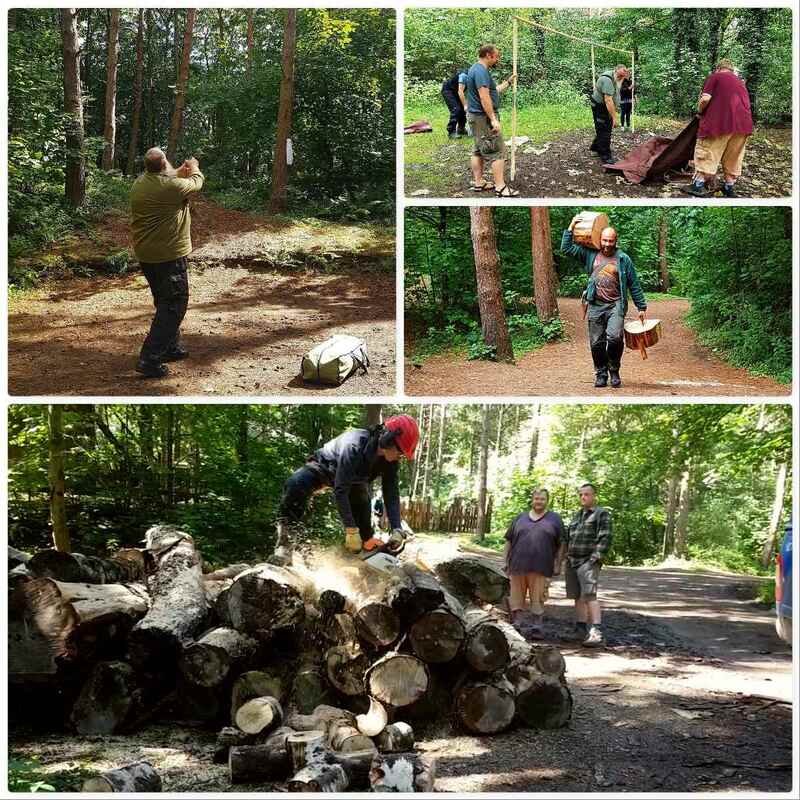 What followed was one of the most enjoyable few days I had spent in a long time, everyone you met made you welcome and they were willing to pass on skills. 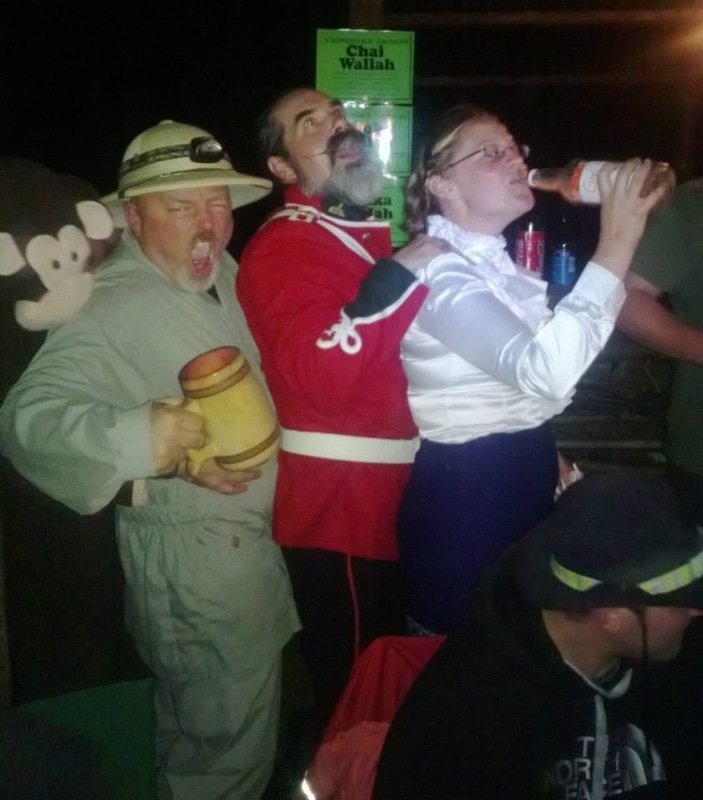 I can only hope I can continue to make newcomers to the Bushmoot feel as welcome as people made me feel. 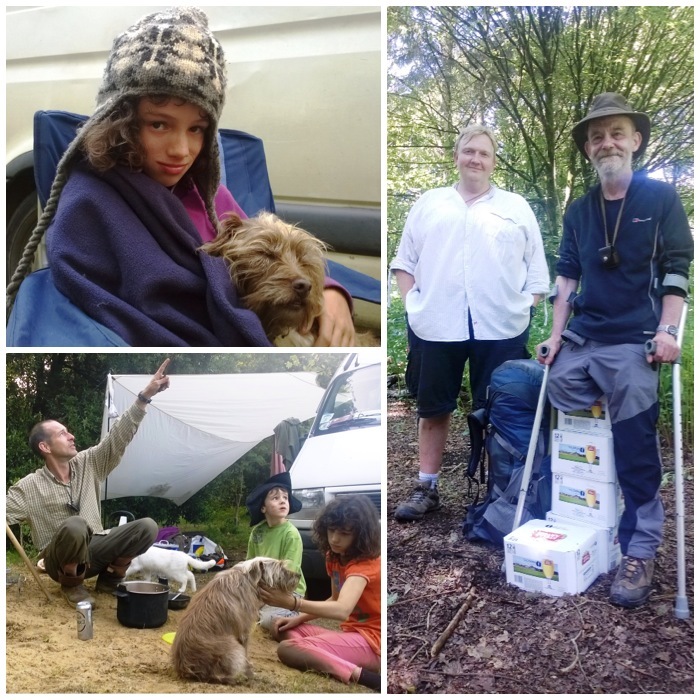 Ian – When I was asked by George to look through my photos and send him something that says why I enjoy Bushmoot, my first thought was to my boy. 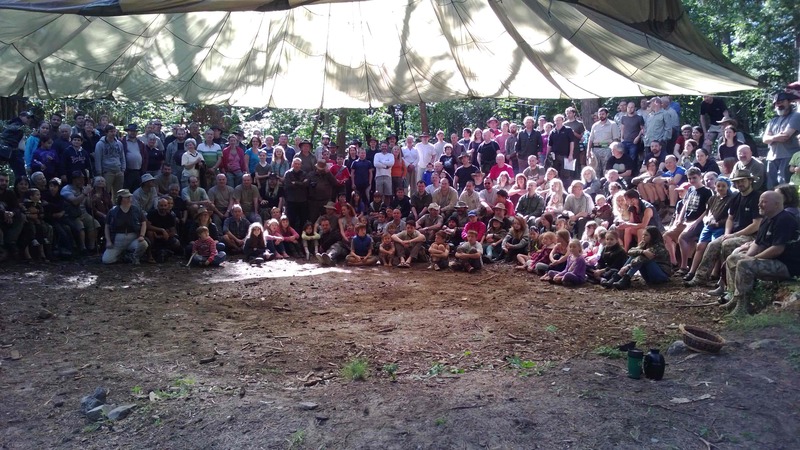 He and all the children play continually, coming back to camp only for food. 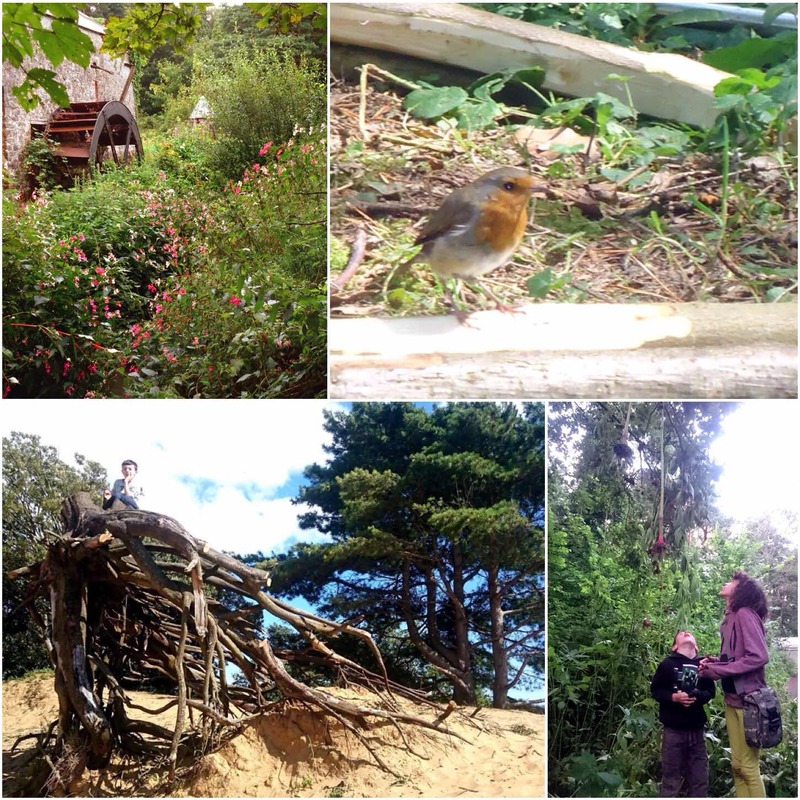 There is always something going on, and in an age of computer games, you never hear a child say “I’m board” when spending two weeks away from electricity. 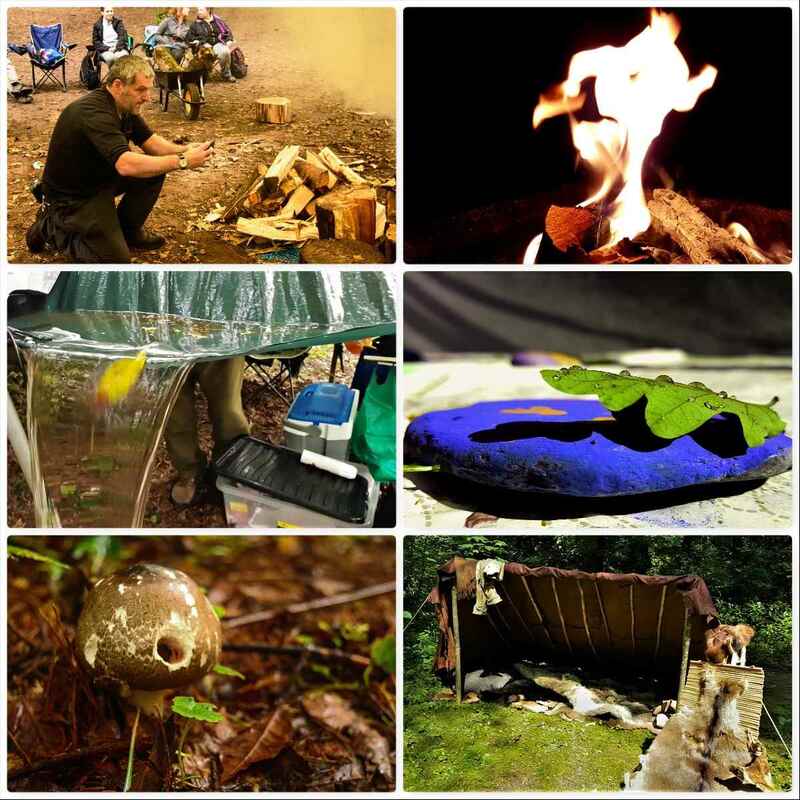 Wayne (Forest Knights)- The photo shows the spirit of the Bushmoot. 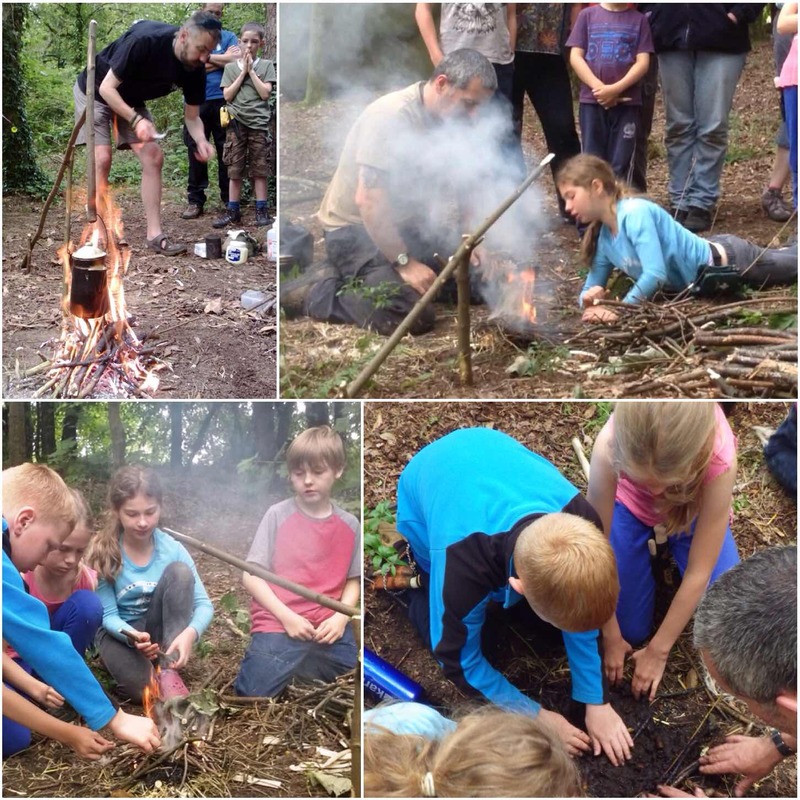 Sharing skills with other bushcrafters from the novice to seasoned instructors. 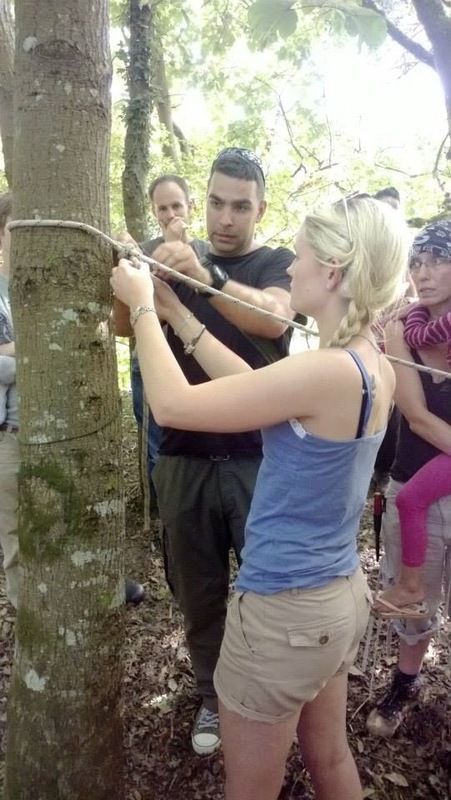 All come with a willingness to share their skills and learn from each other. Teaching Bhutanese bow making in such a beautiful location is a privilege. It is a joy to be part of the team. 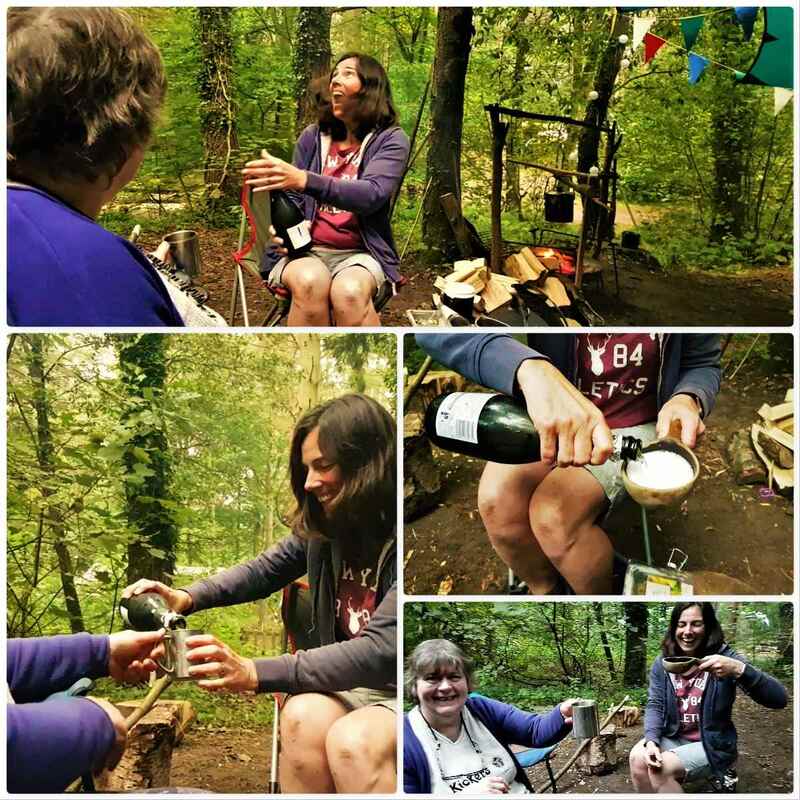 Susannah – The photo of a group of people toasting marshmallows reminds me of a couple of great things about the Bushmoot. 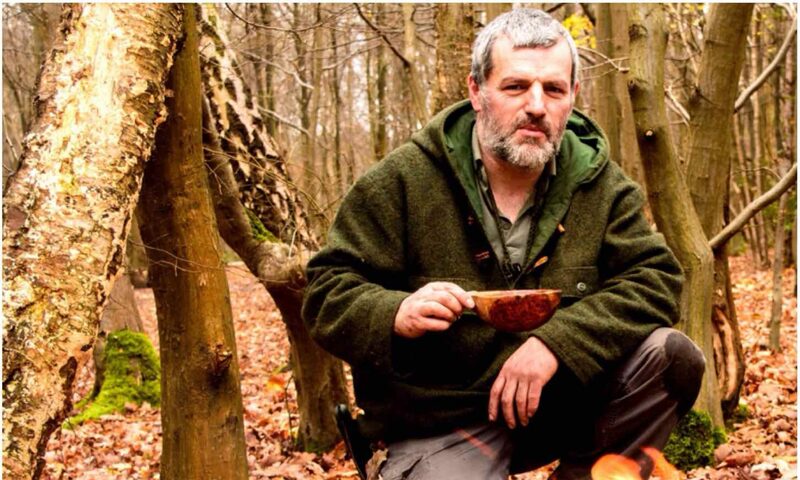 Firstly, woodland TV. 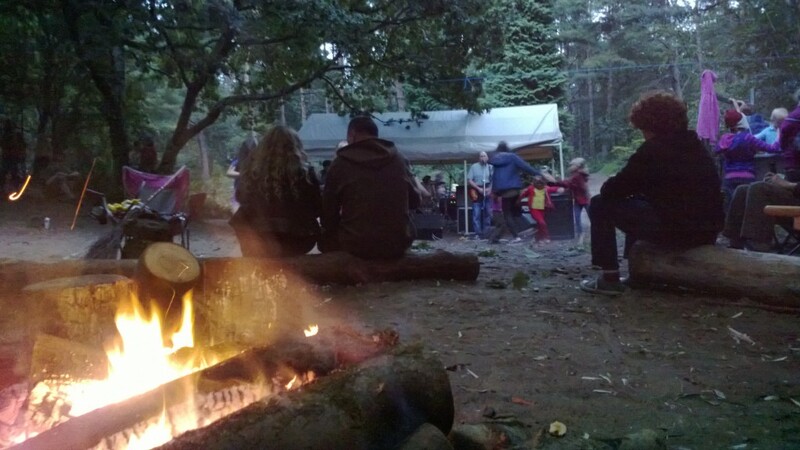 There’s nothing like a fire for socialising, quiet contemplation and a general feeling of well-being. 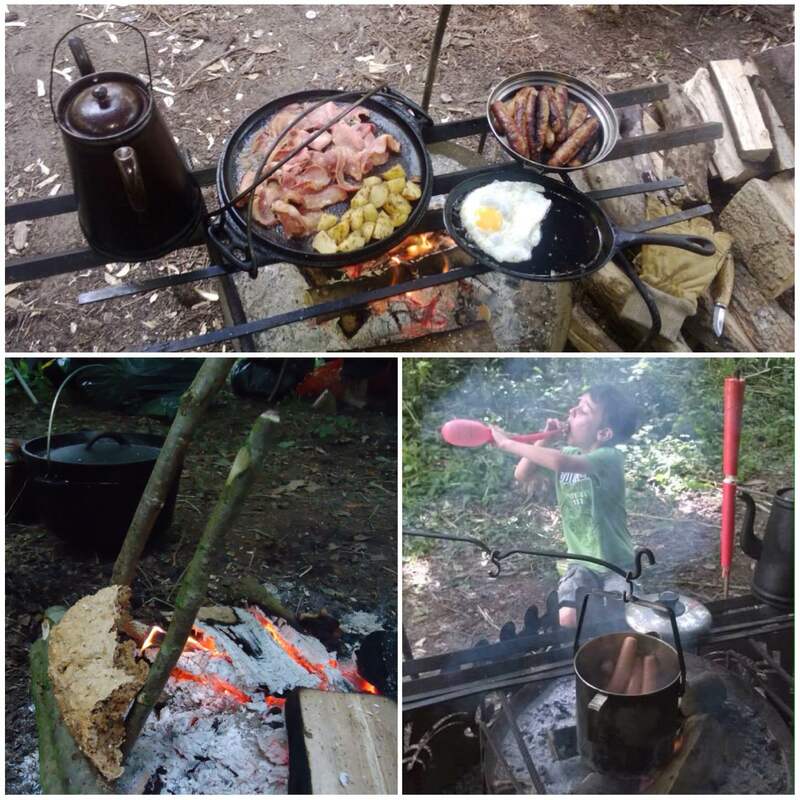 I do nearly all my cooking over a communal fire for the entire week, even my breakfast coffee, I love the smell of woodsmoke, sharing food around the fire and the flavour – everything seems to taste better! 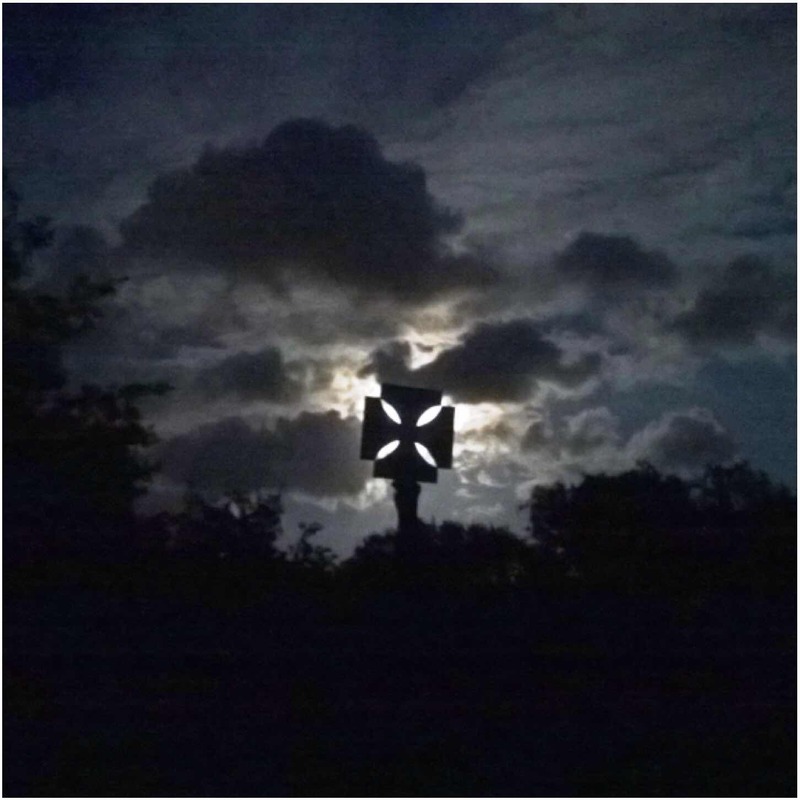 Secondly, this picture was taken on a night-time photography course in 2009. What you can’t see, is that this group of people had kindly allowed around 15 paparazzi to surround them and their fire to practice taking night time shots – a great testament both to the range of courses you find yourself doing and to the friendliness and helpfulness of the people you meet. 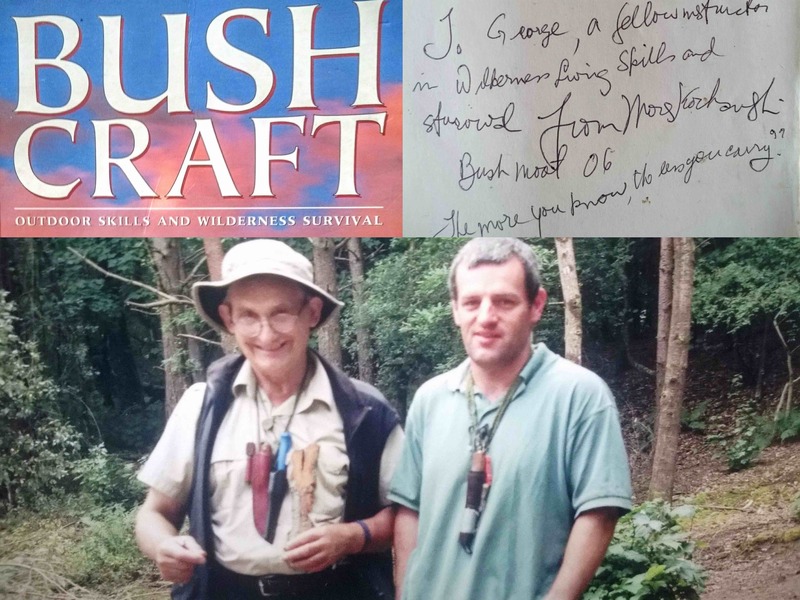 George – I put this little collage together after asking Mors Kochanski to sign my Bushcraft book at the Bushmoot. He asked me what I wanted written in it and I said whatever he felt like. Apart from his signature line of ‘The more you know the less you carry’ he signed it to ‘a fellow instructor’. That one line has stuck with me ever since. I worked at both Bushmoots Mors attended and as well as me attending his classes he visited some of mine too. 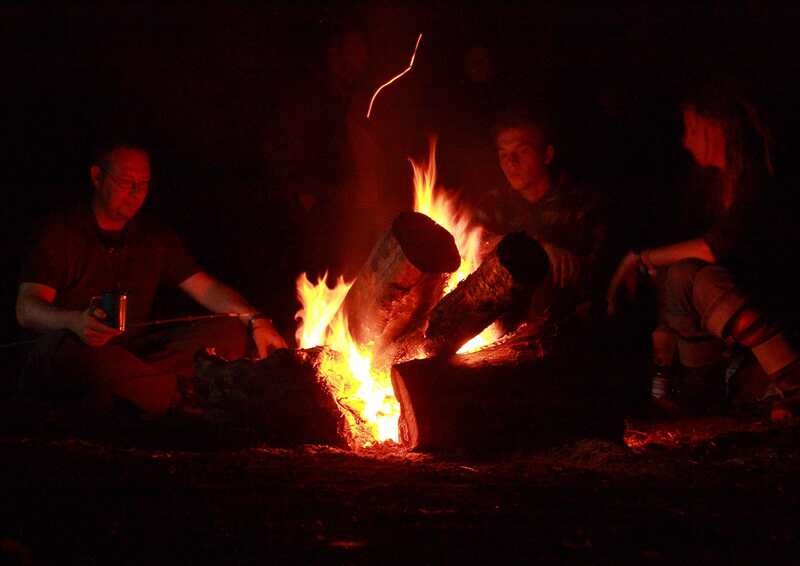 We spent many an evening sitting around the fire shooting the breeze and drinking beer. Tony – The Moot is a happy place, it’s also a relaxed place where we’re involved in sharing and creating, discovering and growing while making friendships and memories, where else would you get a group of guys excited about sewing machines, the loveliest pizza hand delivered and kids (actually it’s probably all of us) that go to bed tired, happy and looking forward to the next day of adventures. Well that is it for me in this series. 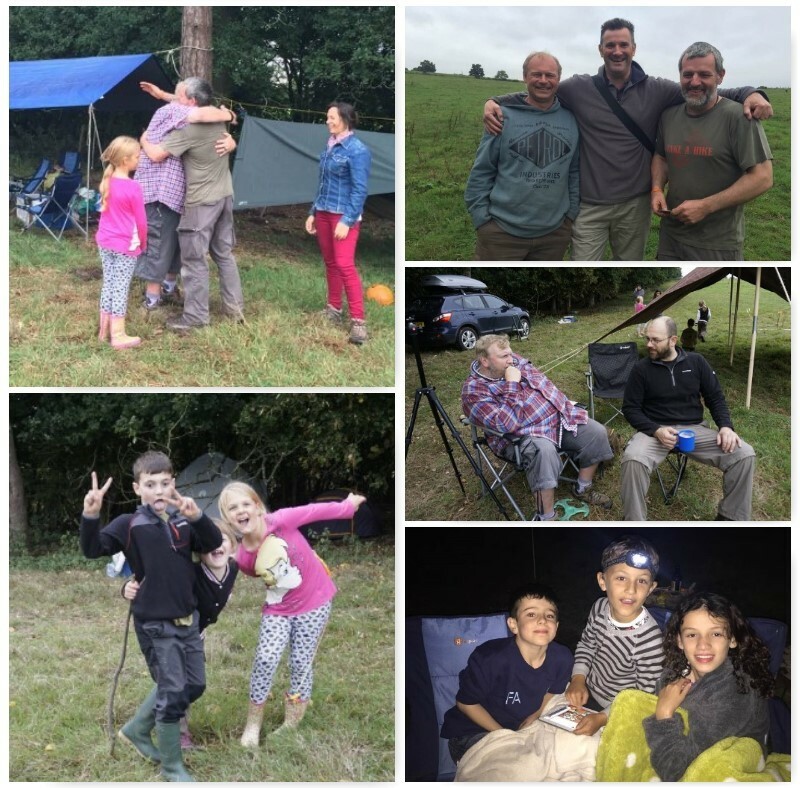 As Tony said the Moot is a ‘happy place’ so I am looking forward to once again attending this year with my family, seeing my ‘Bushmoot Family’ and having a few adventures along the way. Maybe I’ll see you there. 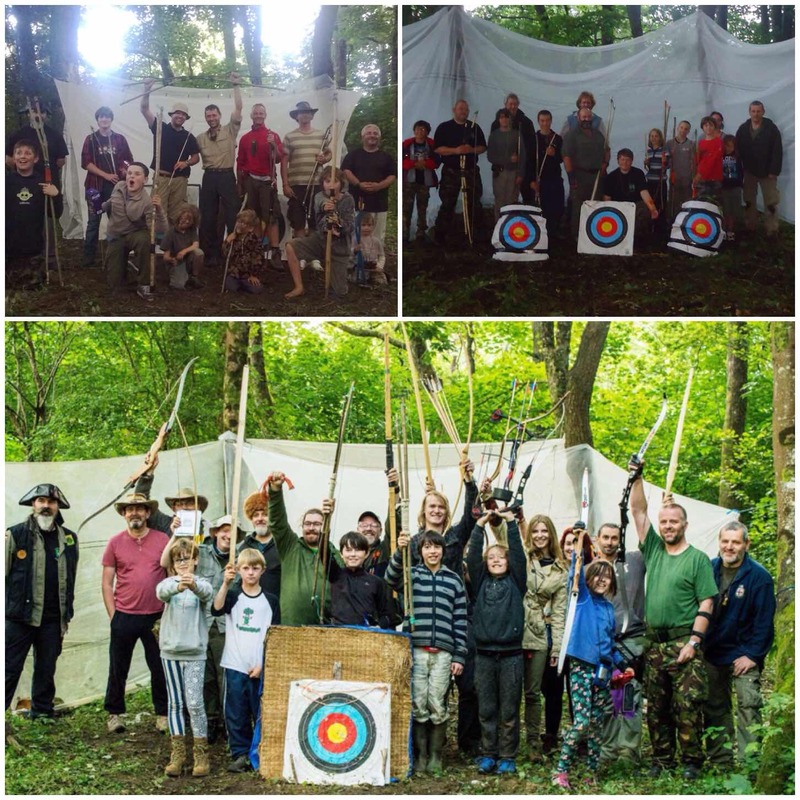 My annual holiday to the BCUK Bushmoot would not be complete without a bit of bow making and some time down on the range. 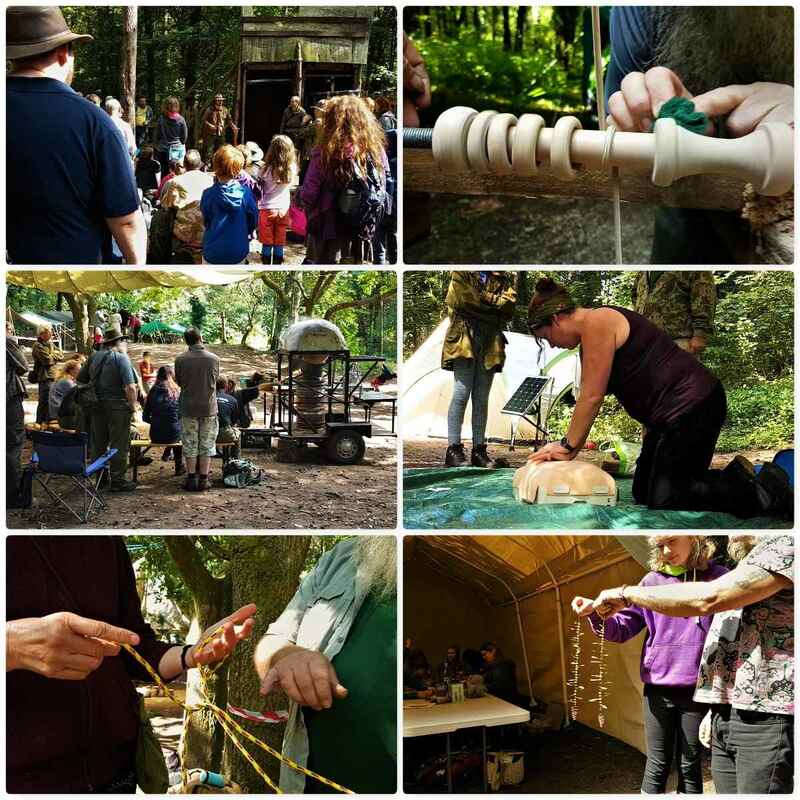 About ten years ago I was introduced to bowmaking by my friend Bardster (Paul Bradley). Bardster used to run workshops at the Moot which were always well attended. 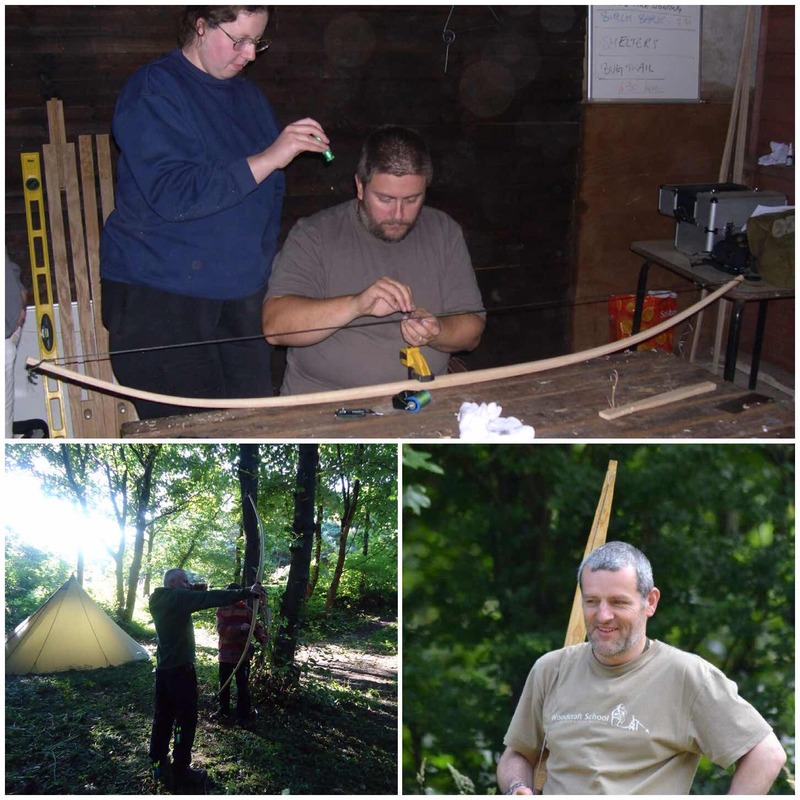 I then studied under John Rhyder of Woodcraft School and made a number of different bows from Ash Flatbows, Holmegaards and the Father & Son bow. 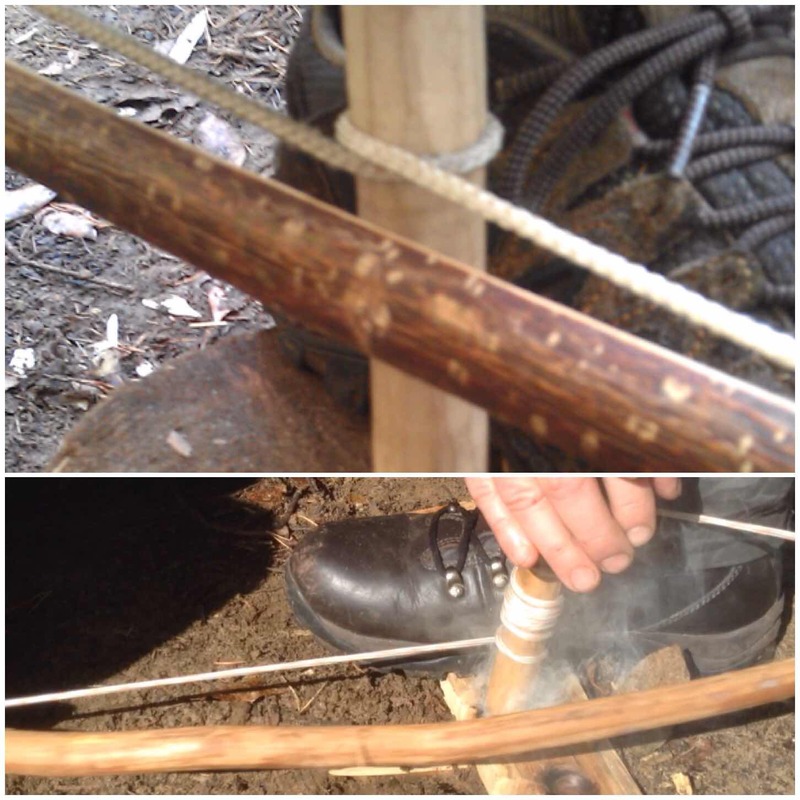 I introduced to the Moot a number of years ago the Father and Son bow (I had learnt this of my friend Mark Emery of Kepis Bushcraft) This is a ‘quickie’ bow to make and comprises two rods (usually hazel) strapped together. 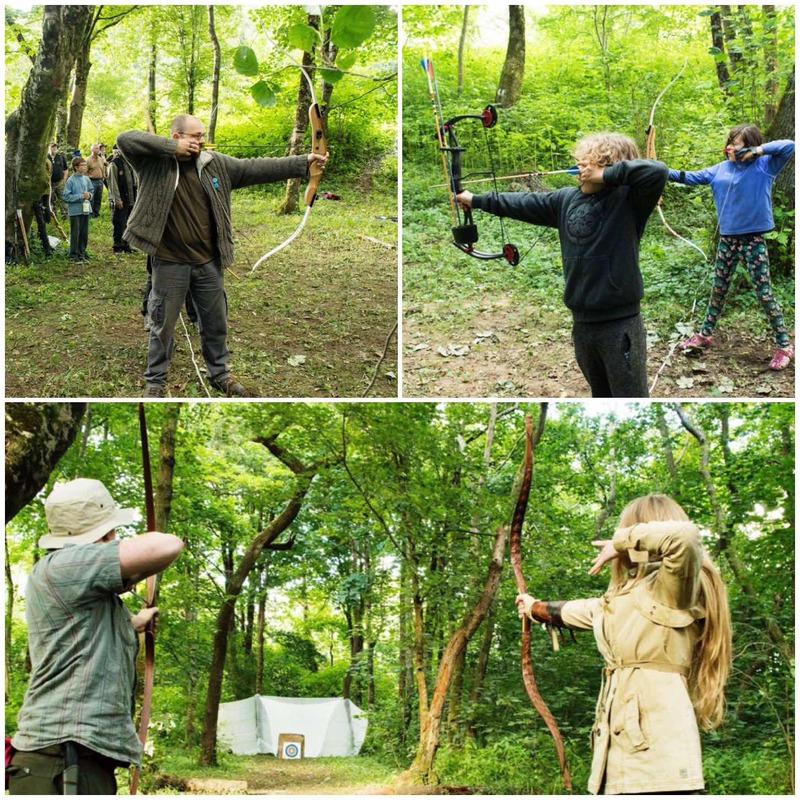 The bows take only an hour or two to make if you know what you are doing although they may take up to a day to make if you are new to it all. 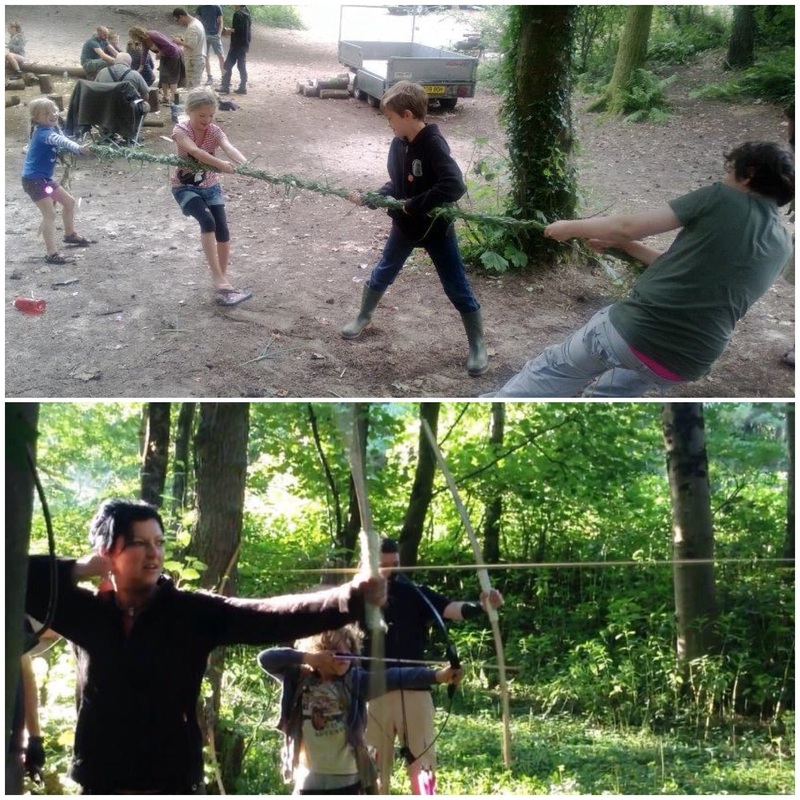 I have run quite a few classes over the years at the Moot on the Father & Son bow. 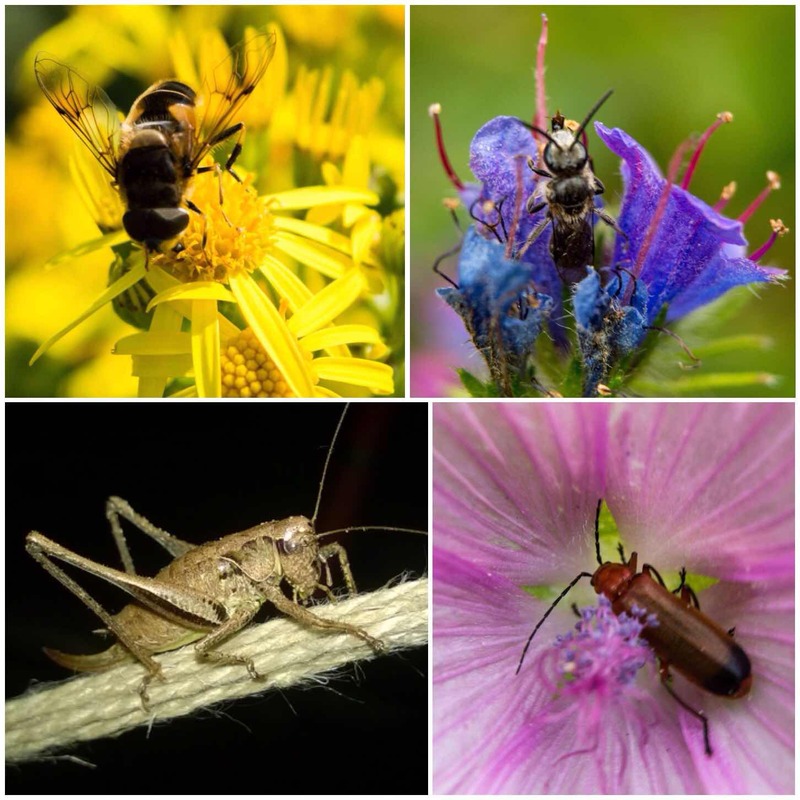 As you can see in the pictures below they were large classes. 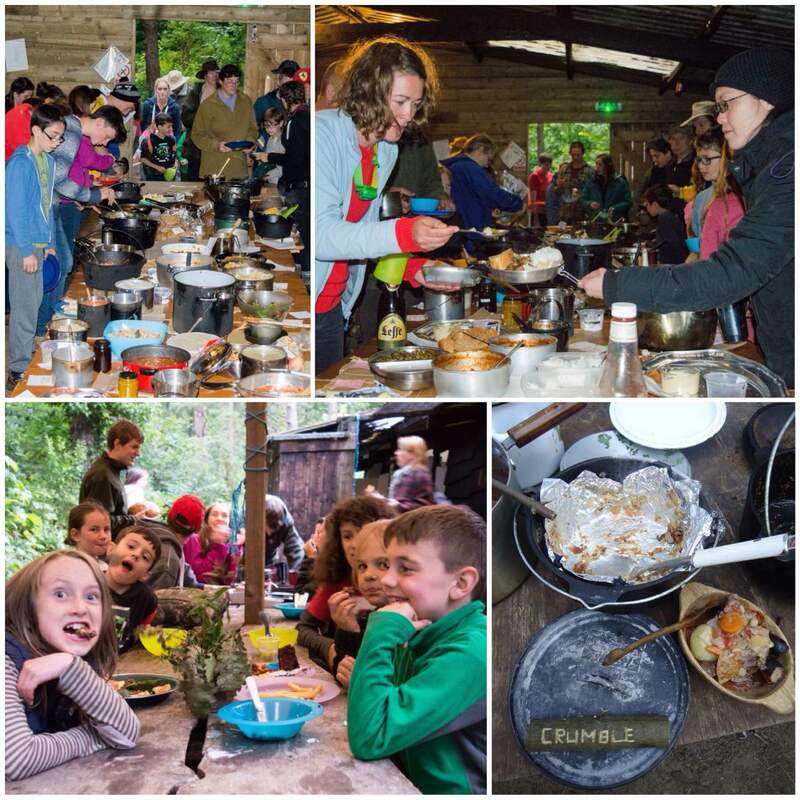 Nowadays Chris Pryke runs this class and it is well attended each year. The bows if made properly can last you years. I still have and use my first one which is over 6 years old now. 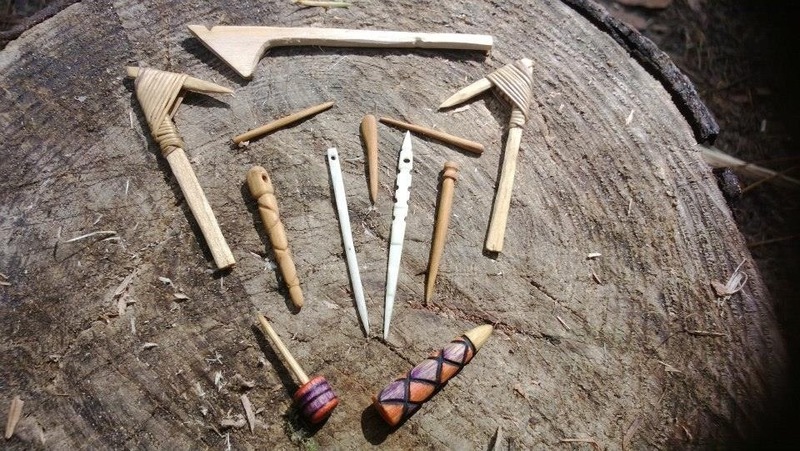 I have had hours and hours of fun making and using these bows over the years. They are cheap to make, very accurate with practice (normally I shoot them between 10 and 20 metres) and will shoot on a high arc about 60 to 70 metres. 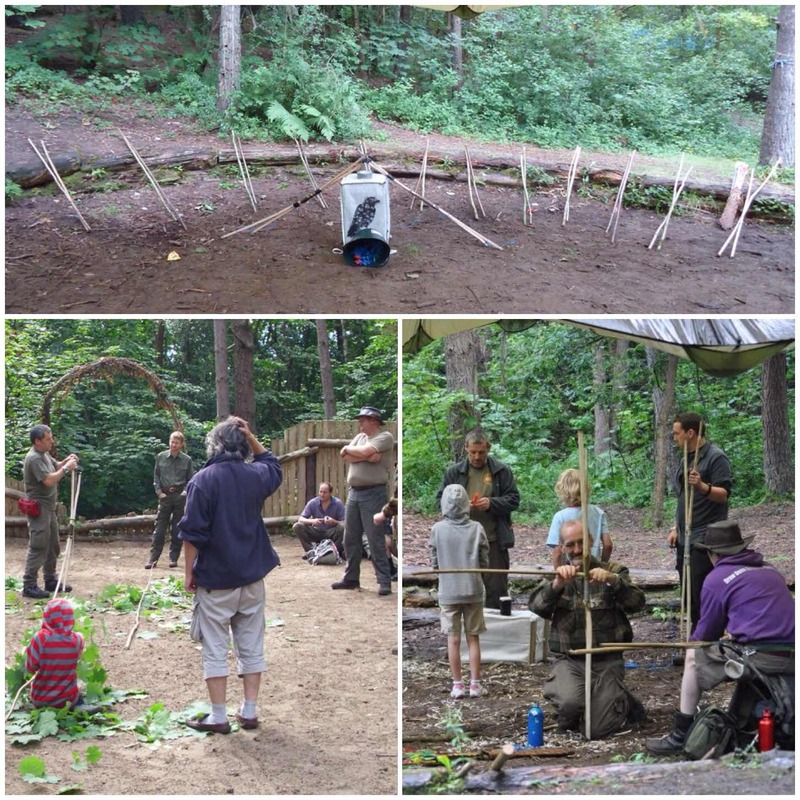 The bow is constructed of two separate pieces of bamboo joined in the centre. The join can be with, tape, cord or with pins. Most folk who start one of these bows can be found down on the range in the evening. 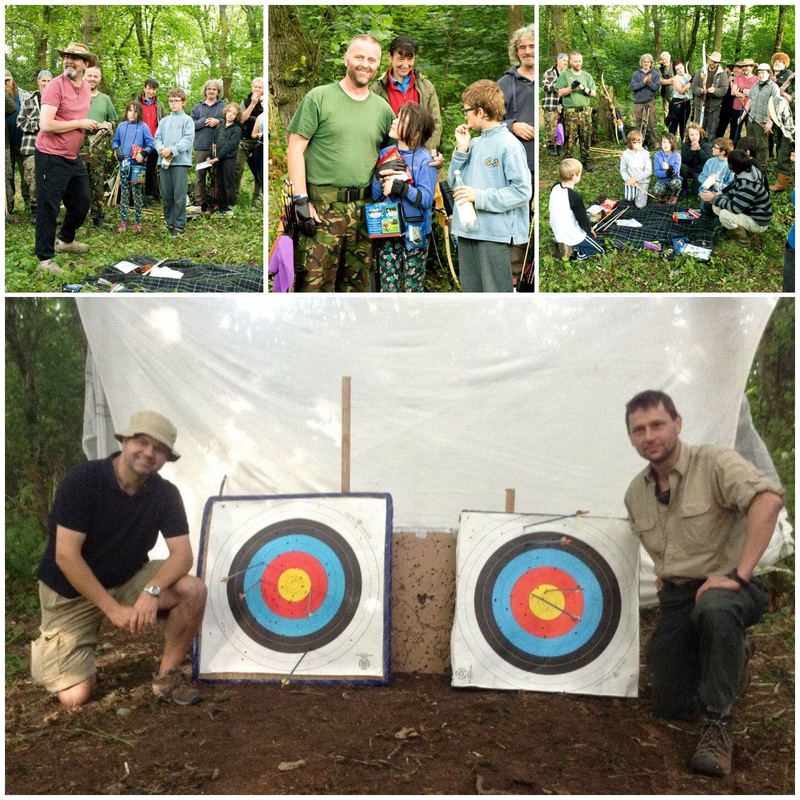 We started the range at the Moot about six years ago. 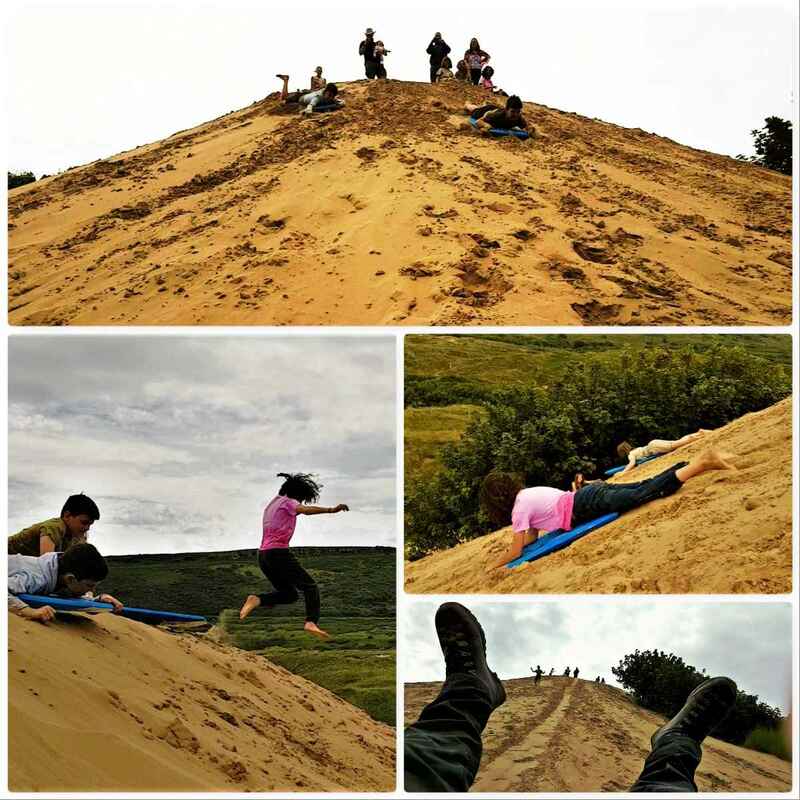 it is well away from all the camping areas surrounded by wooded sand dunes. 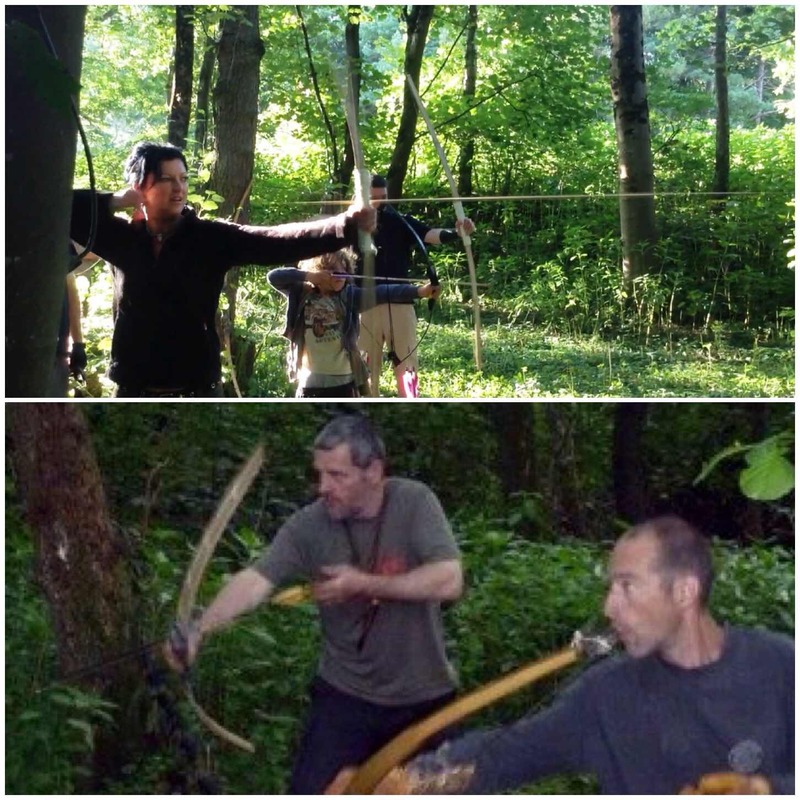 There are two Bhutanese bows in the top picture below in action and I am holding one in the bottom picture below. 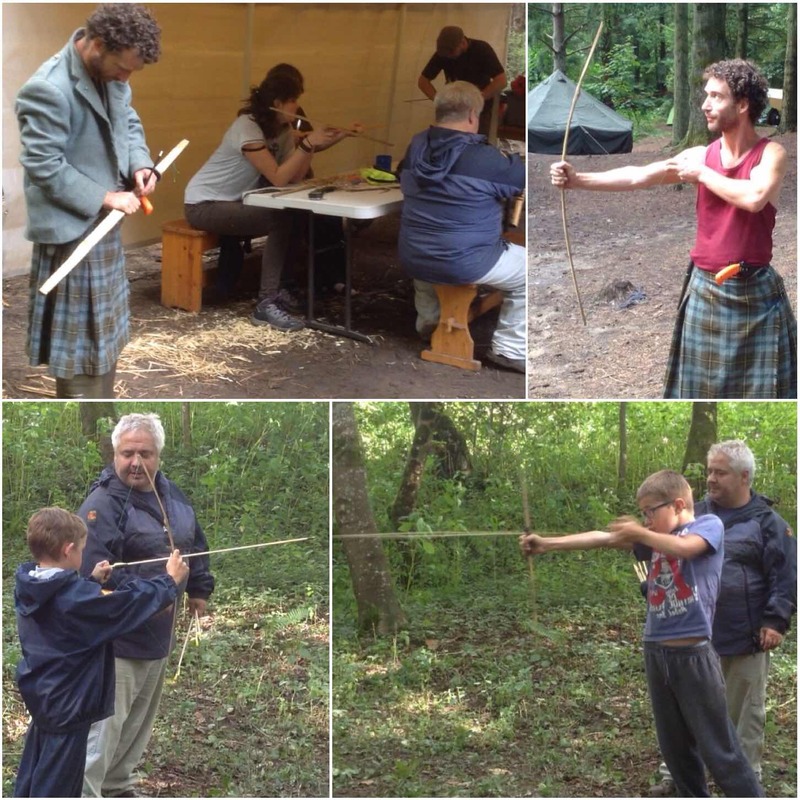 Wayne sometimes runs workshops similar to the ones Bardster did in the past making more traditional style flatbows. 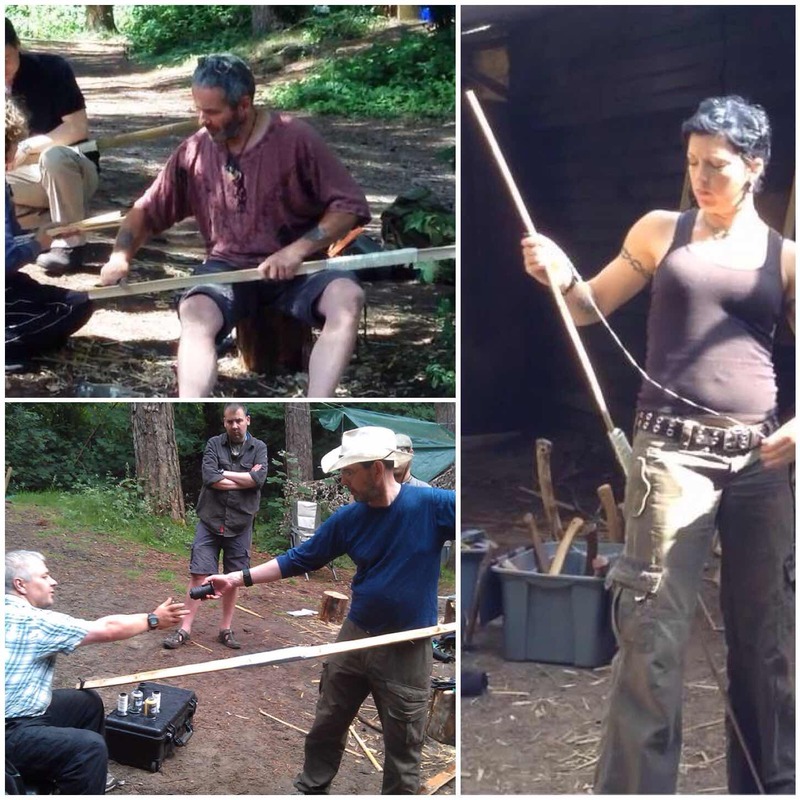 I hope to one day make time to study under Wayne as it has been a few years since I have made an Ash Flatbow. 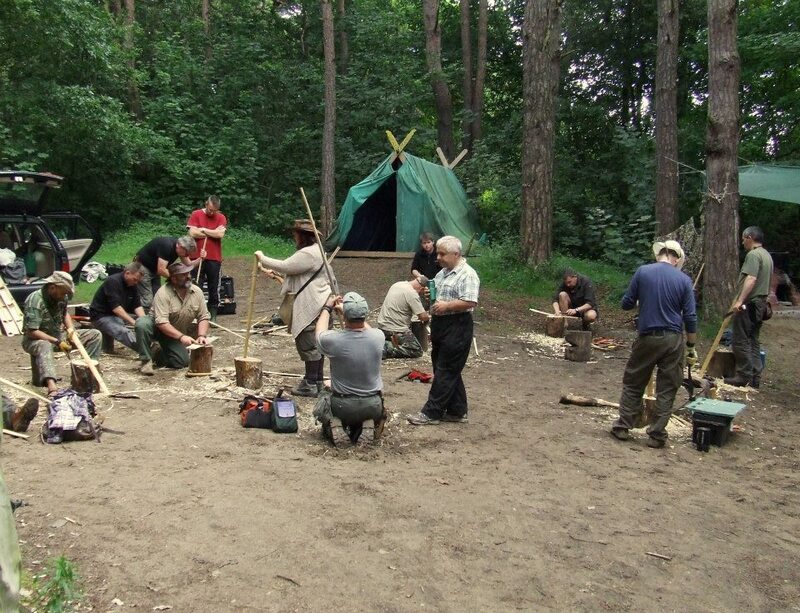 The final type of bow that is produced at the Moot is the Mini bow. Wayne uses the large pieces of bamboo he brings along for the Bhutanese bows to also make these very small Mini bows. The kids absolutely (and a few adults) love them. They do not take long to make and are small enough to be made as one piece. 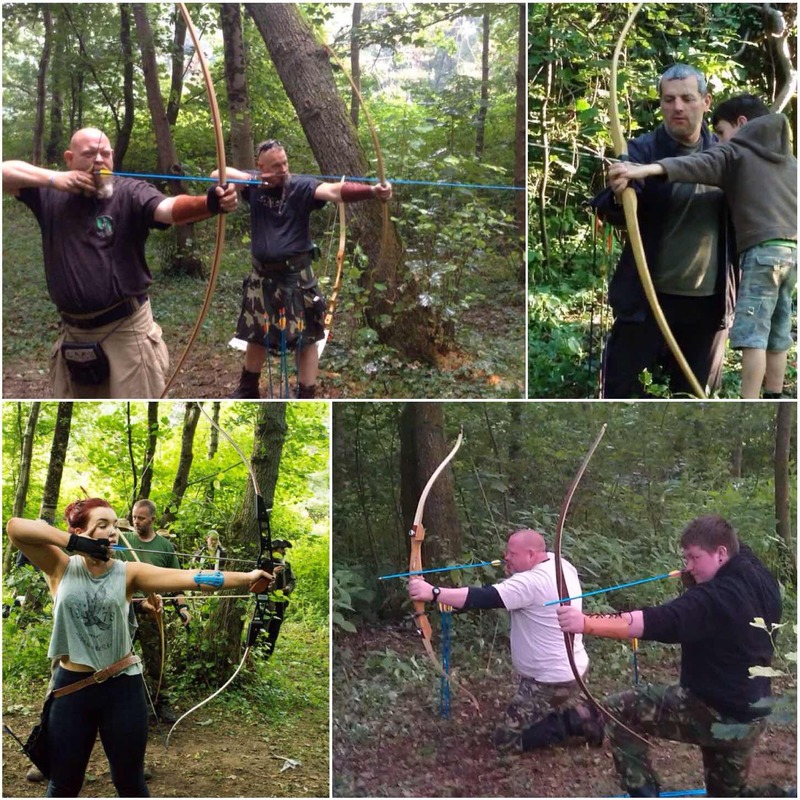 On the range you will see a wide variety of bows in action from the traditional (top two have my Ash Flatbow and my Holmegaard in use. 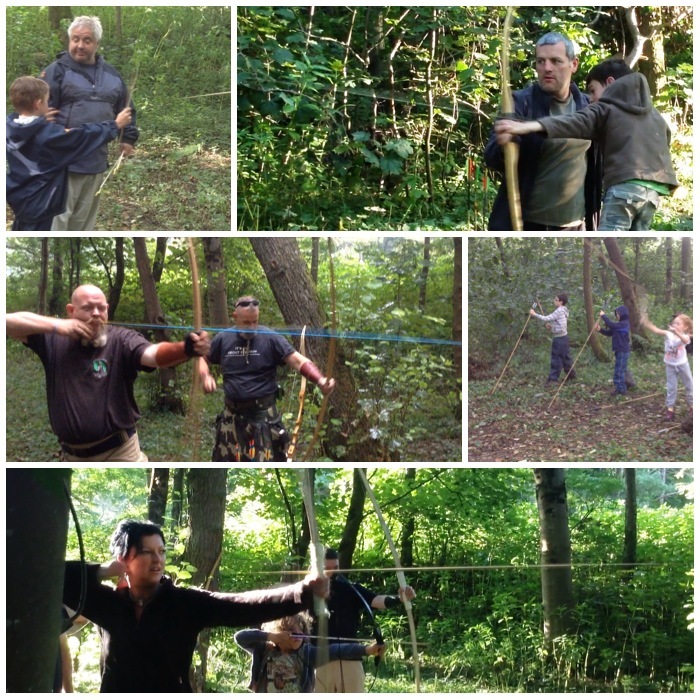 Below them are some of the modern bows people bring along to the Moot. Some are very powerful and come with all manner of attachments. 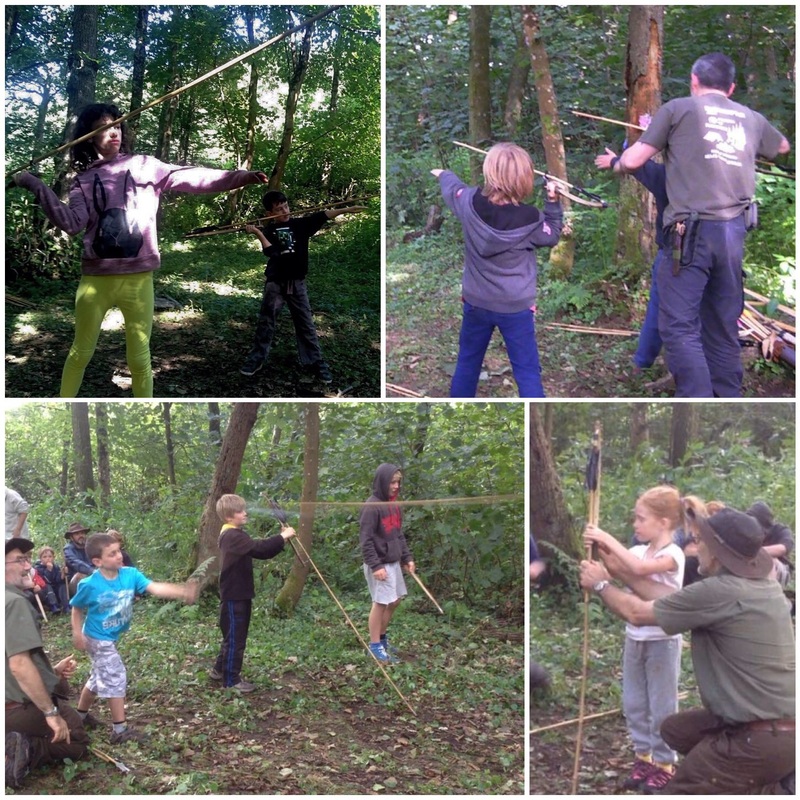 When it comes to the competition we hold we do not mind what type of bow you use as long as it does not have extras such as stabilisers, sights or gears attached. 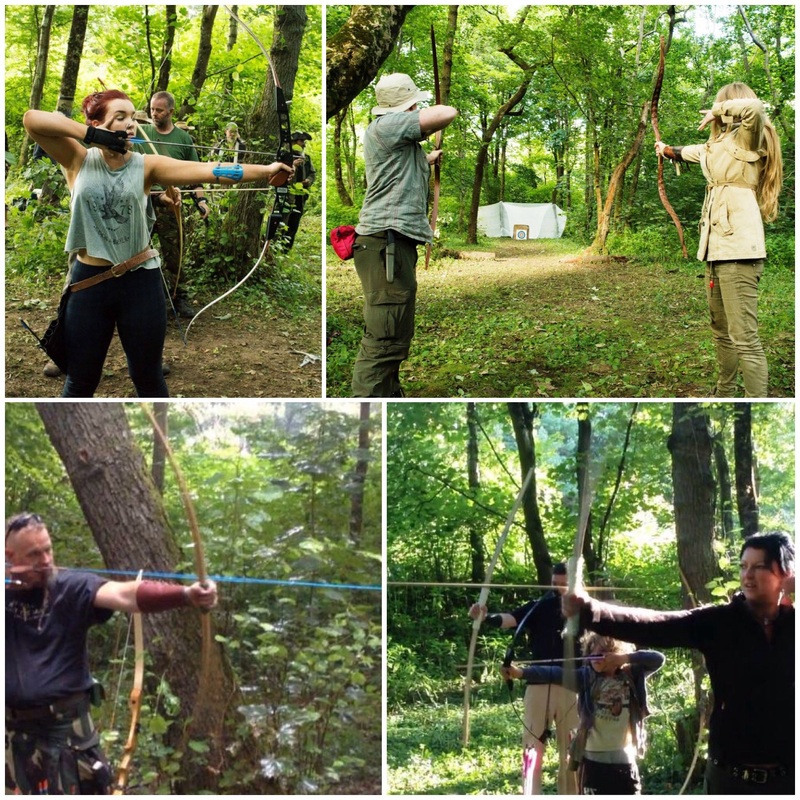 I am always intrigued with the different bows that appear and was particularly interested in the Mongol style bow Lisa had brought along as I had never seen one before (bottom right). 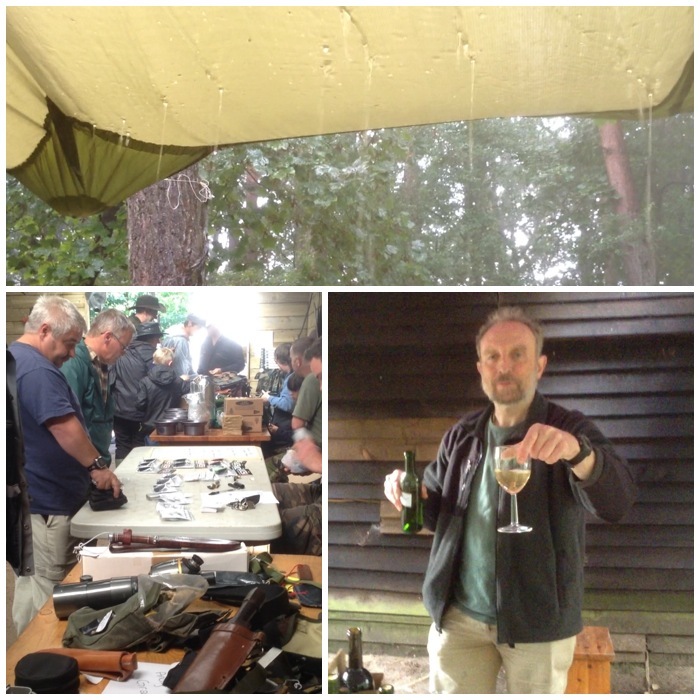 Each evening during the Moot (and sometimes during the day) a few of us troop down to the range for a shoot. Running the range is usually Cap’n Badger, Paul Pomfrey, Ian Woodham and myself. 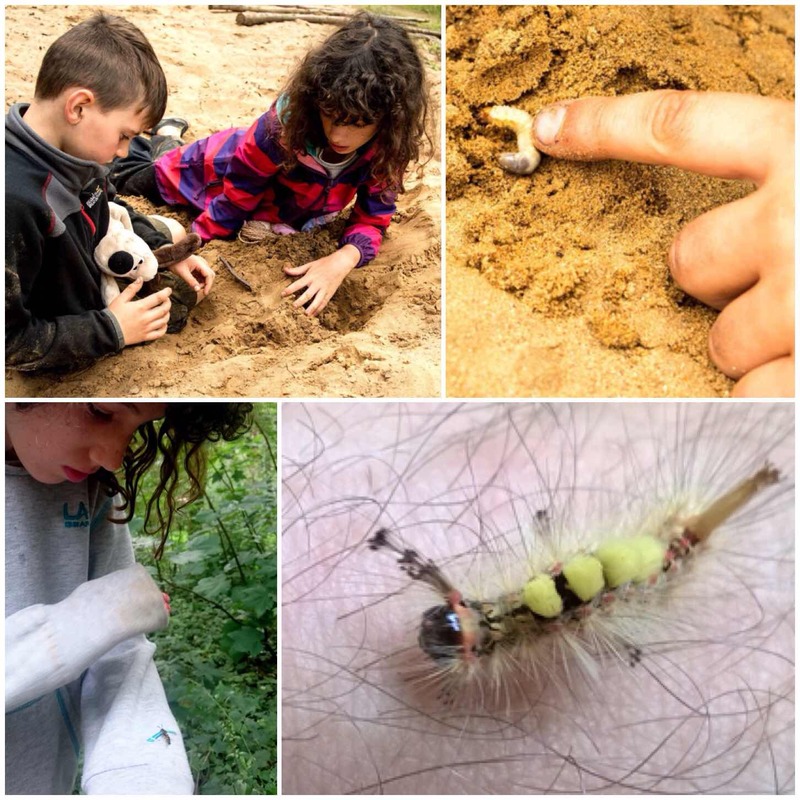 We try and balance the time between teaching novices and letting the ‘Old and Bold’ have time to keep their eye in. 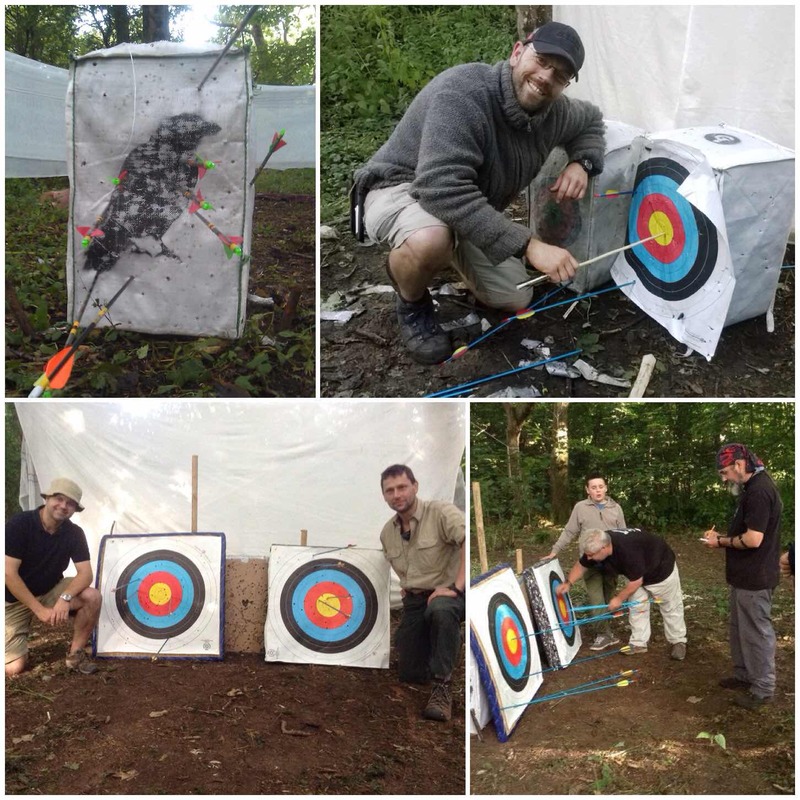 After a full days teaching bushcraft having to do this can initially feel like a chore to me however once I have shot in a few arrows it can be quite relaxing, especially after a very busy day. Competition day happens usually in the second week of the Moot and it gets very competitive. 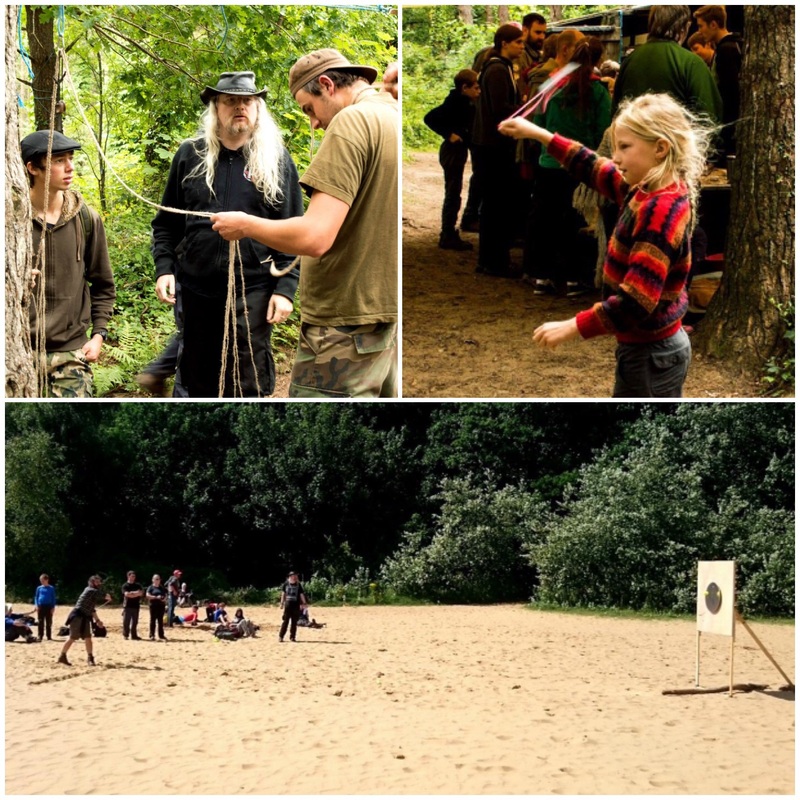 We normally run two competitions, one for the kids and one for the adults. They have to shoot at different ranges and are closely marked by the referees as there are usually some very good prizes up for grabs. Afterwards when all the scores have been tallied up the thing I really like about this time down on the range is how good natured everyone is. The winners get first dibs at the prizes (everyone brings a prize for the pot with a few extras donated) however everybody walks away with a prize at the end. 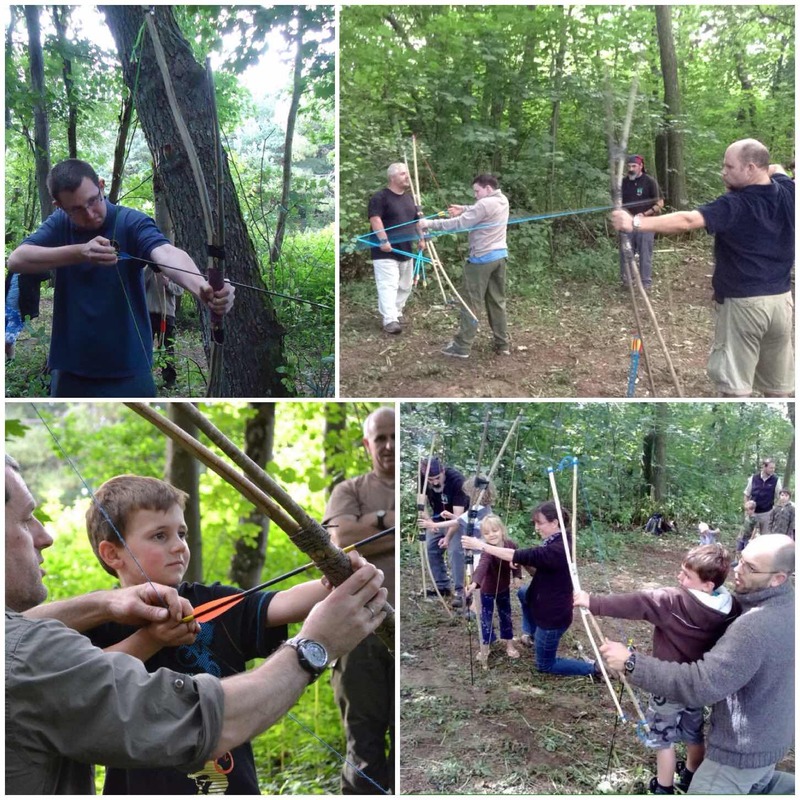 I have been to many different types of bushcraft shows, courses and meetings over the years but it is only at the BCUK Bushmoot that I see such a wide range of archery on display. 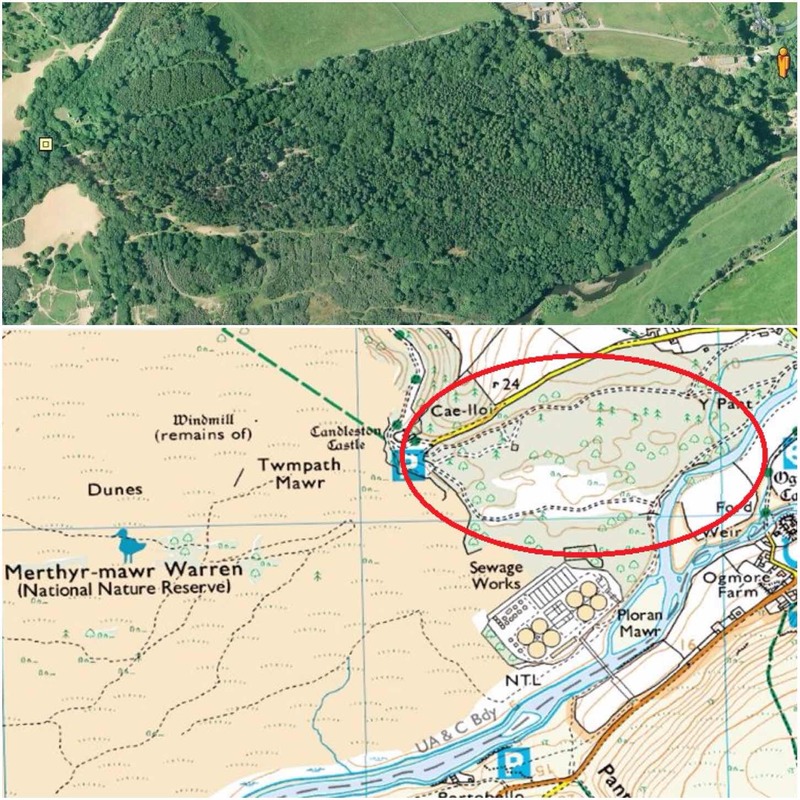 The Bushmoot (referred to generally as the Moot) is an annual event here in the UK and for many years now has taken place at Merthyr Mawr in South Wales. 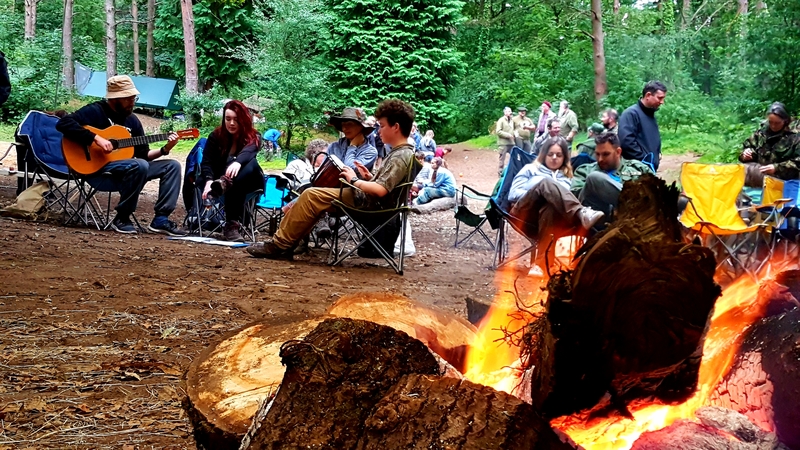 The name Bushmoot comes from the word Bushcraft (as popularised by Richard Graves and Mors Kochanski) and the Saxon word Moot (used to describe a gathering of people). 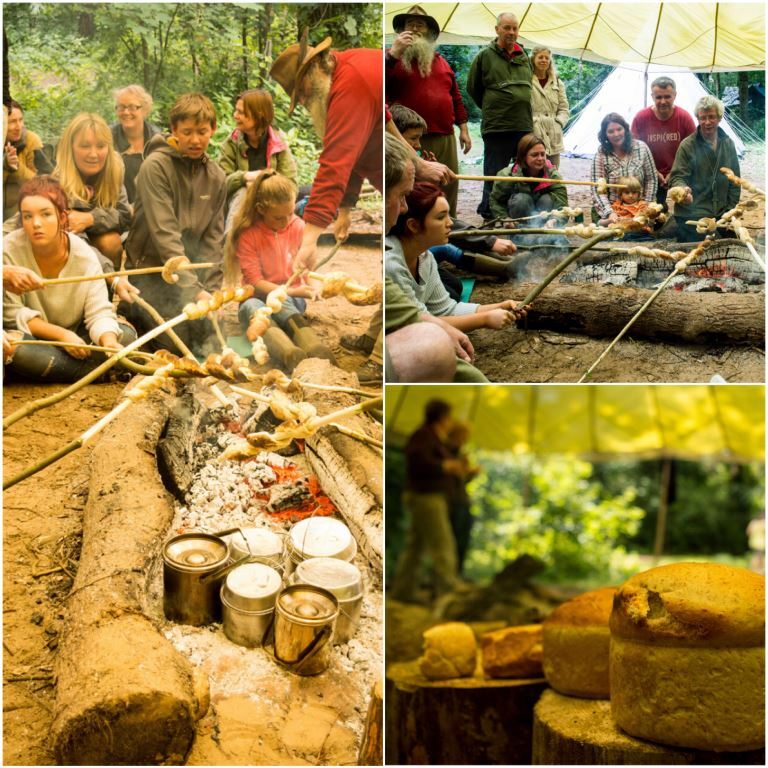 I like the Moot as it is a gathering of like-minded people with a multitude of skills to share with each other. 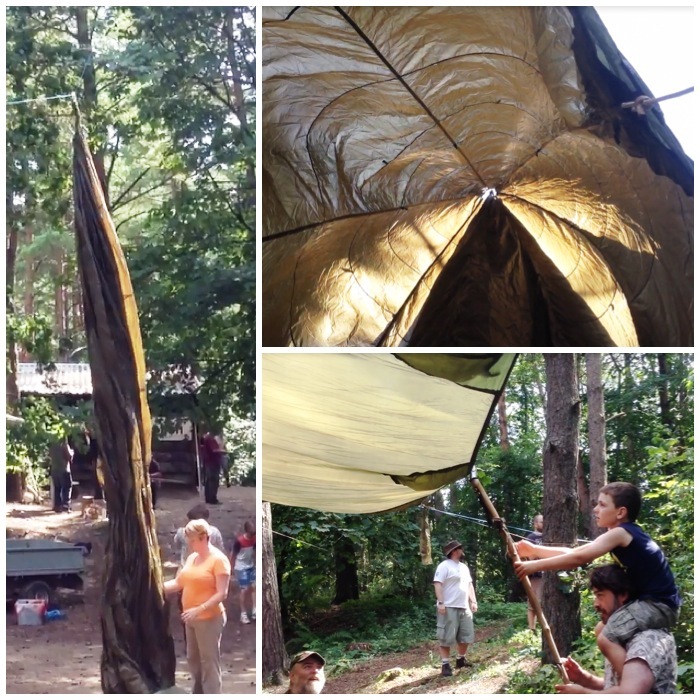 Not only can kids run free and have fun but so can the adults and I am a firm believer in learning through fun . 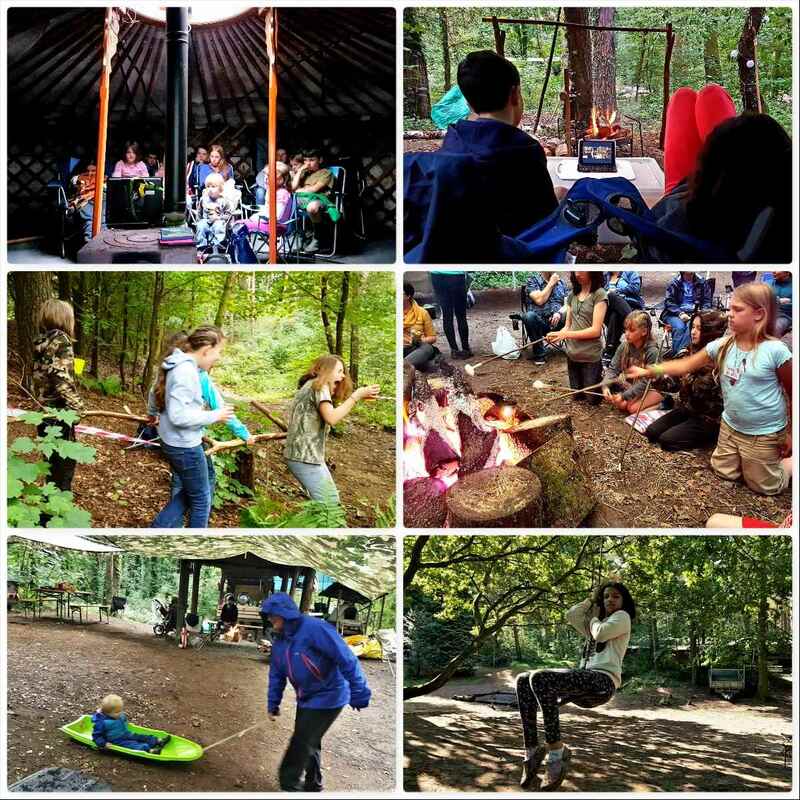 I am writing 10 blog posts on the Moot this year and this first one is on the theme of Learning. I tried to write just one post however I really struggled to choose just a few pictures out of the many hundreds I took. My wife Alison suggested a number of short blog posts on different themes from the Moot and so here we are. 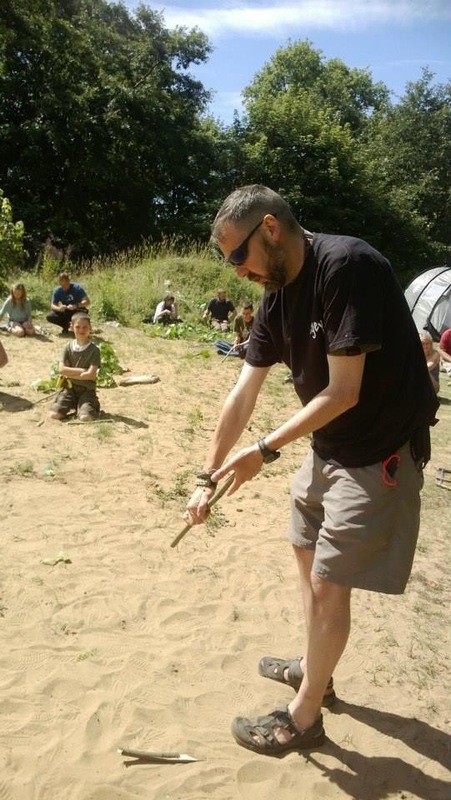 A couple of well-attended courses nowadays are the Starter course (a full breakdown of the course can be seen here on the BCUK site) and the Spoon carving course run by Dean Allen. 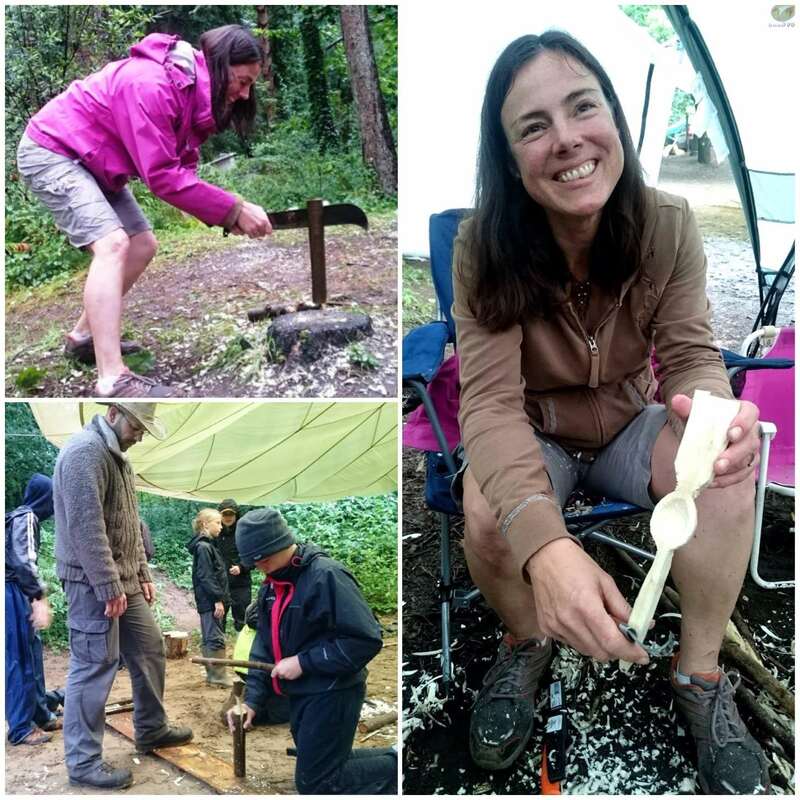 Alison and our kids did the spoon carving course this year with Dean and carved their very first spoons. 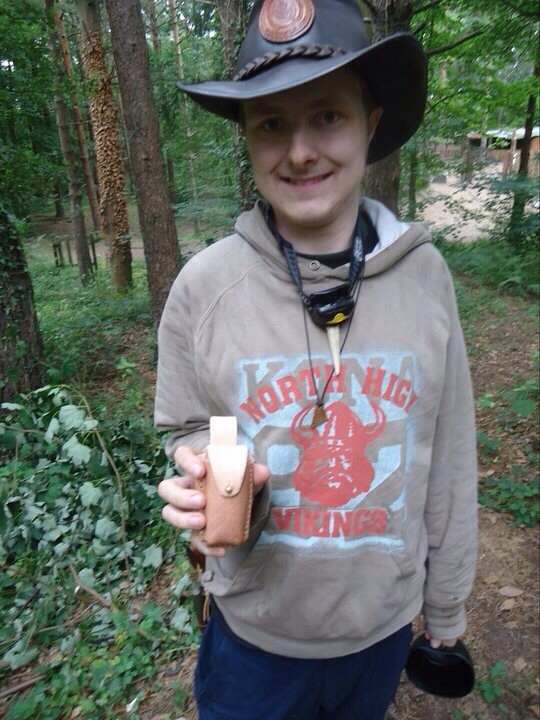 I managed to fit in a few courses this year and did a cracking traps course with Perry McGee. 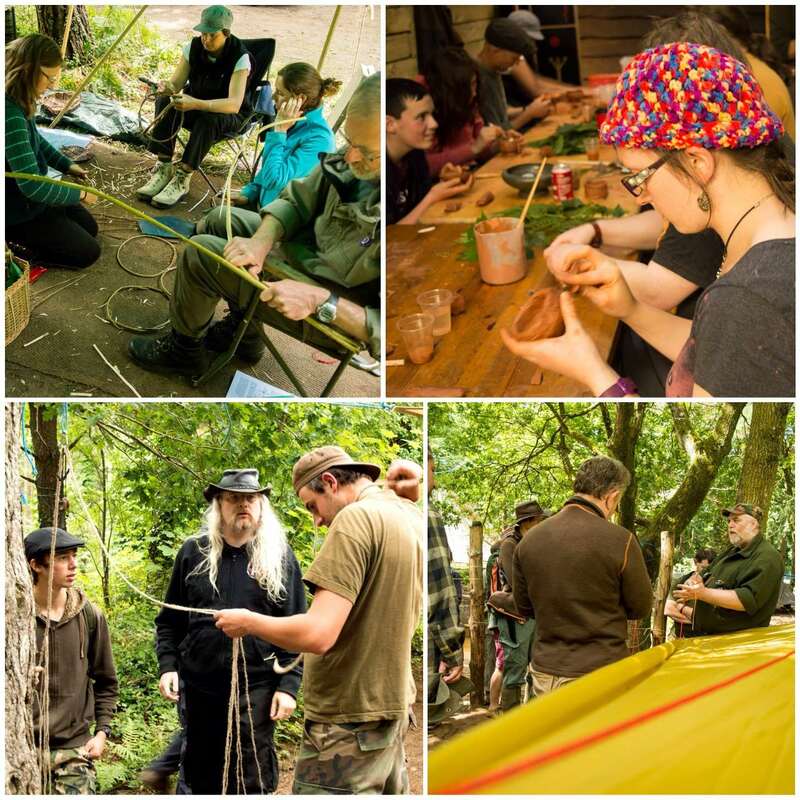 The Moot is usually run over 2 weeks with a core 5 days in the middle where many short courses (2 hrs to 1 day) such as fire making, bow making, spoon carving, tarpology, knife safety, axe work, net making, cordage making, bread making, foraging, atlatl making and knotwork, to name just a few, are run. 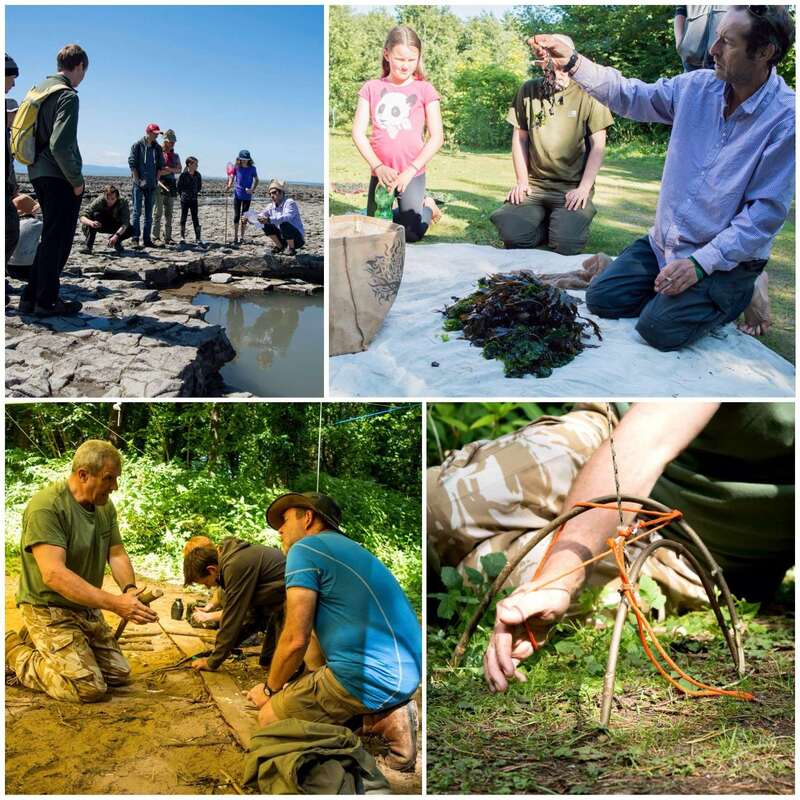 There are other longer courses run either side of the core days (with an additional fee) such as an accredited First Aid course, Bhutenese bow making, coastal survival, tracking and lobster pot making with willow. 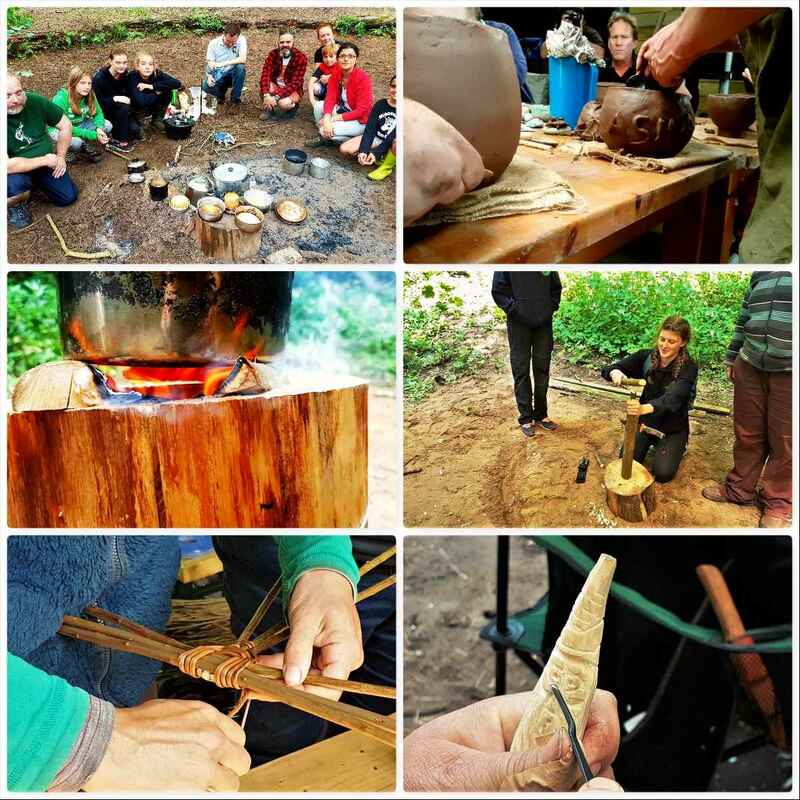 Many of the courses are based on using different materials, from basket making, pottery, sling making to learning about different knots. 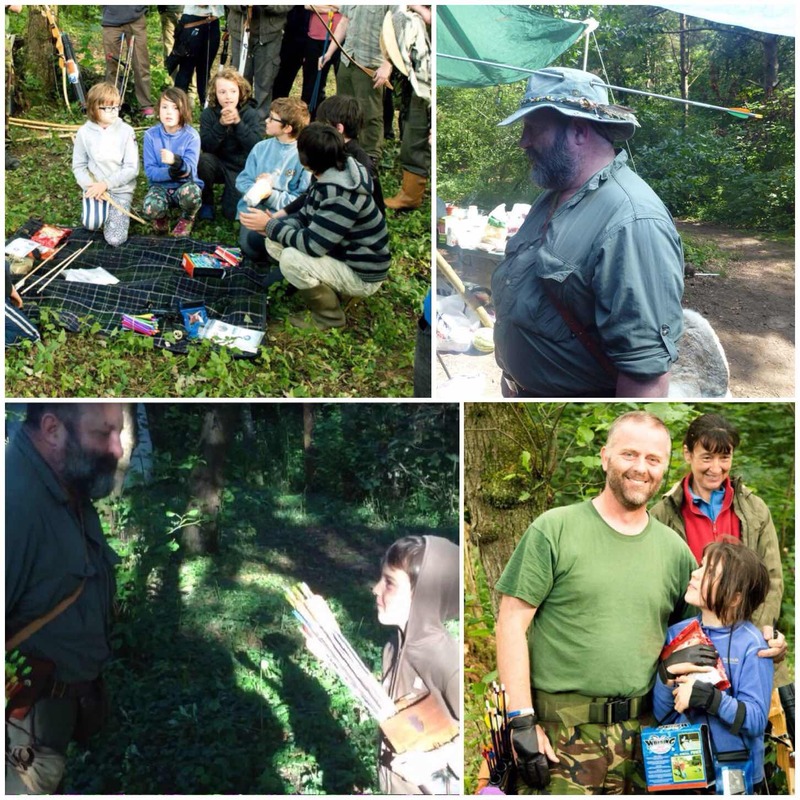 We get lots of full-time instructors visiting the Moot like Fraser Christian (Coastal Survival), Perry McGee (National Tracking School). 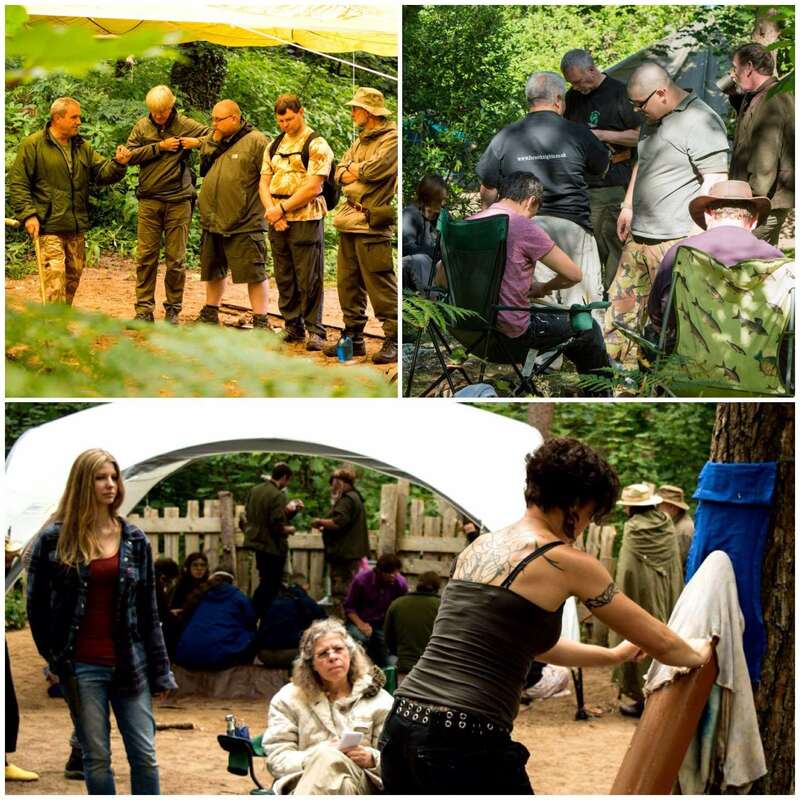 Wayne Jones (Forest Knights), Julia Wagstaff (Welsh Willow Works), David Willis (Bushcraft with David Willis), Theresa Emmerich (tanning expert) and Richard Cook our First Aid expert. 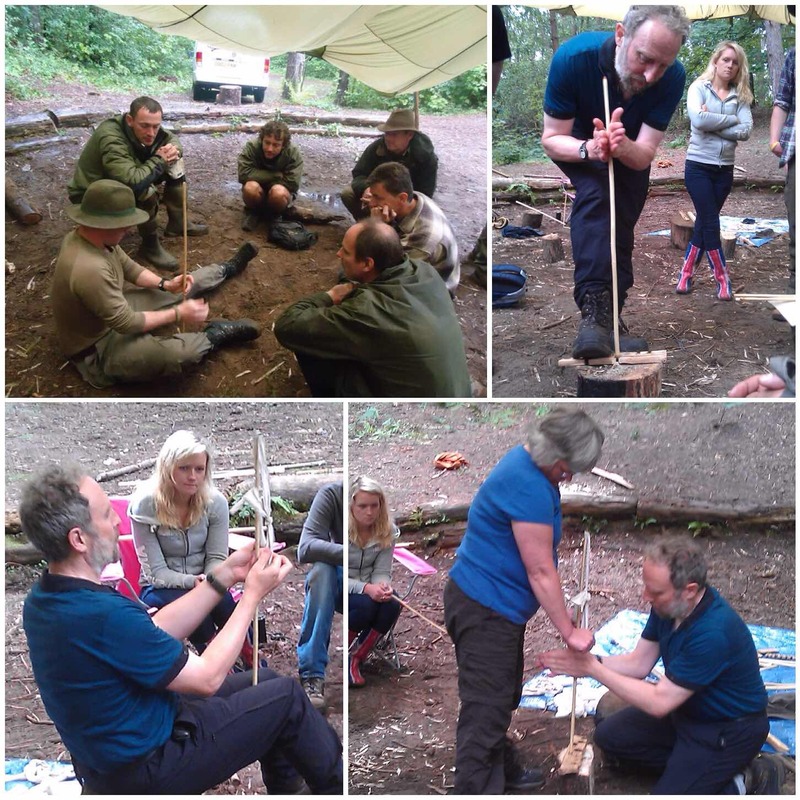 I enjoyed running the ‘show and tell’ workshop on campfire cooking constructions and observing the father and son bows being made. 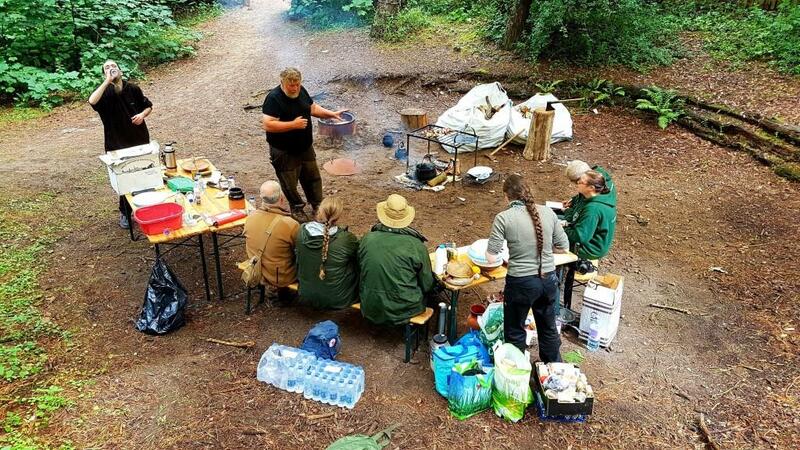 One of the things I love about the Moot is the sharing of knowledge such as how a stove was constructed or that Ikea make good quality drying racks that double up as brilliant cooking grills. 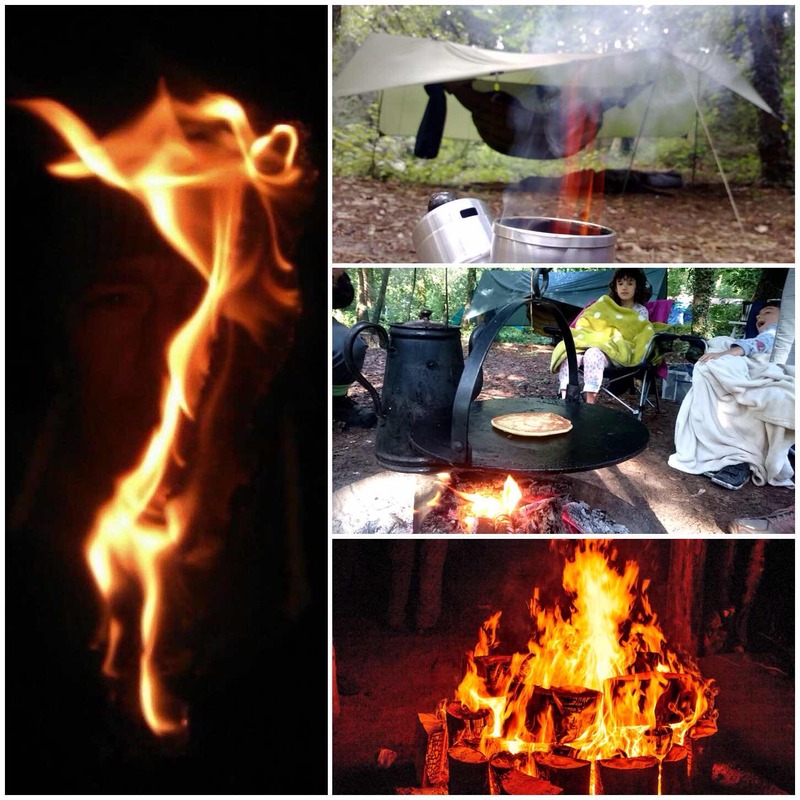 A favourite of mine is the art of fire making. 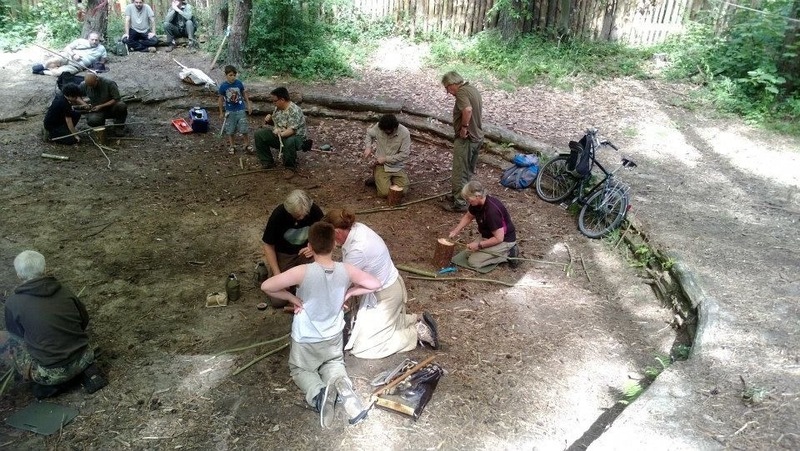 At the Moot you can learn about making fire with firesteels (old and modern), bowdrill, handrill, with damp tinder, pump drills and in many other ways. 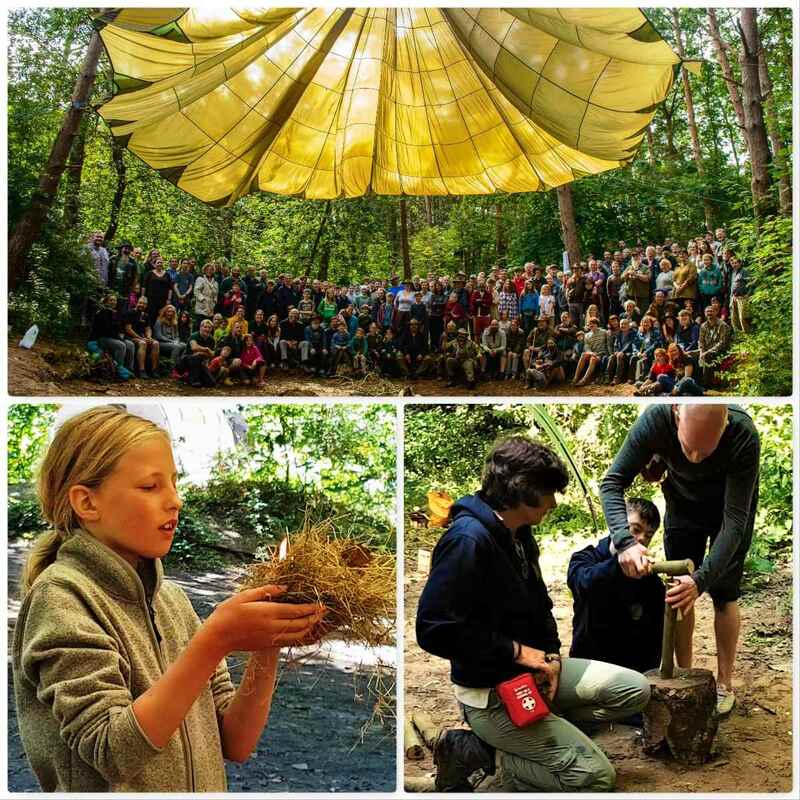 Shelter building is a big subject and is covered well, from simple tarps and debris shelters to large group tarps, permanent constructions and the magical art of tarpology. 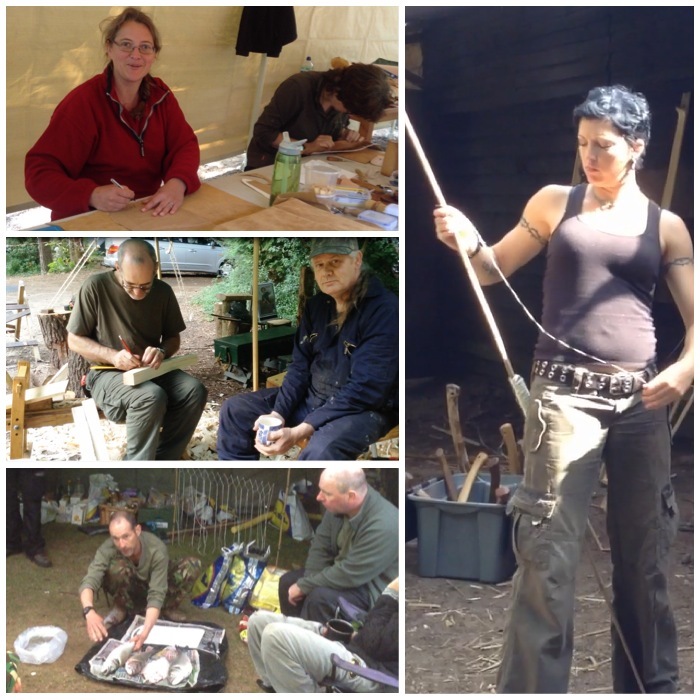 There are many other courses to attend at the Moot with new ideas coming up each year. 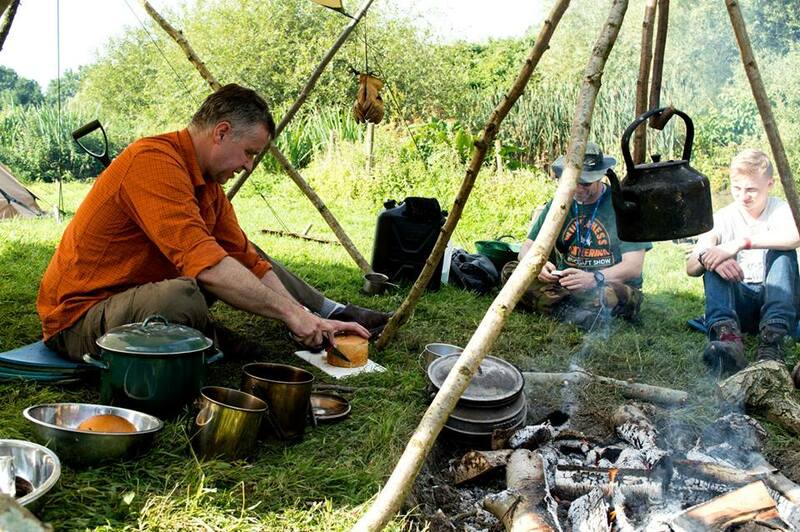 I have found that the Moot has really broadened my knowledge of all things Bushcraft over the years and I expect will continue to do so for many more to come. 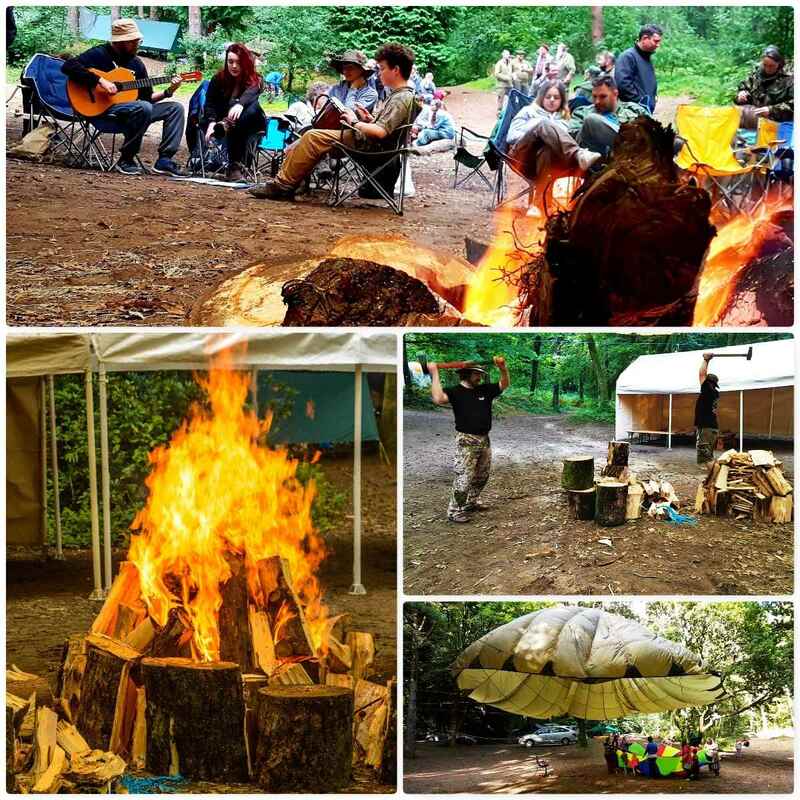 The beginning of August found me preparing for my annual trip to Merthyr Mawr in South Wales to attend the Bushcraft UK Bushmoot. 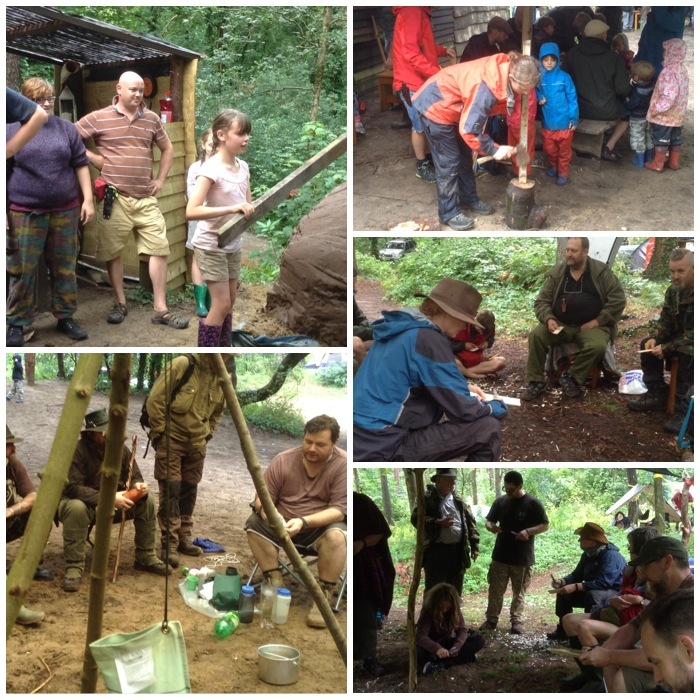 I have written this post as a record of the classes and events at the 2013 Moot but it is in its own way a dedication to our Drew. I have been attending the Moot since 2005 and always have a great time. 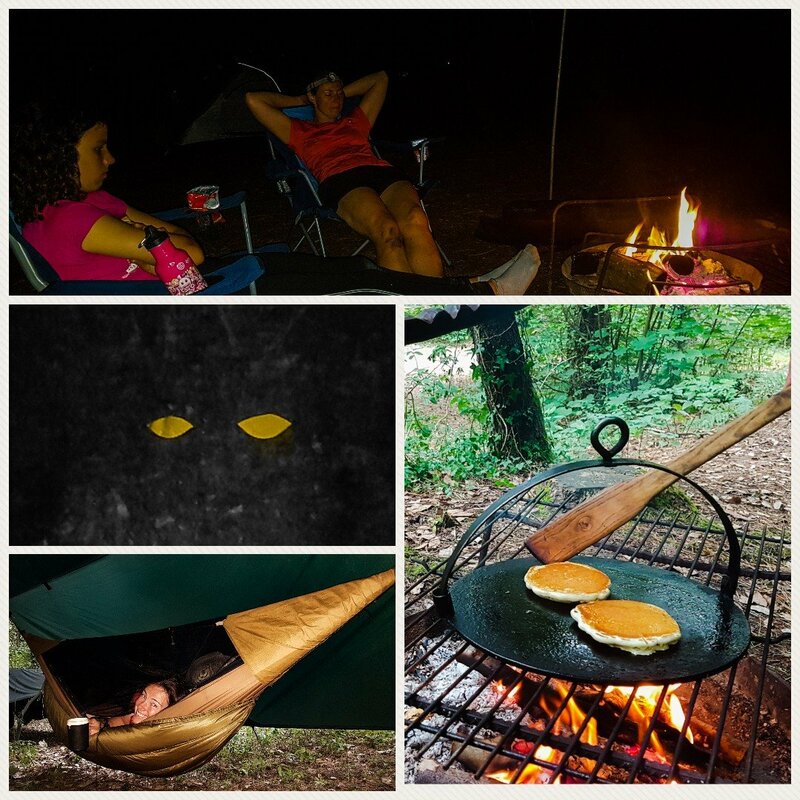 Not always relaxing but always a good time. 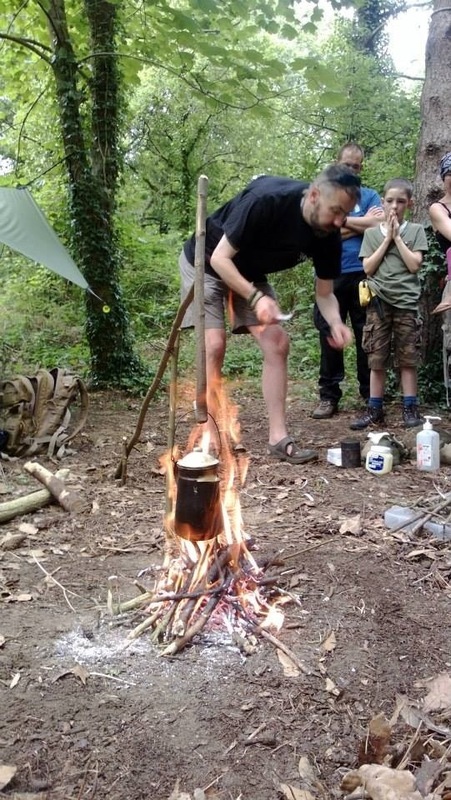 This year we lost a good friend in the Bushcrafting world – Andrew Dunn. 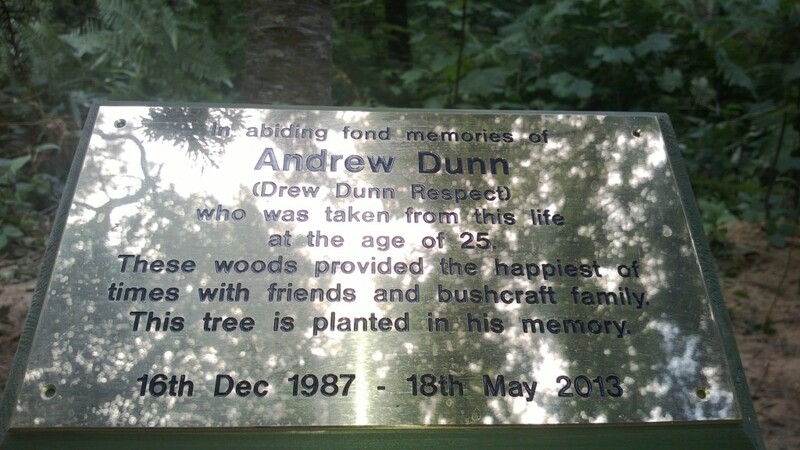 He was known to us as Drew but the handle he liked to be known as was Drew Dunn Respect. This year’s Moot was dedicated to our Drew. 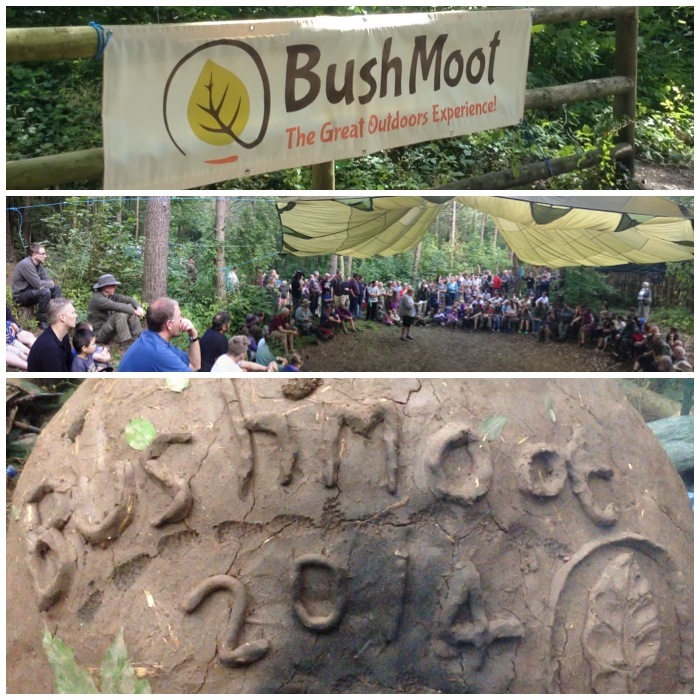 The Bushmoot is normally held at the beginning of August each year and can last up to two weeks. I usually get there for a week and a bit depending on what else is going on. 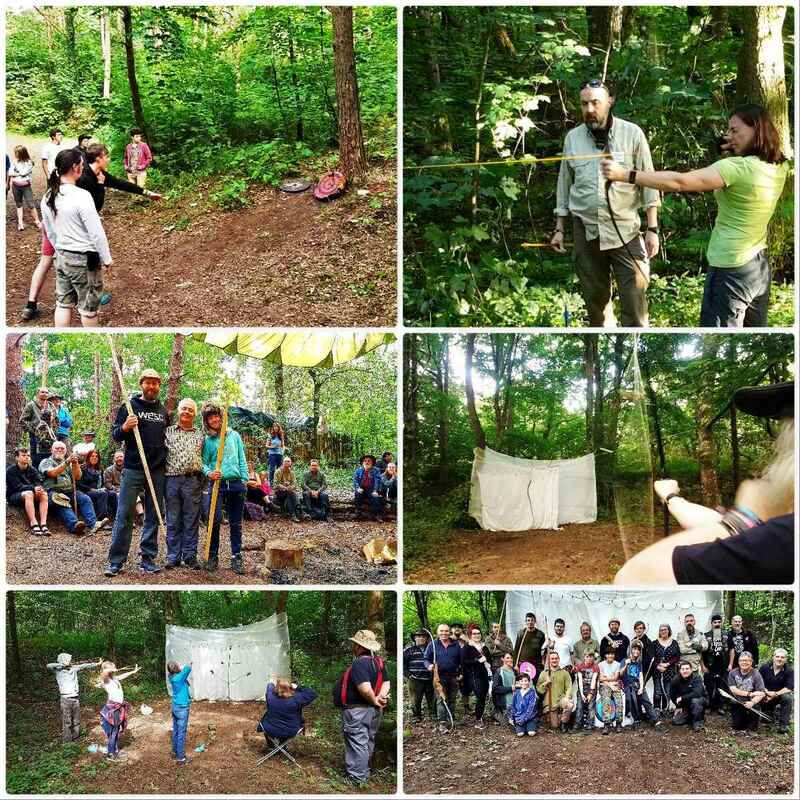 I like to think of the Moot as a meeting of like-minded people with a vast diversity of skills and experiences that they are happy to share with each other. 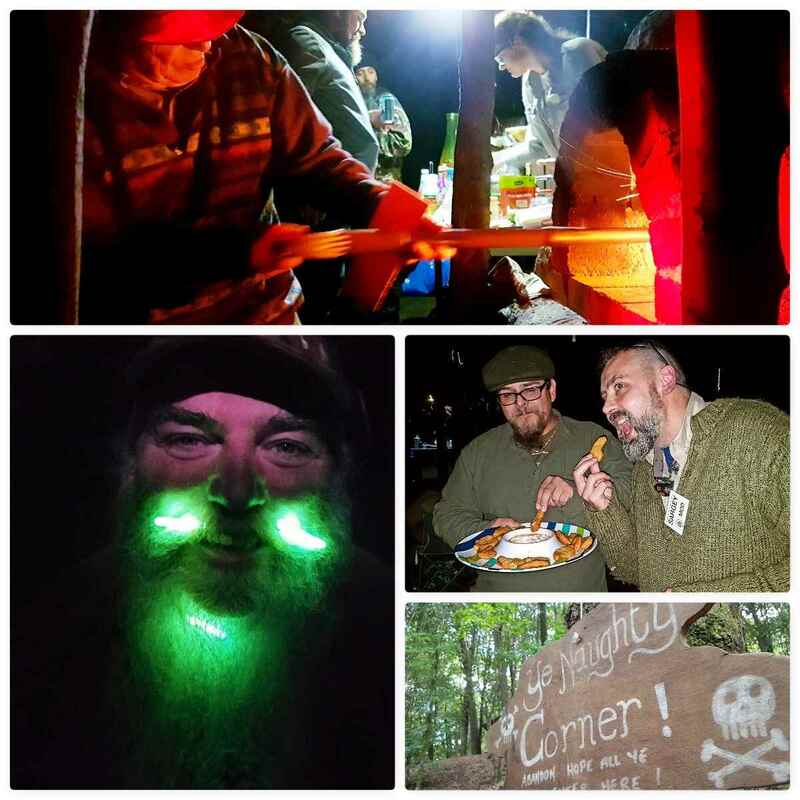 My arrival at the Moot was delayed this year by a day as I ran some bushcraft classes at our village summer school so I was very happy to see on my arrival that my whole camping area had been taped off for me. 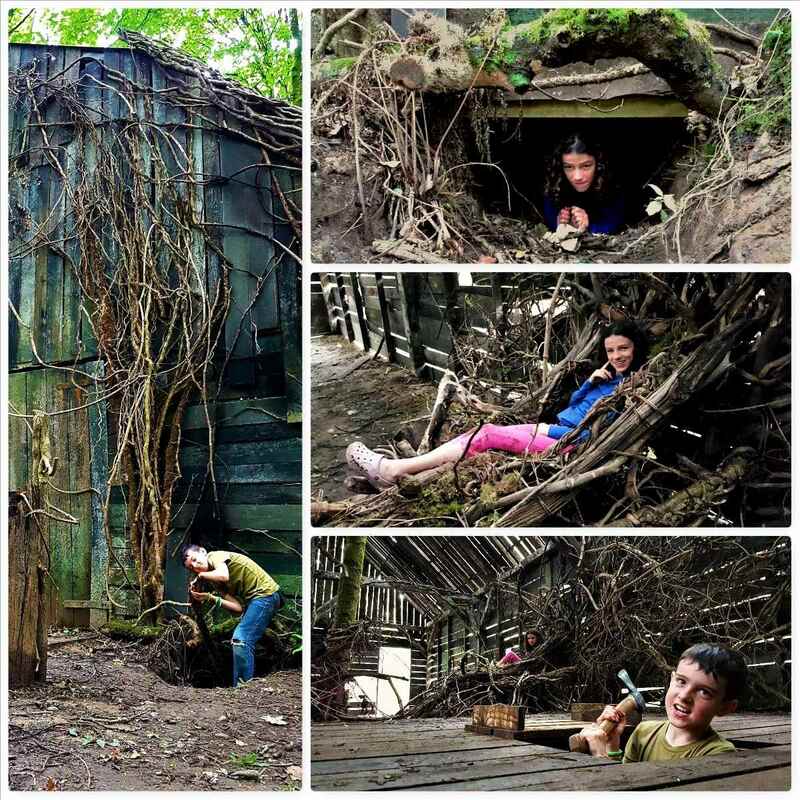 Eventually I found out it was my friend Charlie Brookes who had done this and I was very grateful he had as I have become very attached to my little pitch (I got thrown out of my original pitch years ago by the owners of the ‘Naughty Corner’). 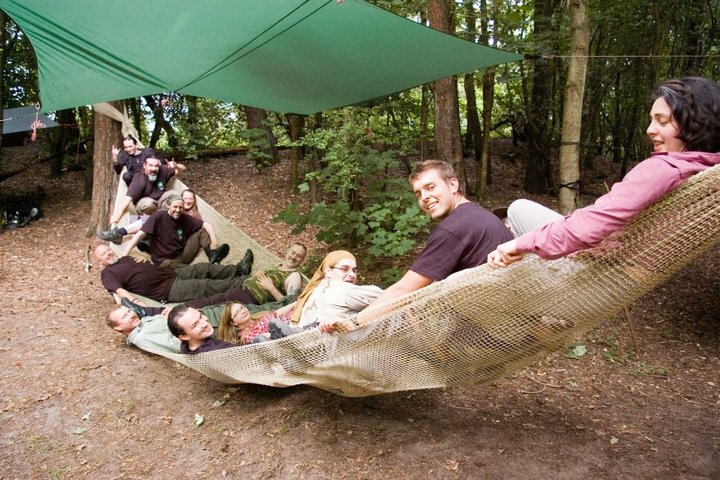 The first few days for me are usually a time to catch up with good friends, prep my classes and take time to chill out in my hammock. 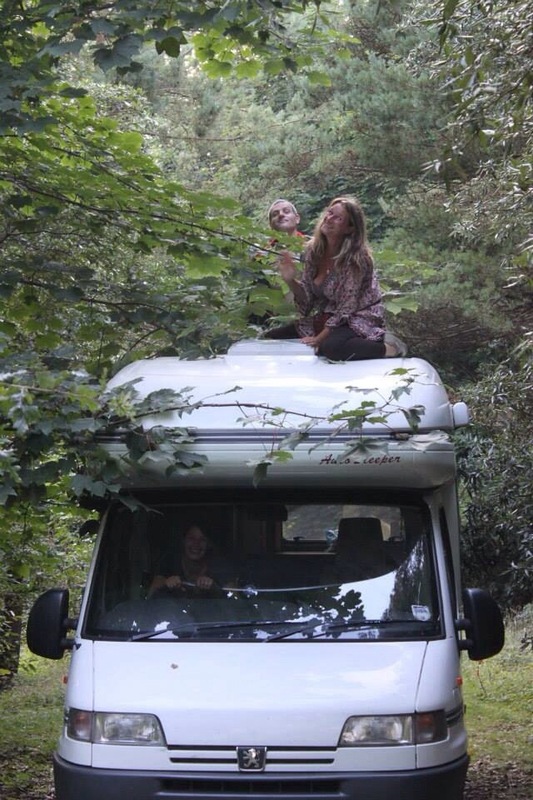 A couple of days later Karen and Clare turned up, not with their usual tents and tarps but with this mobile palace. 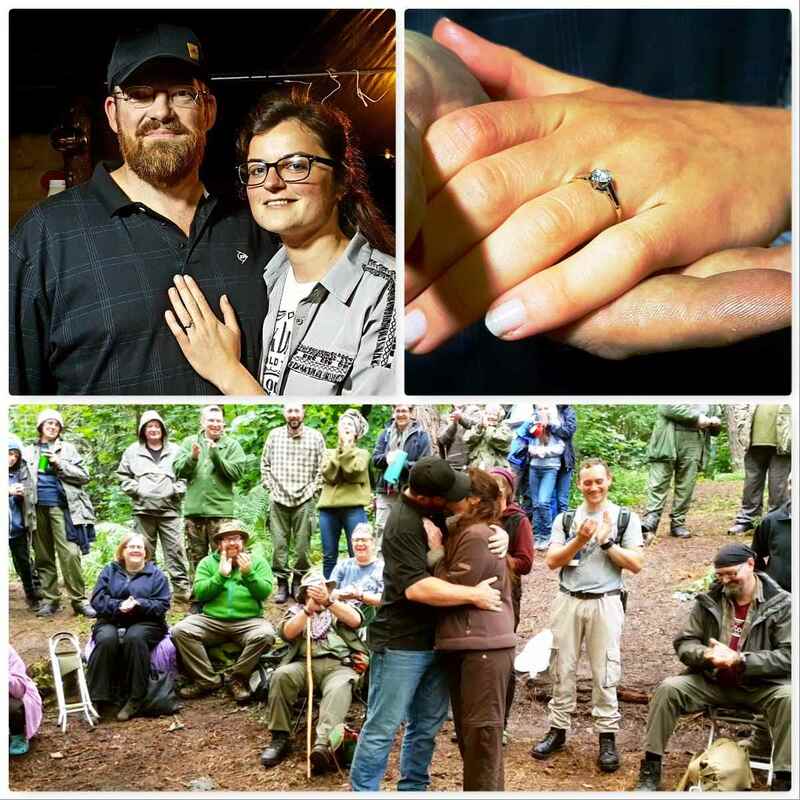 Seemingly Clare said it was a wedding present she and her husband had given to themselves. It was fun though getting the mobile palace through the trees to a decent spot. The mobile signal is pretty bad in Merthyr Mawr but there’s a particular spot I go out to where I can get a signal to phone home. 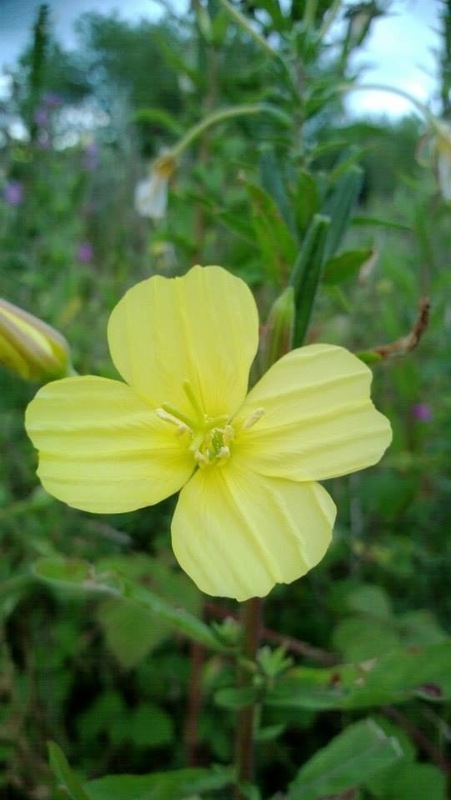 The spot looks out onto the dunes and there every year I find these beautiful Evening Primroses growing. 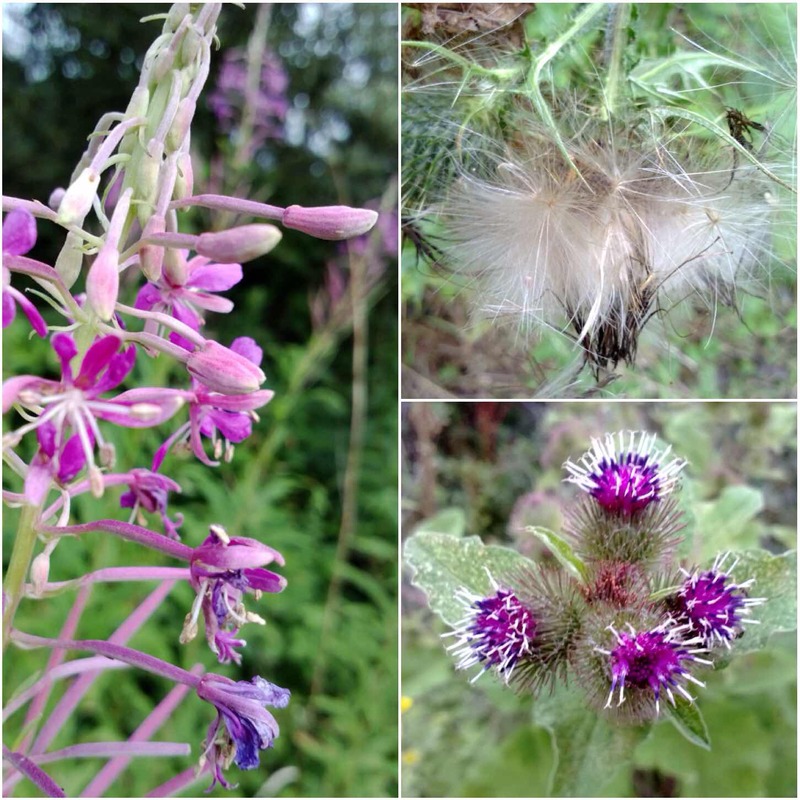 One of the great things about Merthyr Mawr is the diverse range of plants that grow there and so makes it a plant photographer’s heaven. 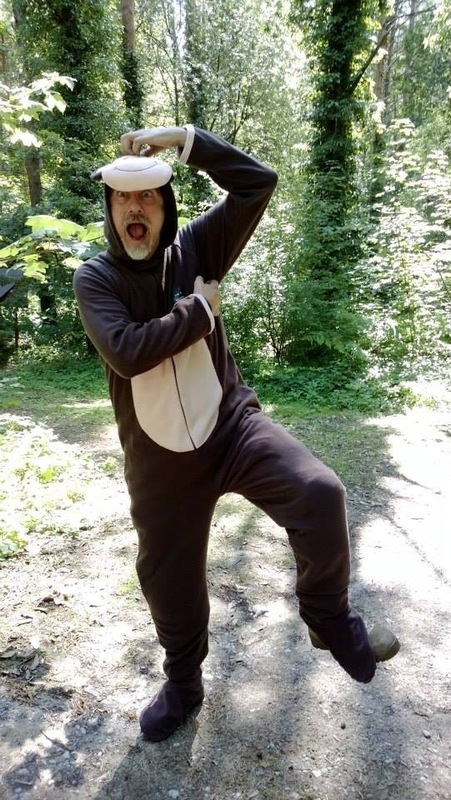 This year there was Victorian theme to the Moot but Spikey being Spikey decided to come as a monkey. 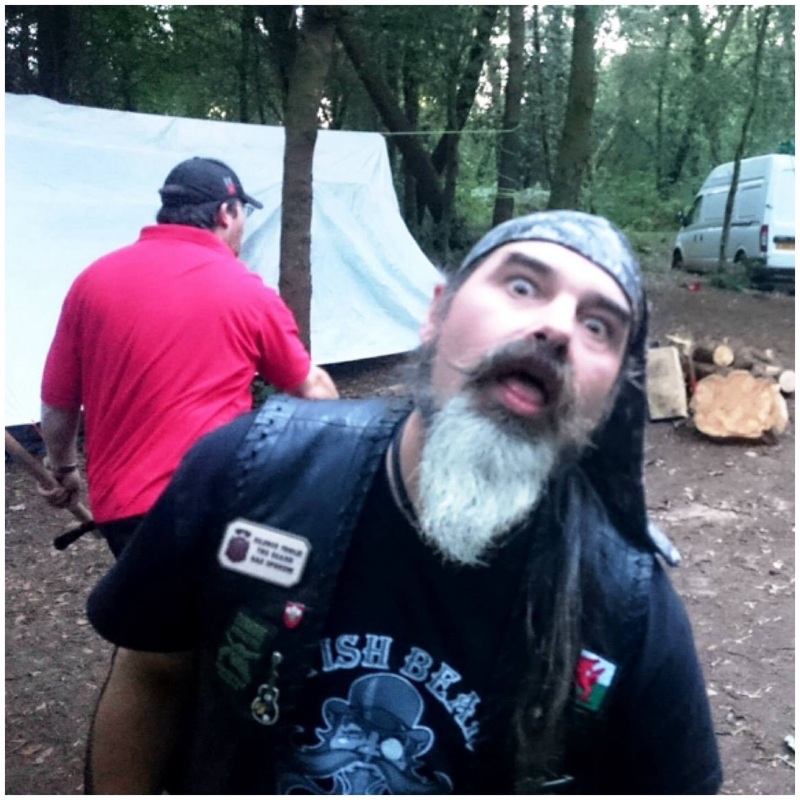 I was chatting with my friend Dean Allen one day at my campsite discussing the Welsh spoons he carves. The conversation got onto his other work and I had to take this picture. 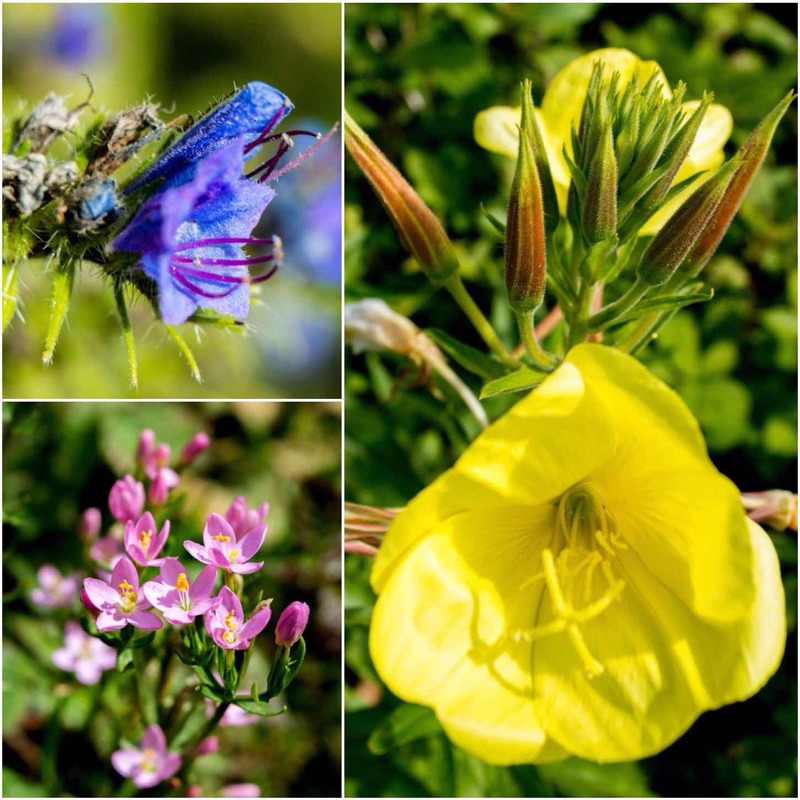 Dean has a great eye for detail as this picture shows. 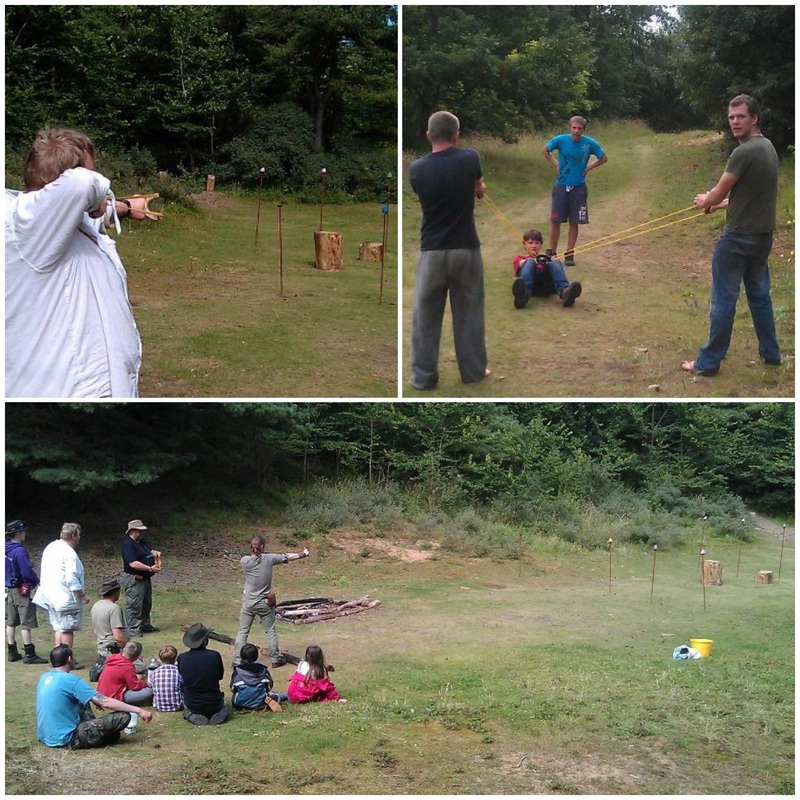 Quite a few of the guys are bowyers and we set up an archery range at each Moot. 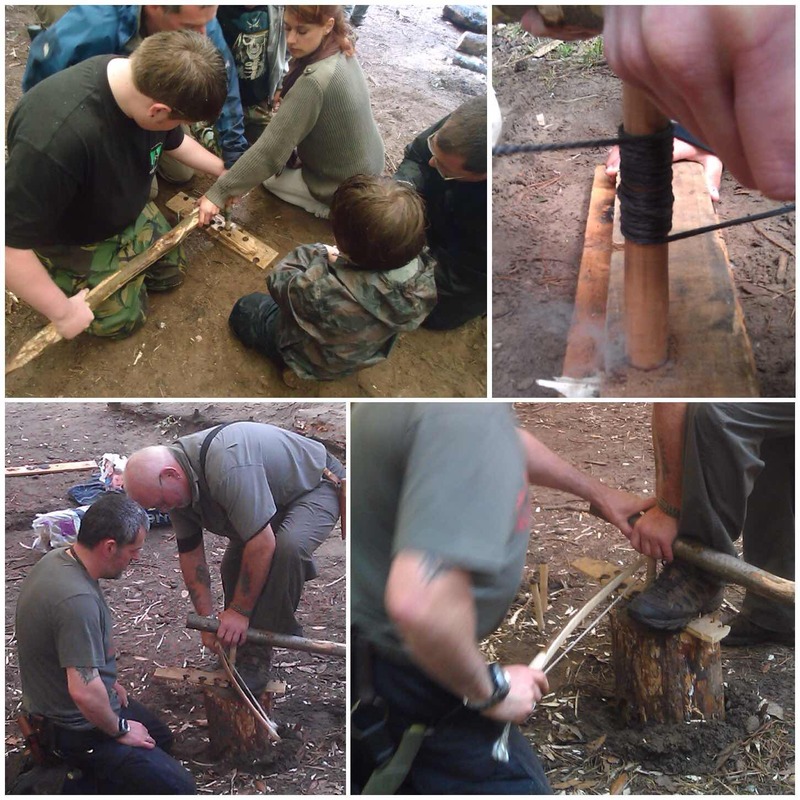 For a few years I have run a class making Father and Son bows as they are so quick to make. 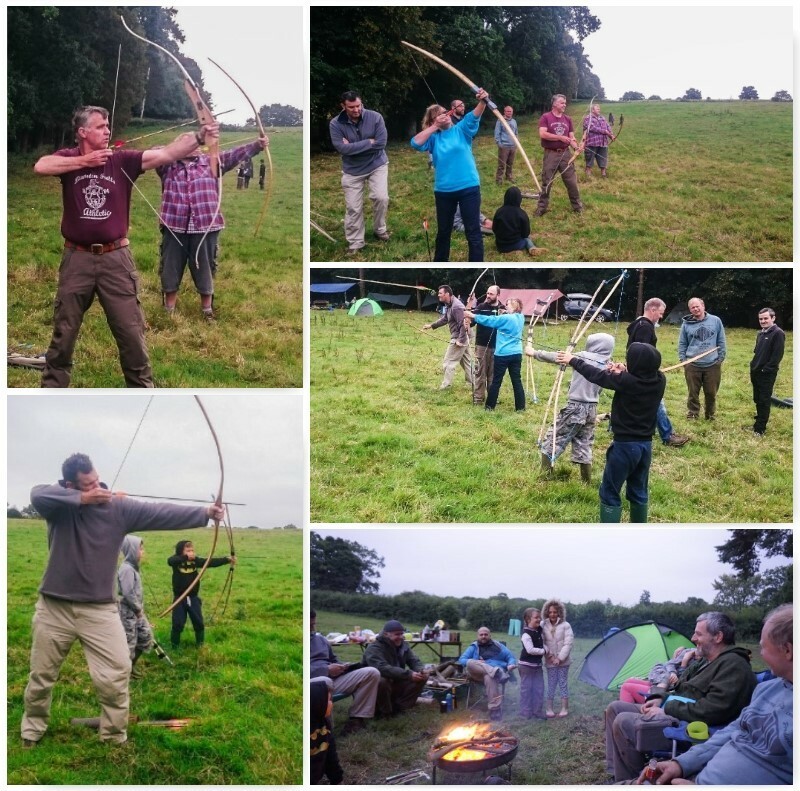 As I was helping to run the Starter Skills course this year one of the other instructors ran the bow-making course. 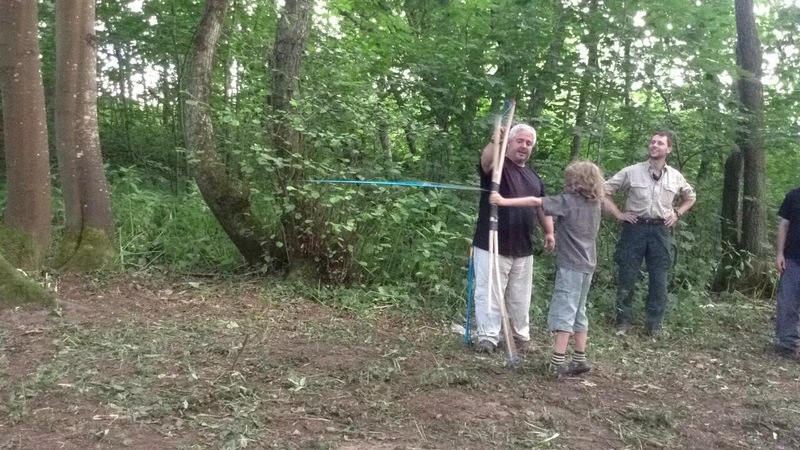 These bows take only an hour to make but can easily shoot sixty or seventy metres. 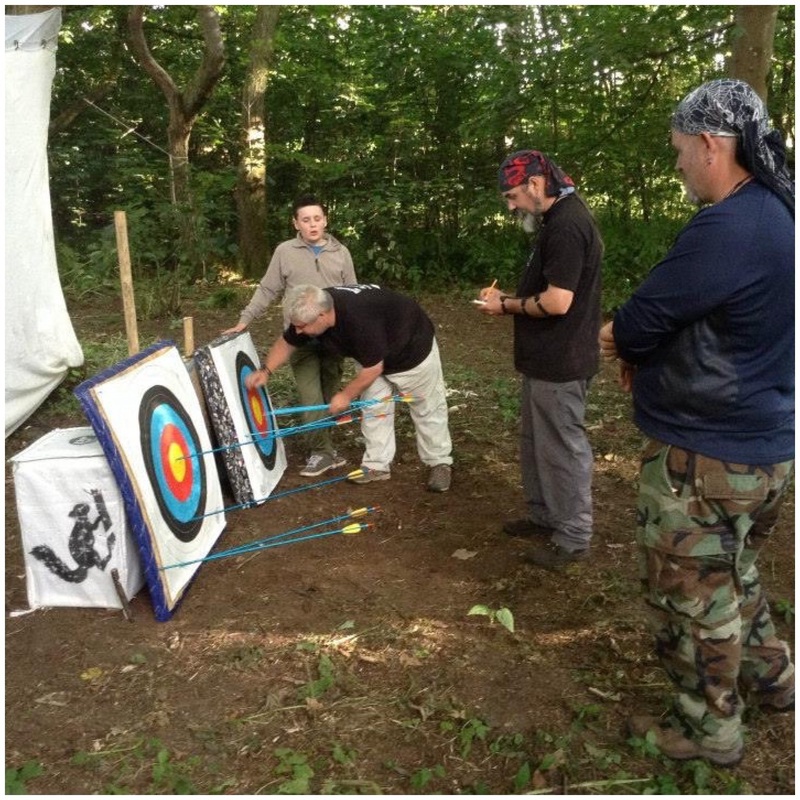 Cap’n Badger, Wayne Jones of Forest Knights, Paul Pomfrey and myself normally run the archery range. 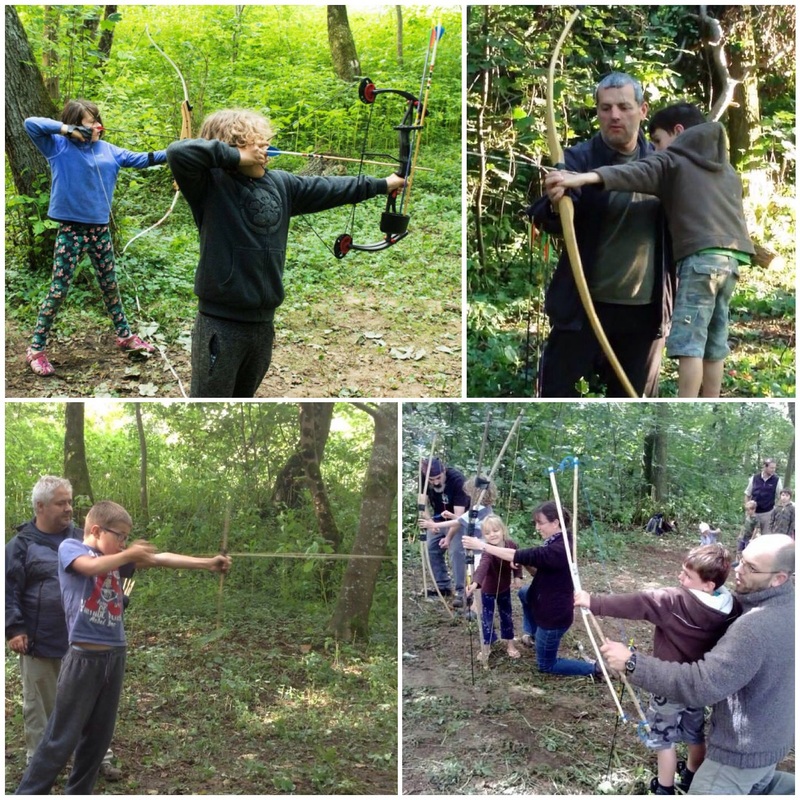 The Father and Son bows are double limbed and are great for the kids. The adults love shooting them as well. Over the last couple of years I have developed an interest in getting these pictures of flying arrows. The slightly slower speed of these arrows being released makes for a good picture. 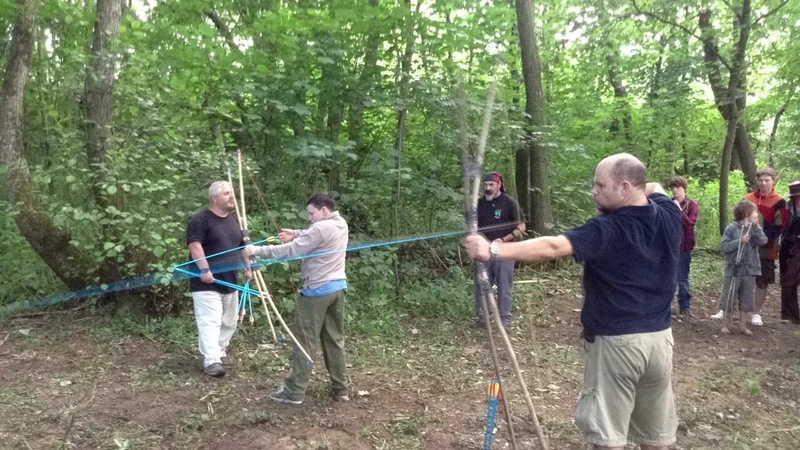 A couple of years ago Drew worked with me to build one of these bows. He was not sure if he could at first and was quite shy about starting but once he got going there was no stopping him. 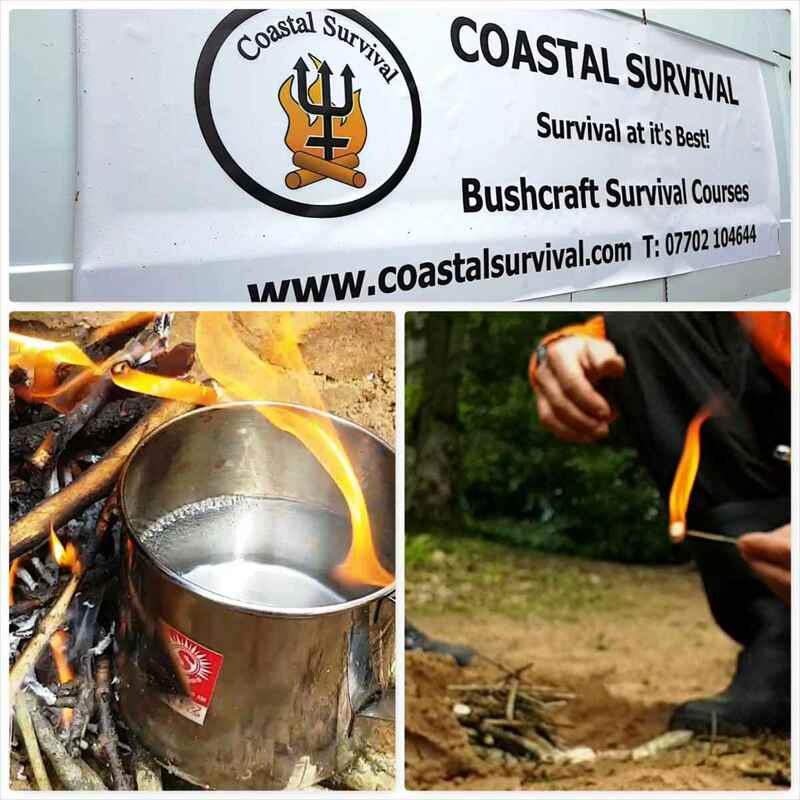 My good friend Fraser runs a company called Coastal Survival and has been coming to the Moot for a few years now. 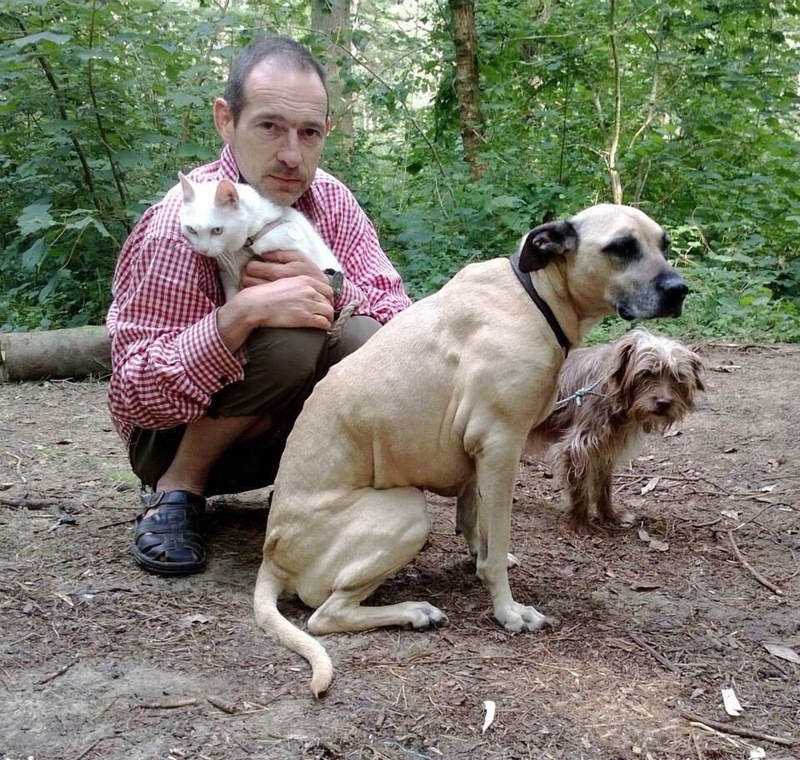 Sad to say that Bella (the larger dog) passed away this year due to complications from a possible snake bite earlier in the year. She was a great dog, always inquisitive and great with the kids. 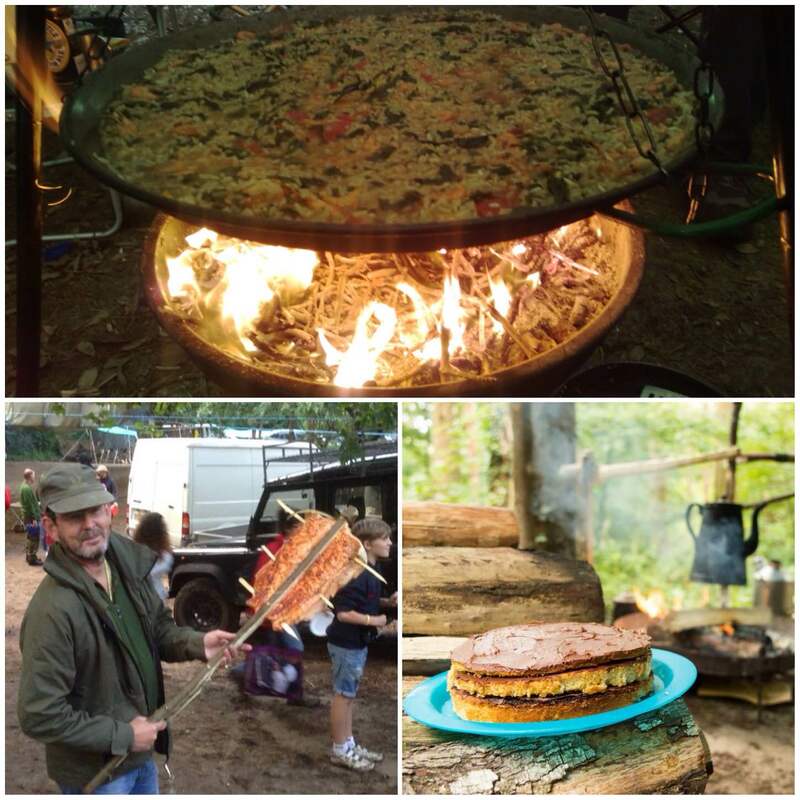 Alongside Fraser is our big Al and what a lovely pair of chefs they make 😉 between the two of these guys I have had some fantastic food at the Moot. 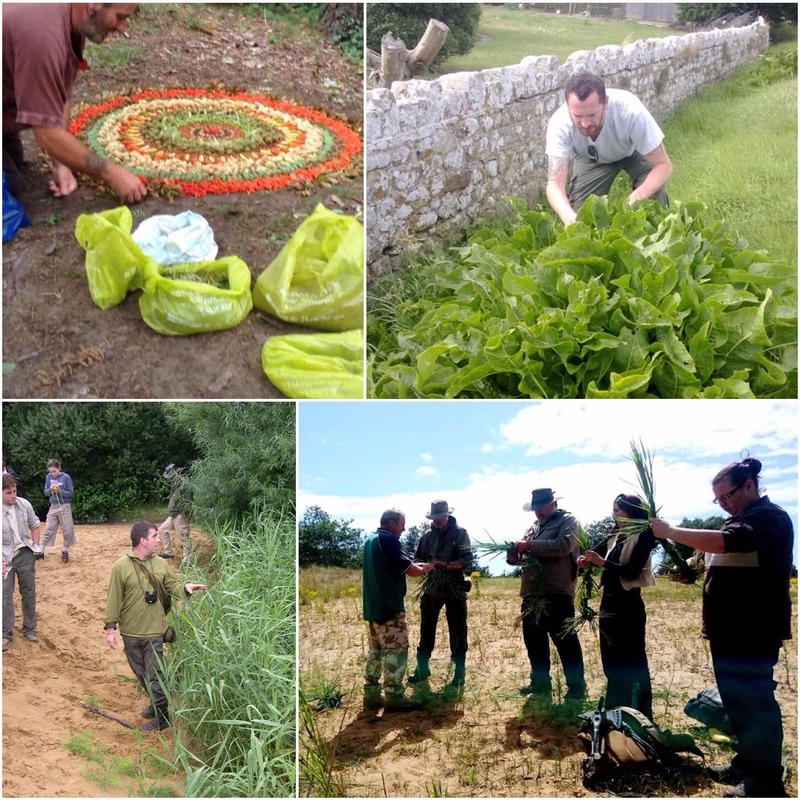 On one of the days I popped down to the coast to do a bit of foraging with them. 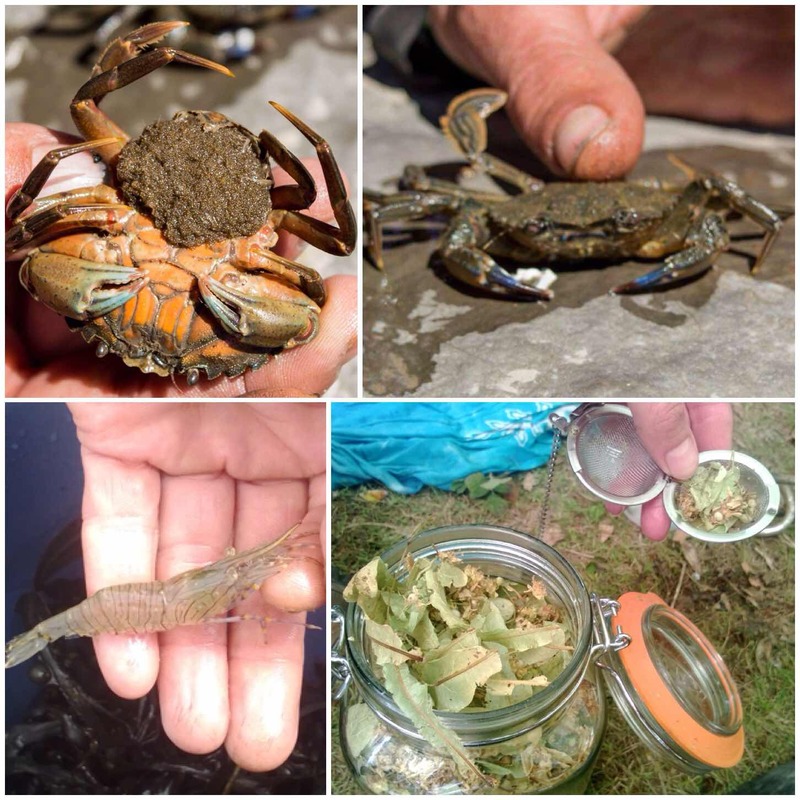 No fish that day but plenty of shrimp and limpets. Drew did a few Coastal trips with Fraser so I know he would have loved this. 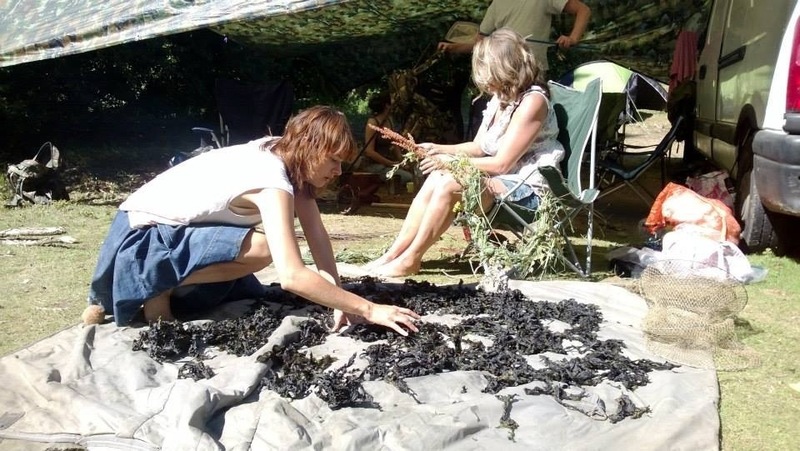 We also collected a lot of sea weed (sea lettuce I think) which Clare was laying out to get rid of sand particles and to dry it out. Karen is making grass rope in the background as a decoration for the mobile palace. 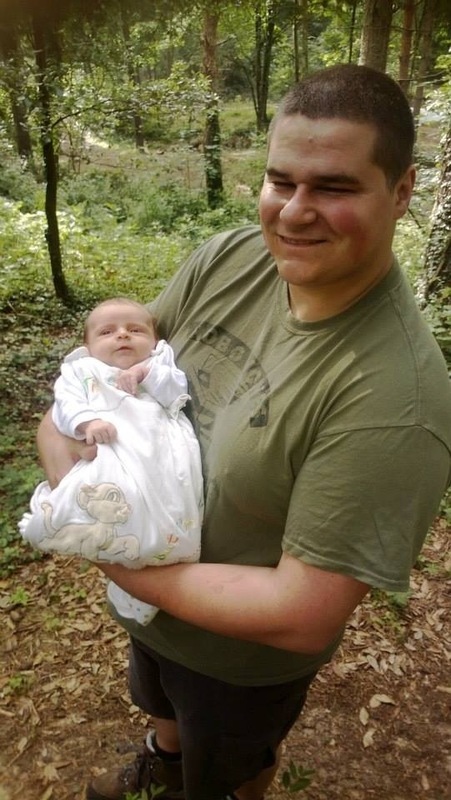 It was great to meet Craig’s baby son Sion for the first time at the Moot. For myself and the rest of the Mods the day starts with ‘morning prayers’ (Tony’s morning briefing) and this is soon followed by a larger meeting with everybody under the main parachute. 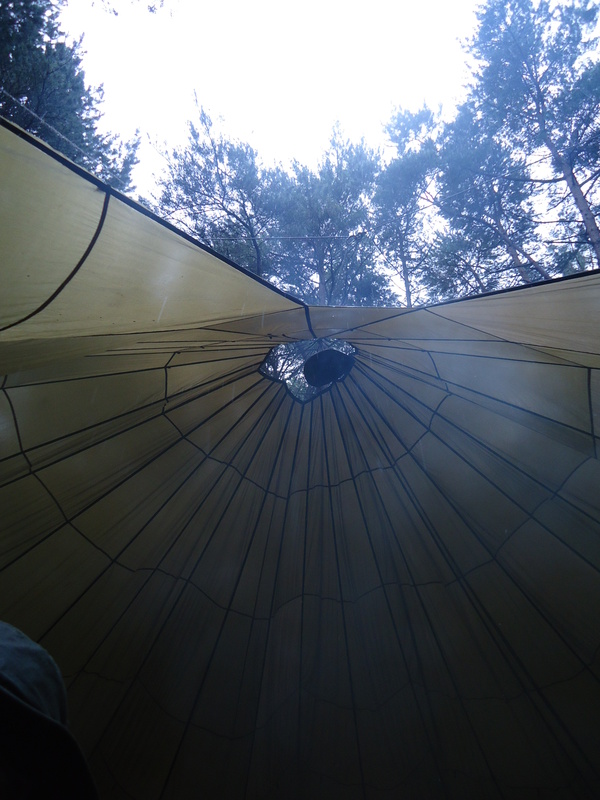 This picture was taken in 2011 and shows the main parachute where we have the morning meetings to discuss the day’s events. 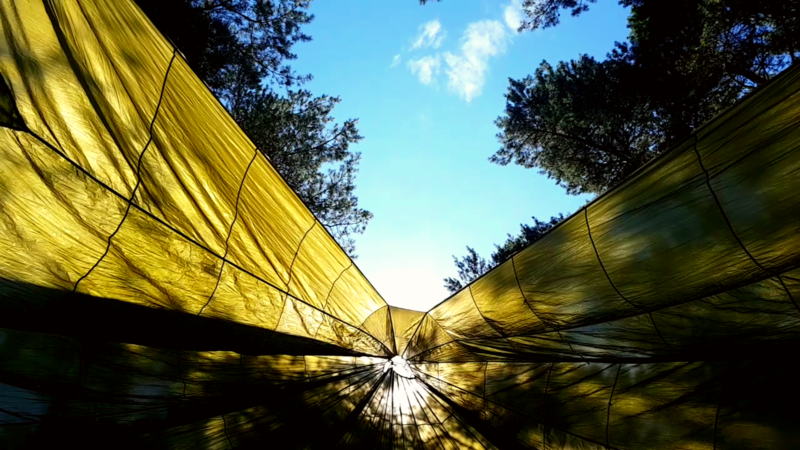 Ever the practical joker, Drew found his hat missing one day and finally spotted it at the apex of the chute. 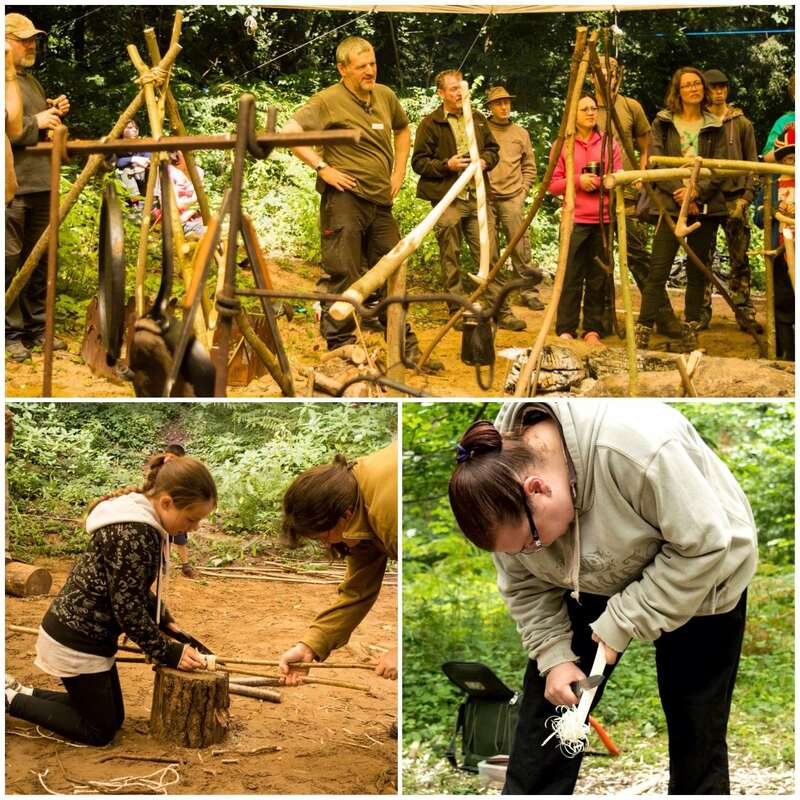 In one of the Mods’ meetings we came to the conclusion that a’Starter Skills’ course was required, covering knife safety, carving (we made tongs for the fire), knots, fire lighting and some simple pot stands. Emily having a go at the Evenk knot. 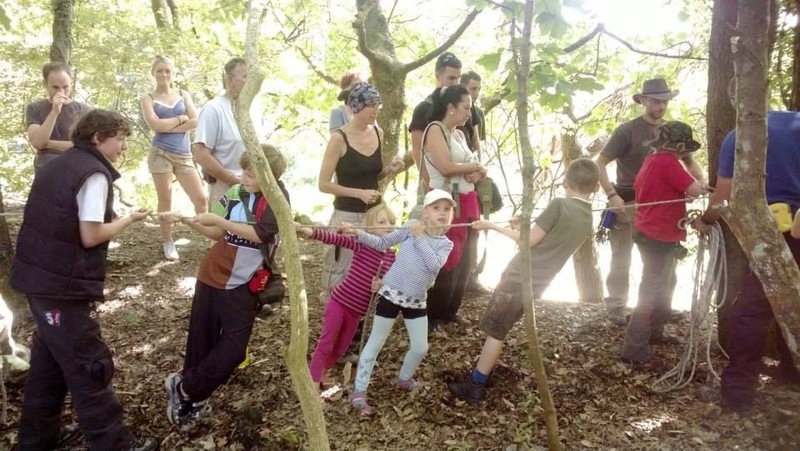 The kids all learnt the skills at the same time as their parents and had fun here testing that the knots had been set up properly. 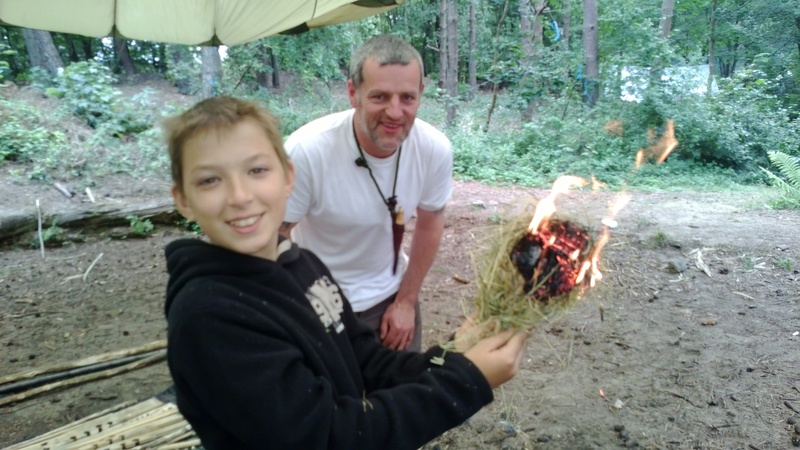 Sargey finishing off the fire lighting class of the Starter Skills course. 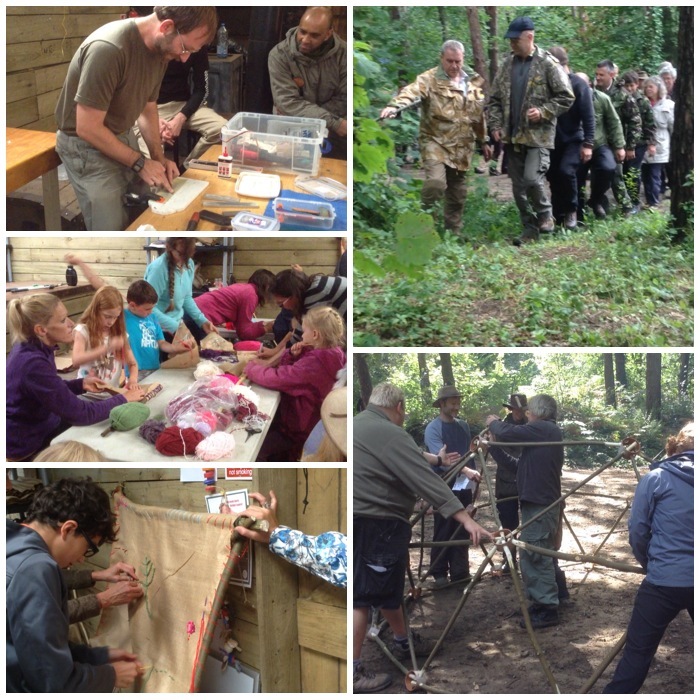 This course got a lot of good feedback so we will try and run it again next year. 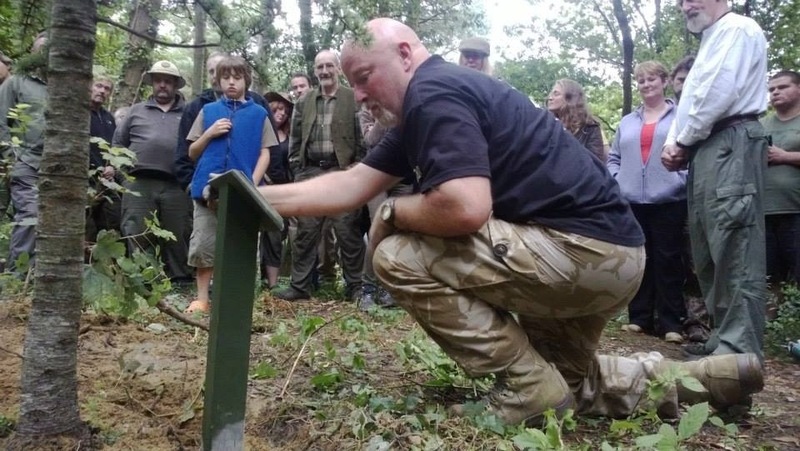 Some of the members (Cap’n Badger and crew) had organised a very special Memorial Service for Drew. 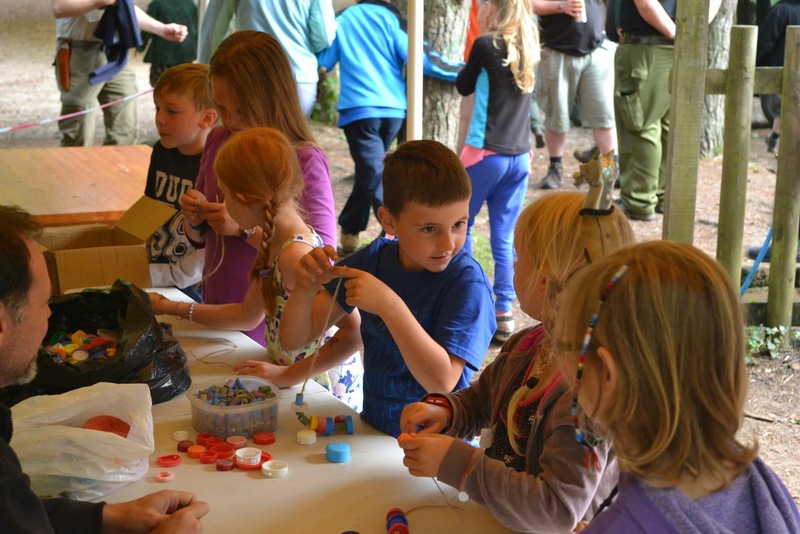 His parents Jean and Philip attended the Moot this year for the service along with Drew’s brother Steven and sister Stacey. 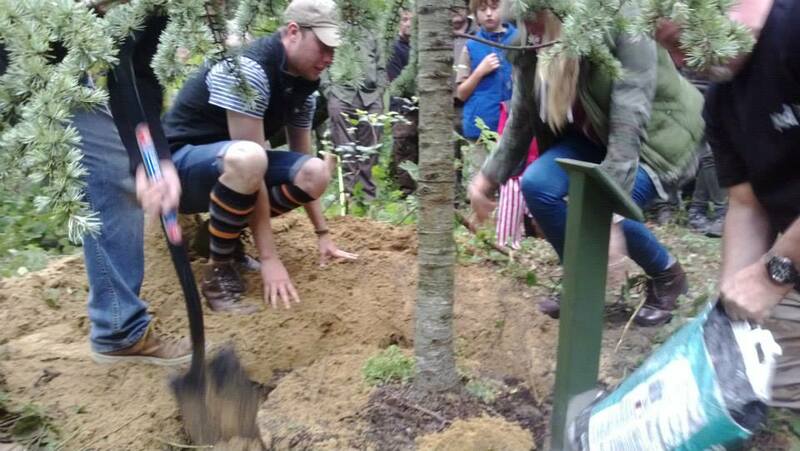 Steven and Stacey helped to plant the Atlantic Pine tree in Drew’s memory. After the tree was planted we put in a plaque that the guys had commissioned. The whole ceremony was extremely moving. Dave finished the service with a very moving eulogy to Drew. There were not many dry eyes in the glade. 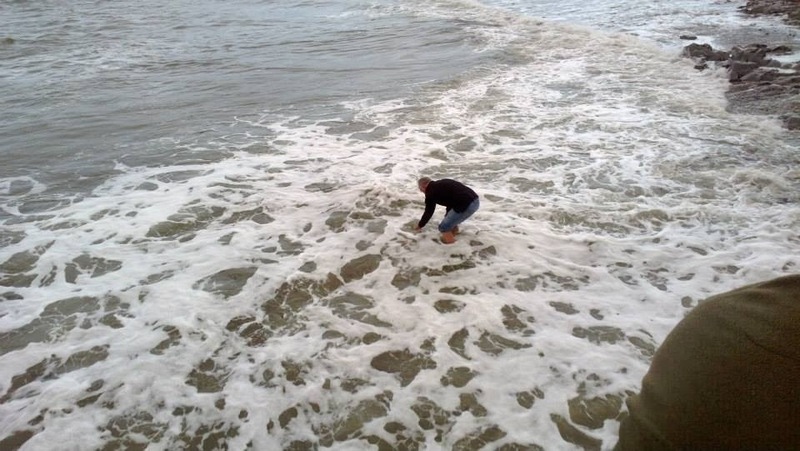 The service was finished when Drew’s father Philip spread Drew’s ashes in to the waves at Methyr Mawr. Taken a couple of years ago, this is the sign for Drew’s favourite place at the Moot. 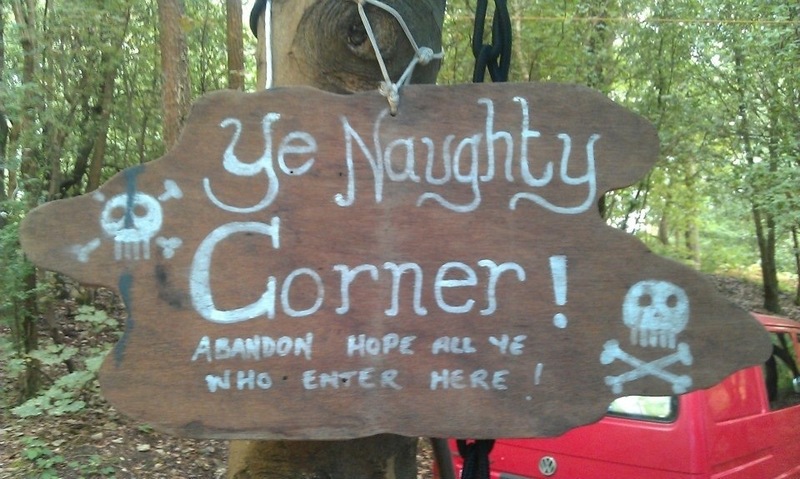 The Naughty Corner was set up as a place for people to come to and relax without worrying too much about noise levels. Drew was always at the centre of things here and was the first place he asked to go to when he first joined us. One year the roof of the shelter here got badly damaged in a storm and it was Drew who took it upon himself to climb up and fix it. 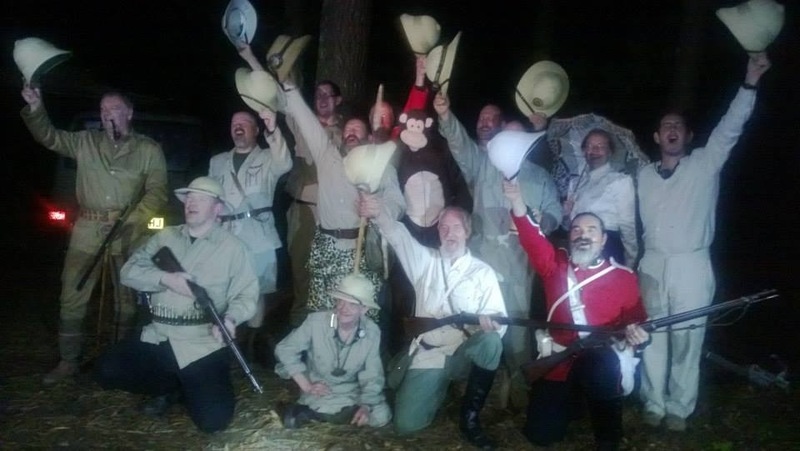 I managed to get the majority of the Victorians together for a group shot and was quite surprised to see how many rifles they had brought along. The majority were actual period pieces. Back to the other activities being conducted at the Moot. 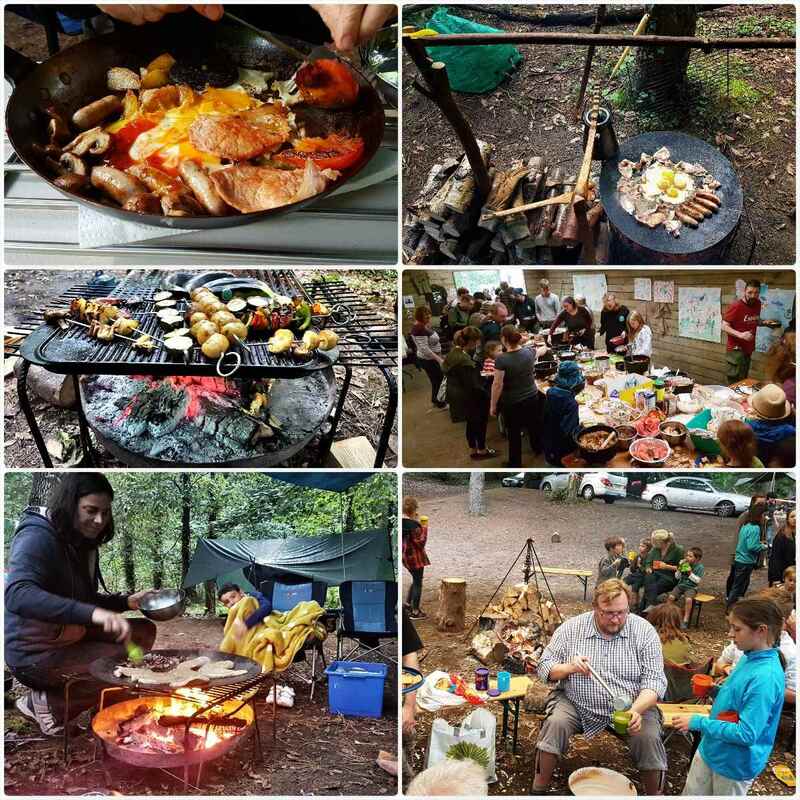 There were a lot of classes being run all over the site so my pictures only reflect a portion of the classes but I hope it gives you a feel for what we do. 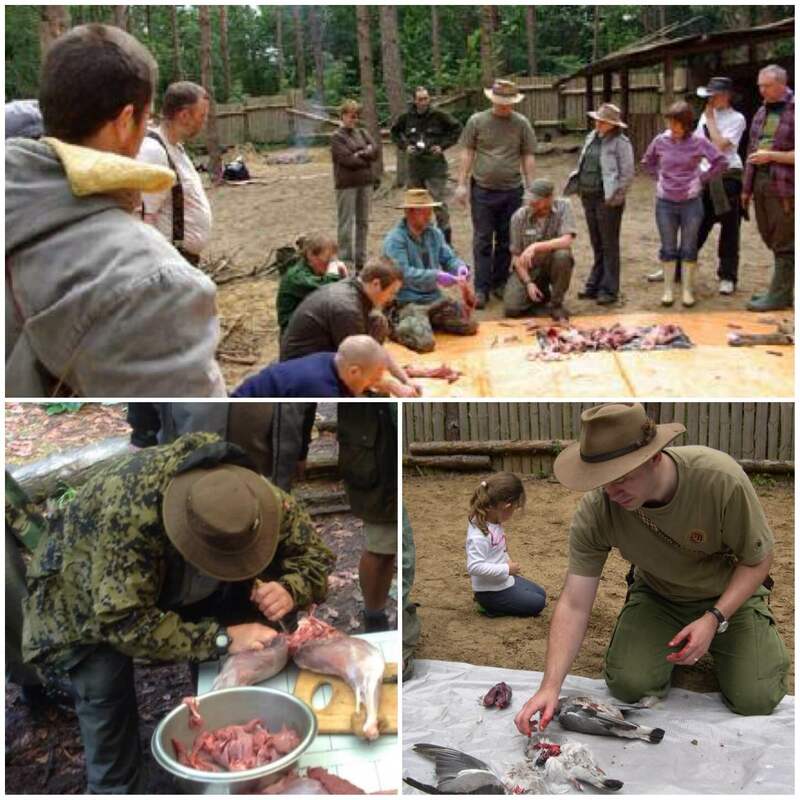 Perry Magee from the National Tracking School came to the Moot this year. 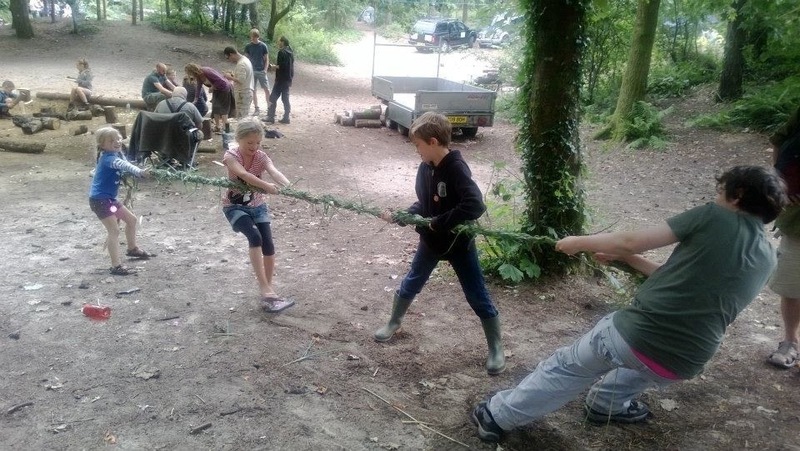 I did not get to the grass rope making class but watched the kids having a tug of war with what they had made. 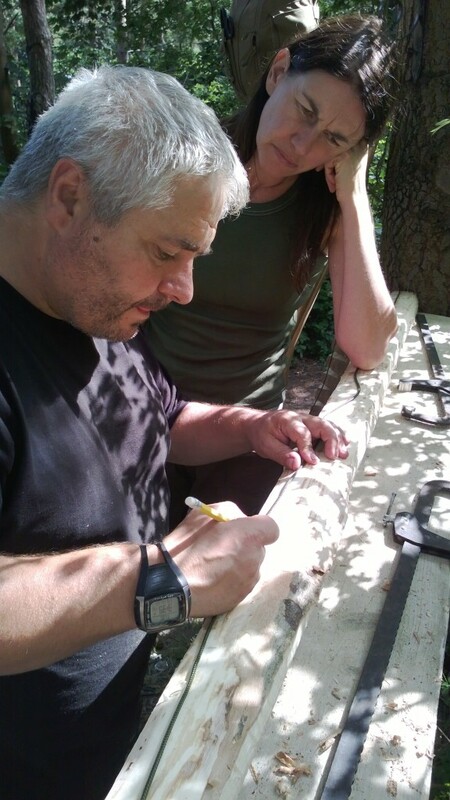 Dean Allen, Mad Dave and a few others had an introductory class on carving. These lads know their stuff and the kids got some really quality tuition. 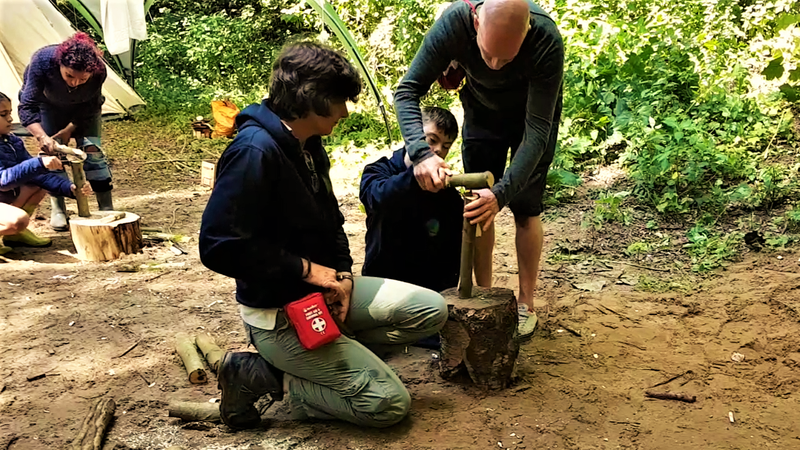 I have spent many an hour around the campfire carving with Drew as this was something he really wanted to get to grips with. 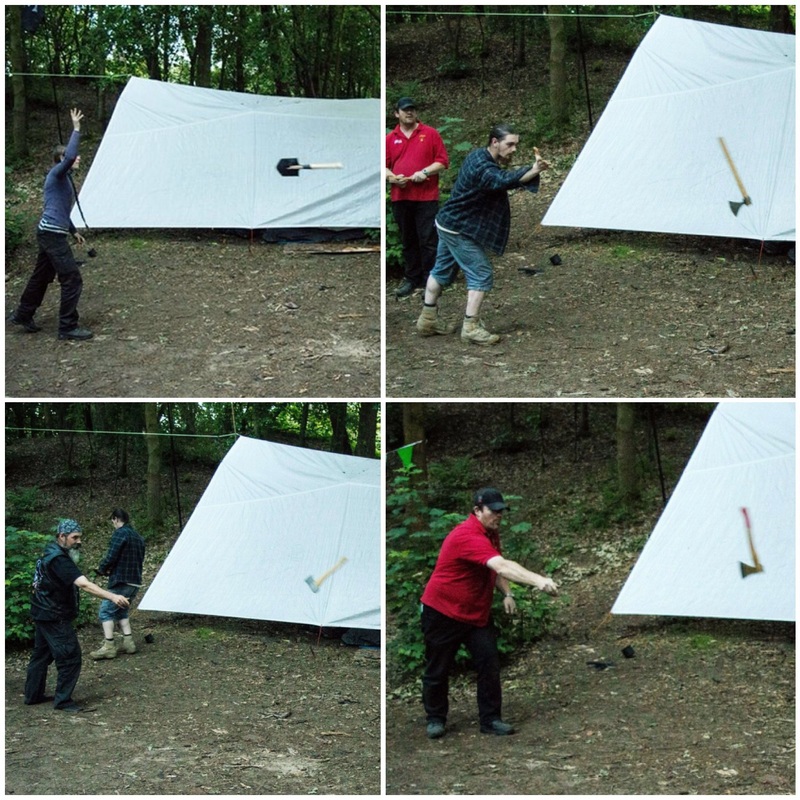 I ran the usual bowdrill classes for individuals and groups. No matter how many times I teach someone this skill I still love to see that smile the first time they get an ember. 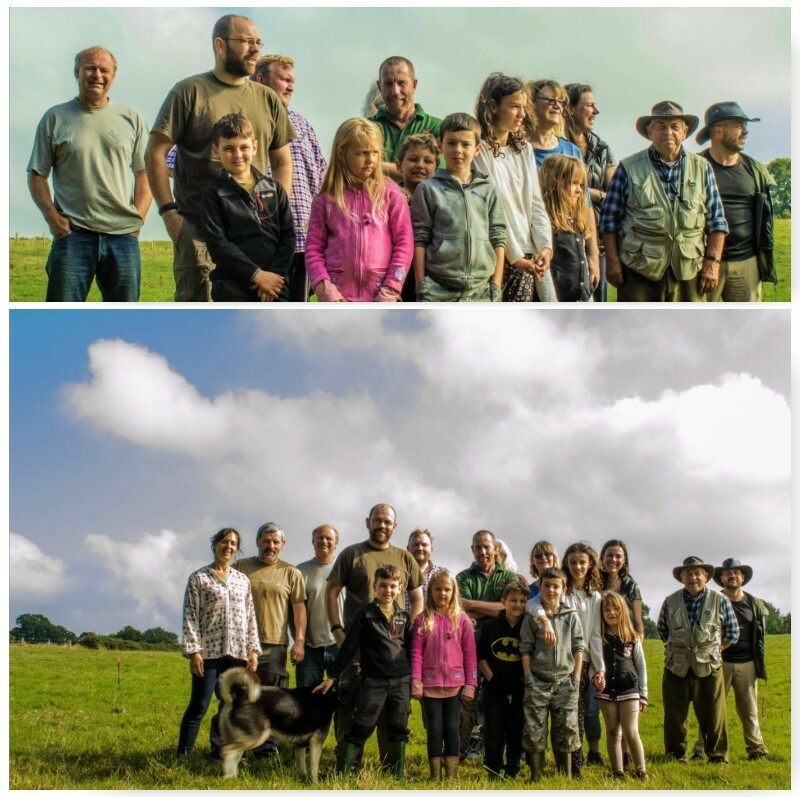 My friend Mark Oriel is a butcher by trade and now manages a small farm in the West of Wales where he runs his own bushcraft/homesteading courses. 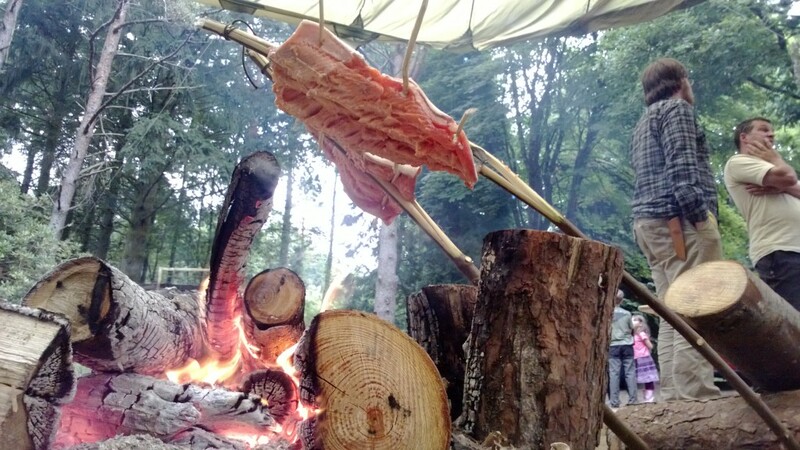 This year Mark ran a very successful Jerky smoking class. 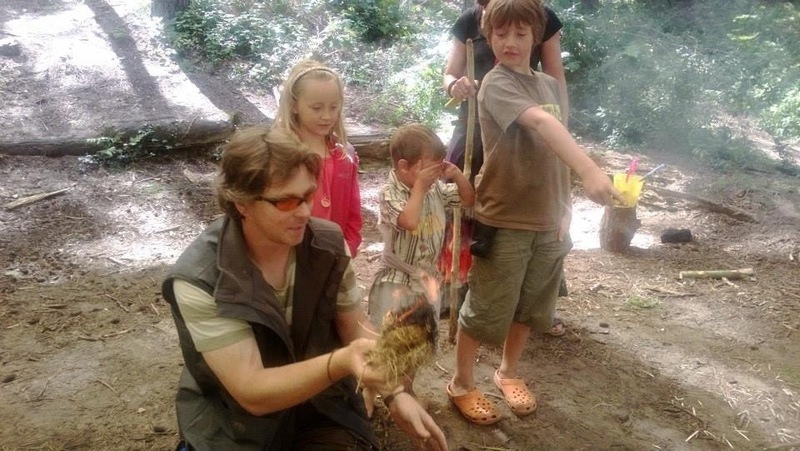 One of my classes focuses on getting families working together to create fire using the bowdrill. 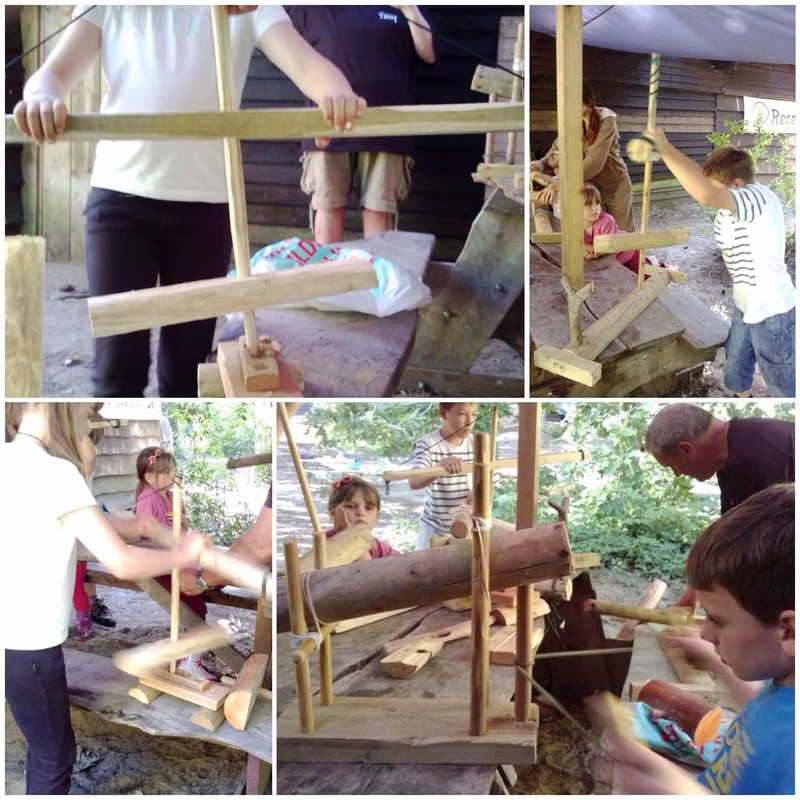 There are not many things that bring everybody in a family together but the group bowdrill is one. 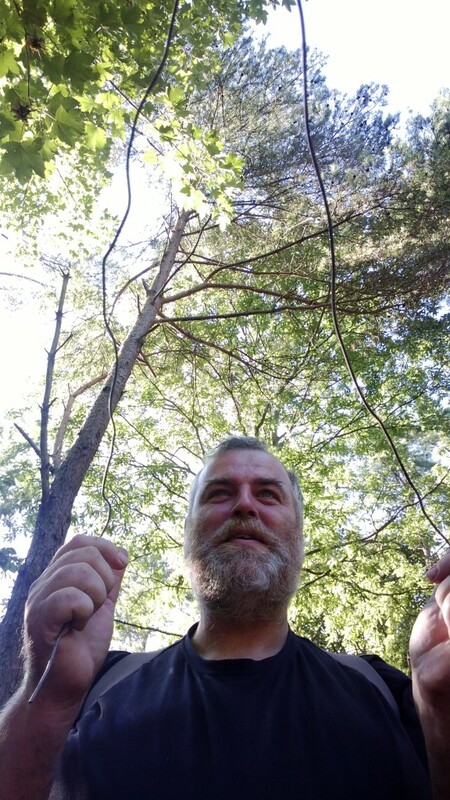 I was chatting with Perry Magee about some fire drill mechanisms he had and the conversation got onto water divining. 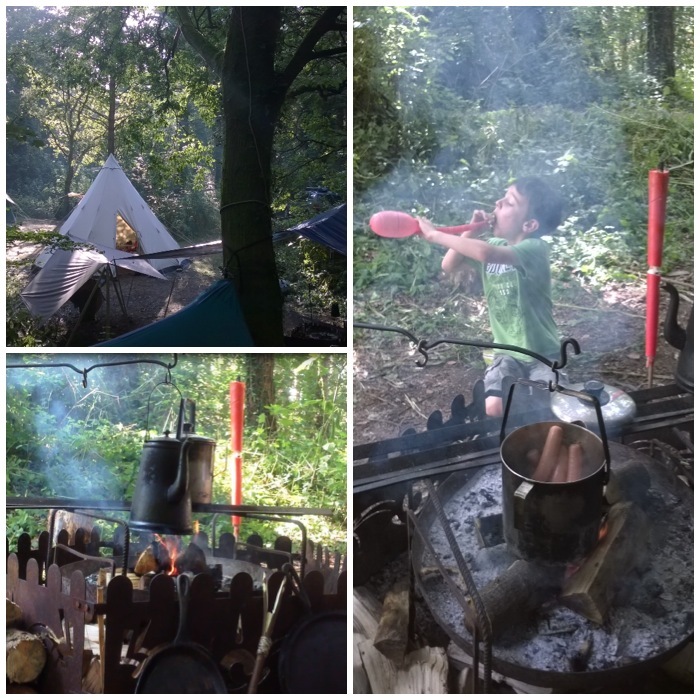 I was sceptical at first but after some expert and clear teaching from Perry we were off. 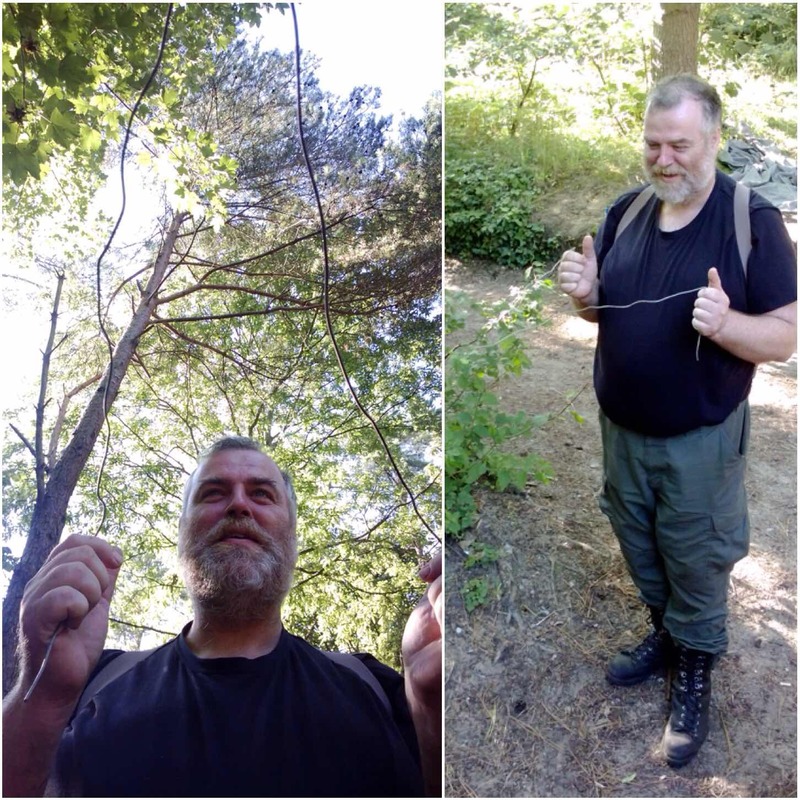 I found underground water, managed to follow a pipe and here Pete was trying to see if the rods would indicate human presence (me) and it worked. How it works no one knows, but it works. 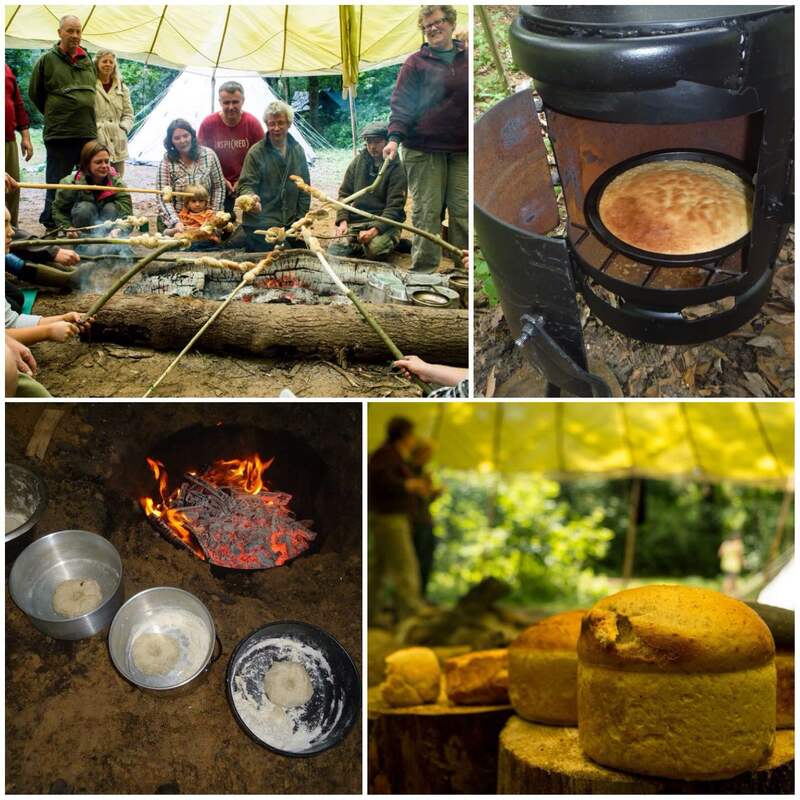 Fraser from Coastal Survival runs a few courses at the Moot and this one was on breadmaking. 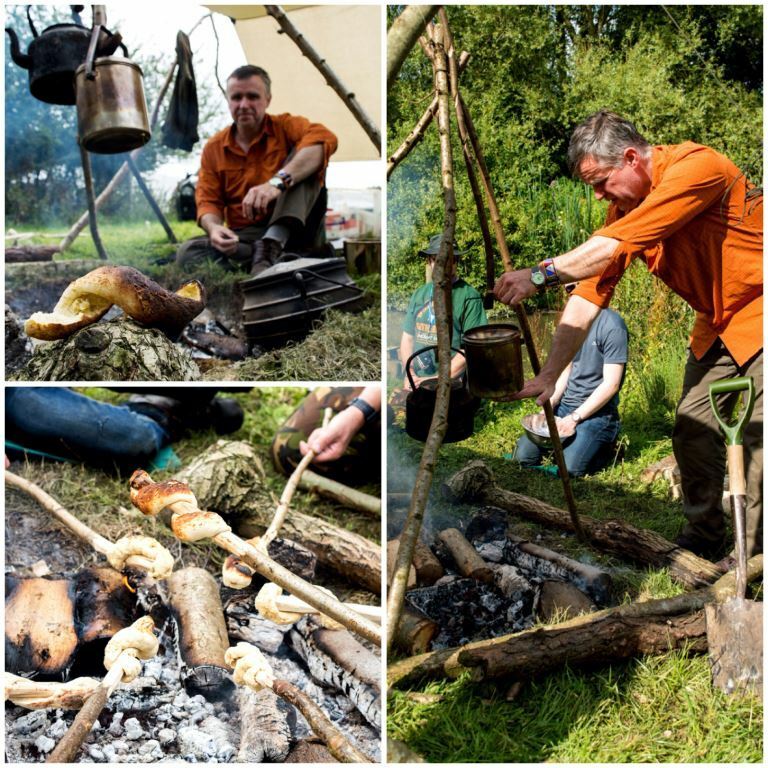 Fraser created a sand oven to cook some rolls in. I did not take part in the class but the ladies who did thoroughly enjoyed themselves. 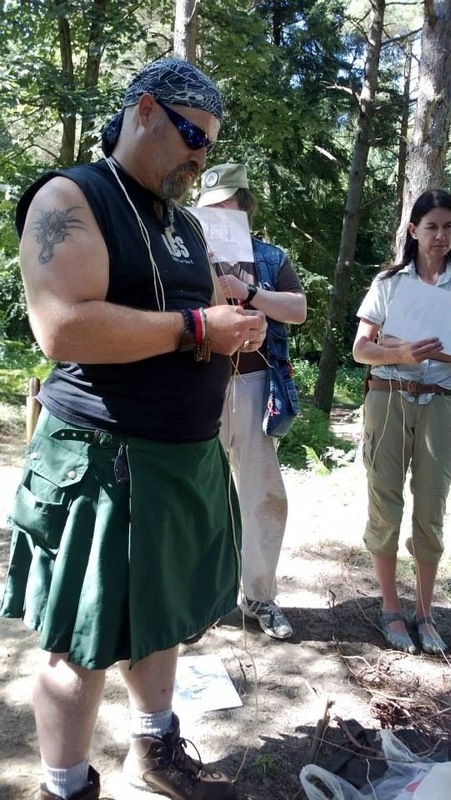 This was the fish hook carving class run by Steve Mesquite Harral – Paul Pomfrey (looking dashing in his utilikilt) was splitting down spruce root for the binding. 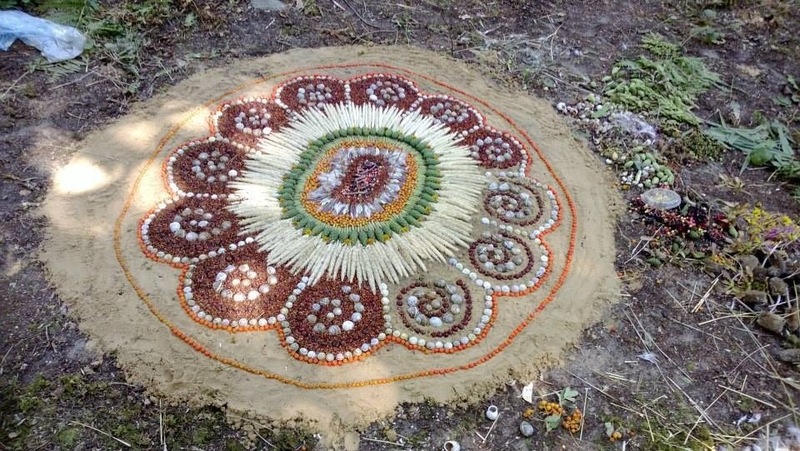 Some stunning artwork was seen in the woods. 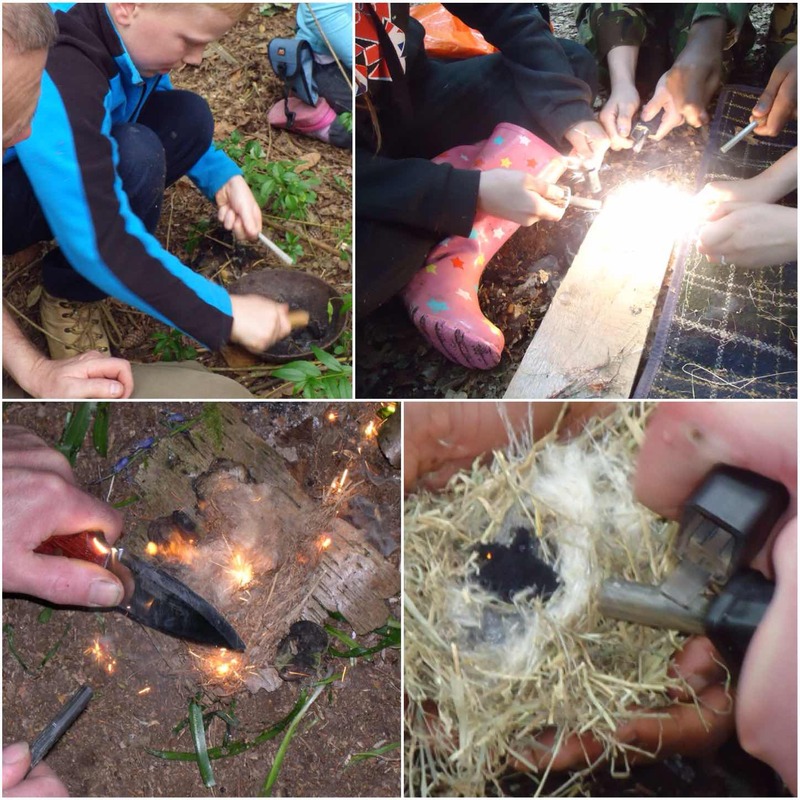 I cannot remember who produced this but it certainly inspired the kids to get out there and make their own woodland art. 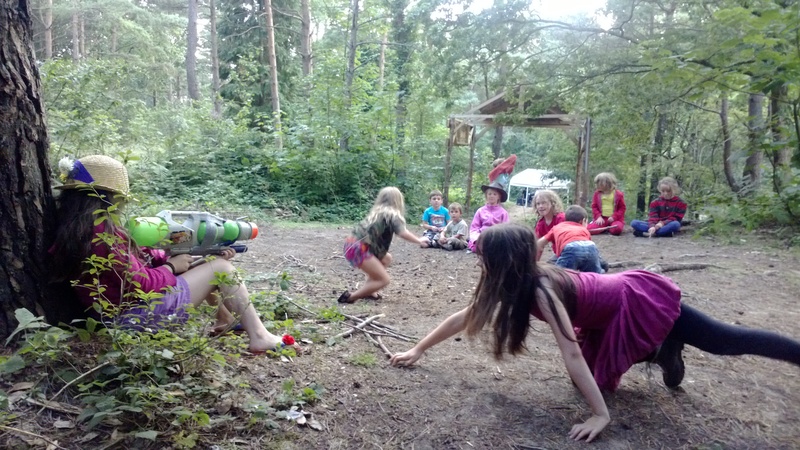 One type of game the kids love are the stalking games. I call this one the fox stalk and is just organised madness. 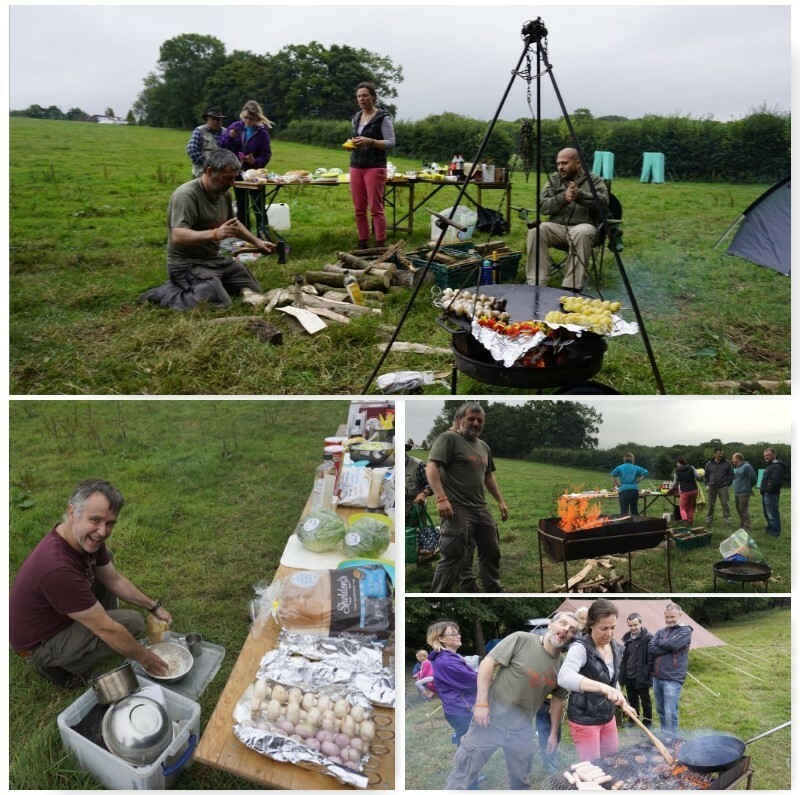 At the end of the Moot we always have a group dinner where everyone either cooks something for everyone or helps to organise it. 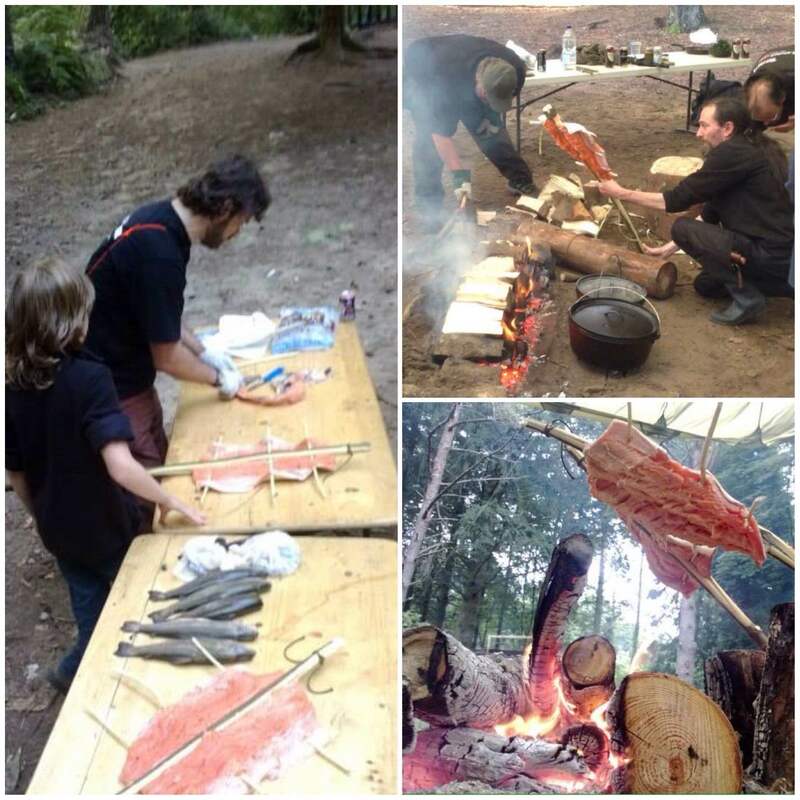 The ponnased salmon went down a treat. This year musical friends of the boss (Tony) agreed to come over and play for us. I think they were called the Merthyr Tydfill Country Band but were all based over in Nashville. Tony had just asked them on the off chance they would turn up and turn up in style they did. The generator we had blew the lights out if I remember rightly but we all still had a cracking time that evening, drinking, eating, dancing and listening to good music. After the main training days were over there were a few private courses run. 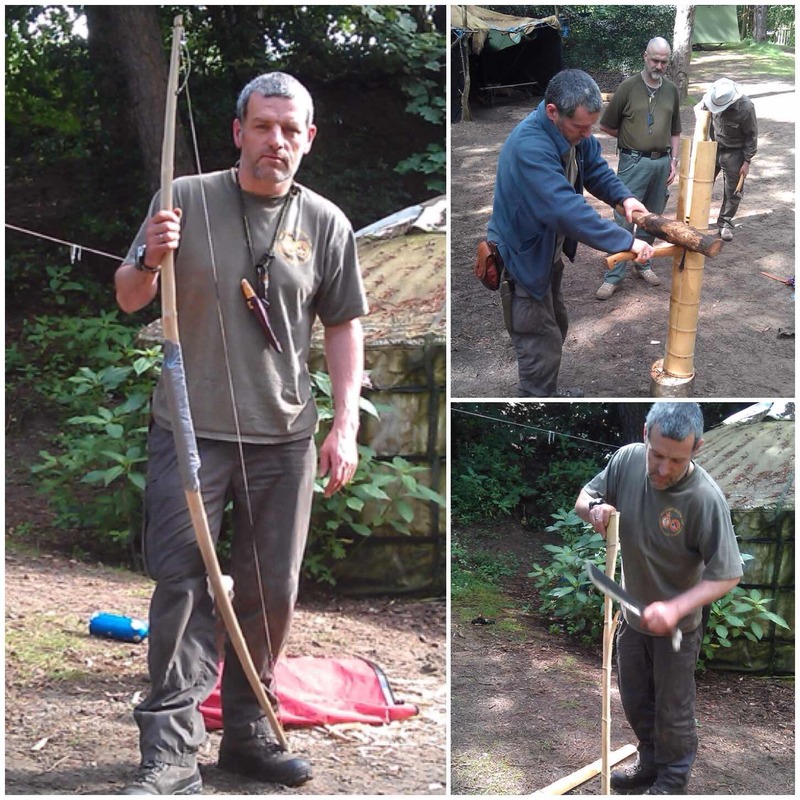 Here Wayne from Forest Knights was running a bow making course. I learnt to make a Bhutaneese bow with him the year before. 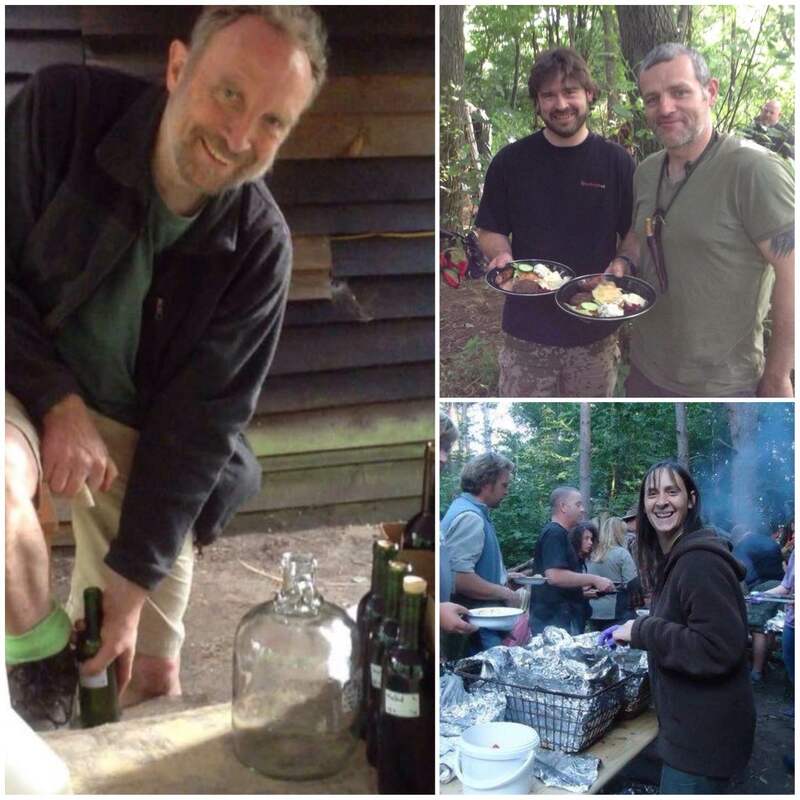 Everyone agreed that the 2013 Moot was dedicated to our friend Drew. 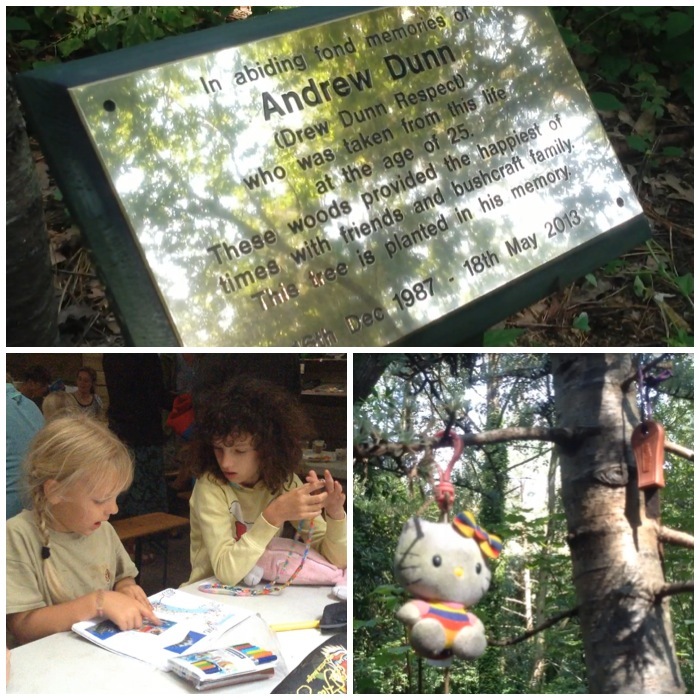 I do miss Drew but hope to see his parents, brother and sister at one of the Moots again sometime in the future.